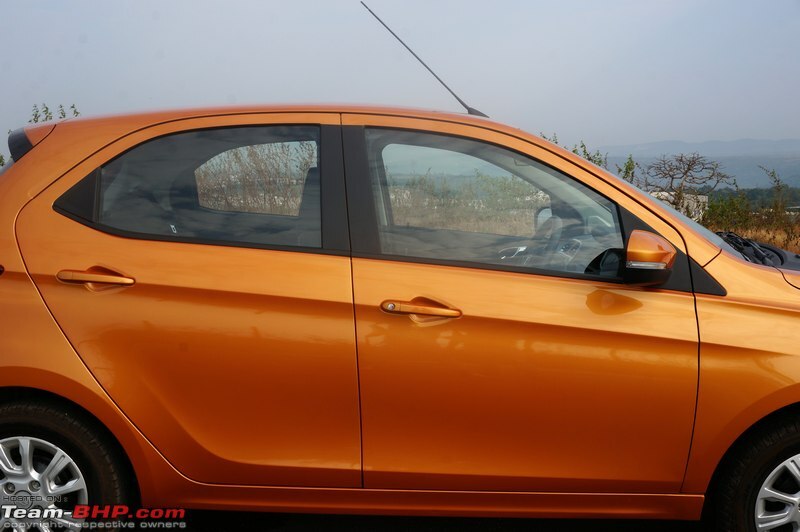 The Tata Tiago has been launched in India at a price of between Rs. 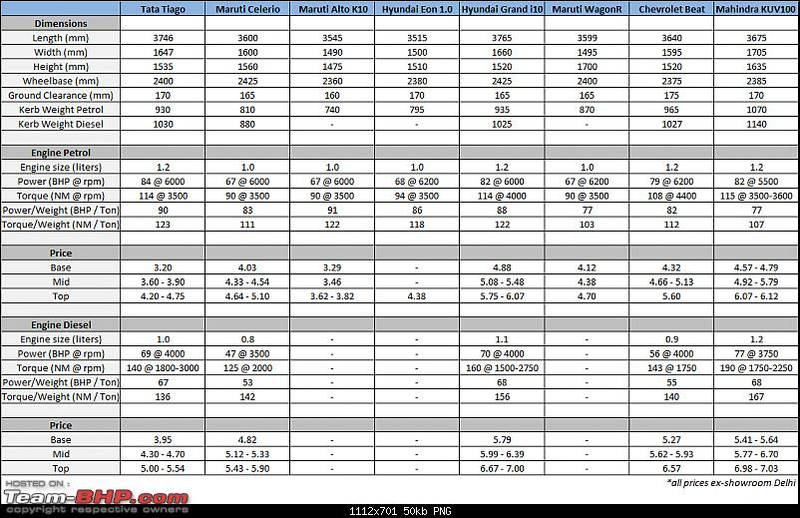 3.20 - 5.54 lakhs (ex-Delhi). • Great styling. A very chic-looking hatchback at a value-for-money price! This review has been jointly compiled with Vid6639. Thanks to him for the expert observations & photography! 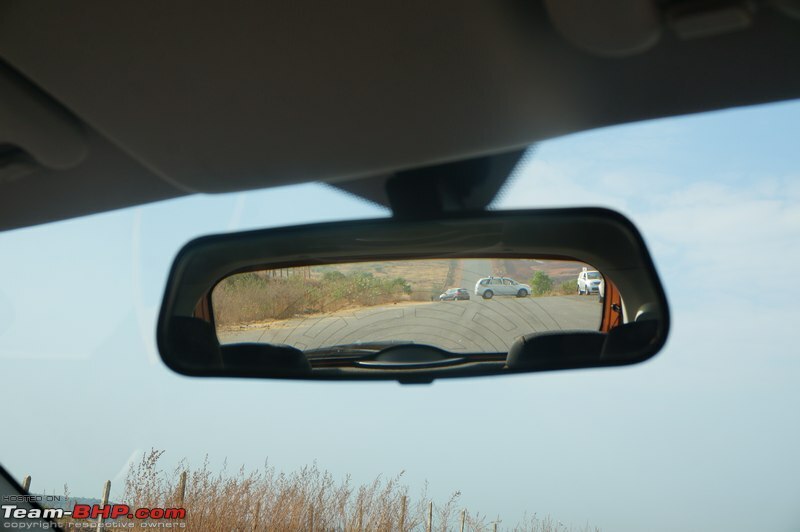 Back in the days, the Indica and Indigo were cars that India had accepted with open arms. These models offered the most bang-for-the-buck and truly lived up to the 'more car per car' tagline. But it wasn't all rainbows and butterflies for car owners. Tata's quality & reliability were poor, while the incompetent support network didn't help much either. 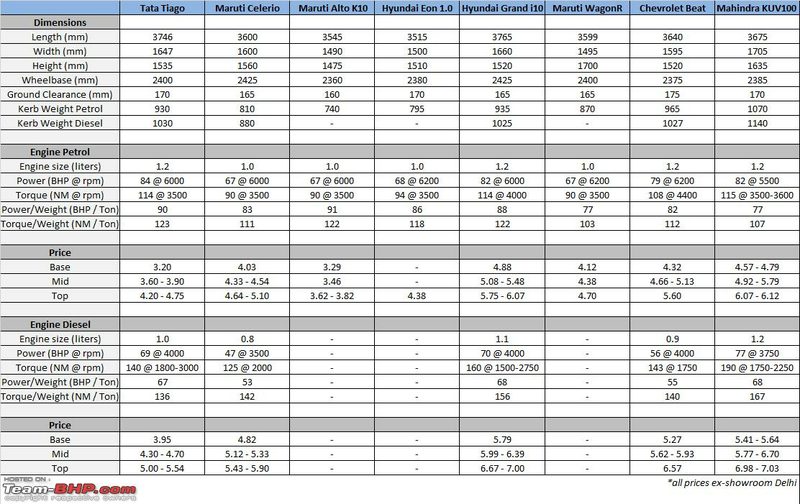 With time, Tata lost its 'diesel + space + value-based pricing' USP too, as nearly all manufacturers (including Maruti) brought diesels to the lower segments. 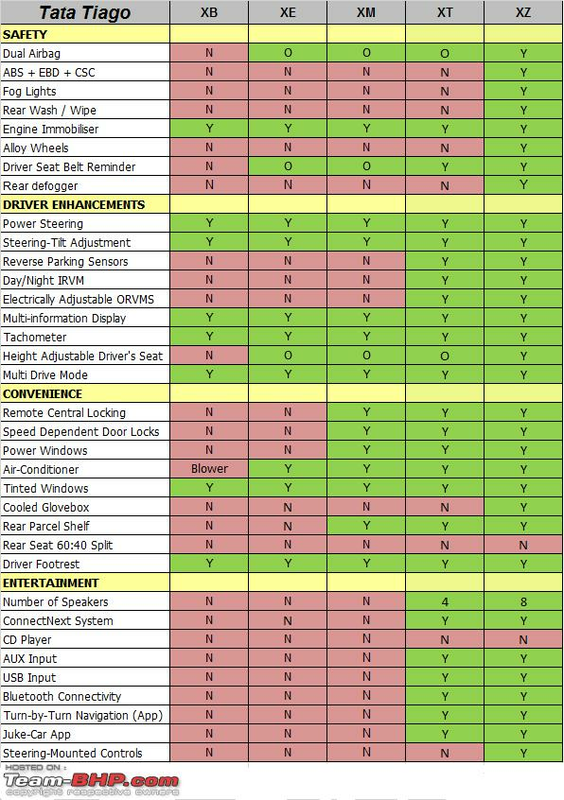 Even fleet owners - once a strong customer base for Tata - now have so many options to choose from. 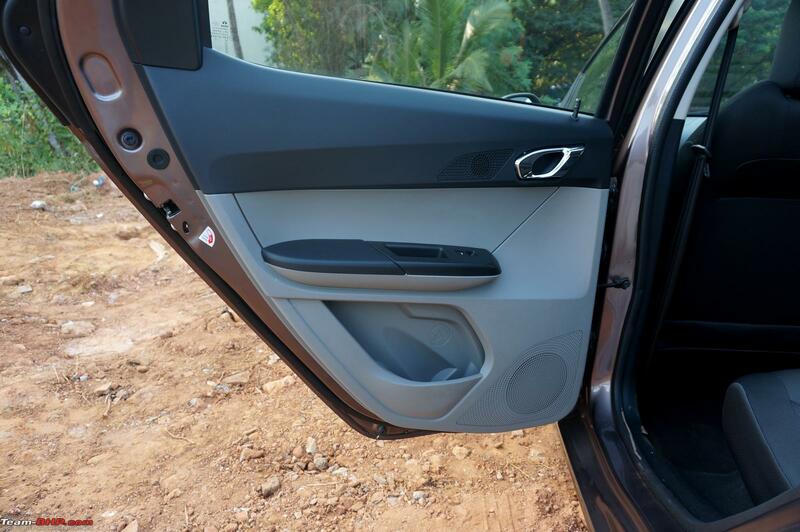 In his relentless pursuit to regain the trust of Indian car buyers and attract footfalls to his showrooms, Karl Slym came up with the Horizonext strategy. It stands on a four-fold program of intense customer focus, world-class manufacturing practices, enriched customer purchase experiences and consistent quality of service. Not only that, each year, the company promises to roll out new models & update its existing range. Now, it seems to have a clearly defined long-term plan. Still, the poor sales performance of the Zest & Bolt has shown Tata that a lot of work is yet to be done. 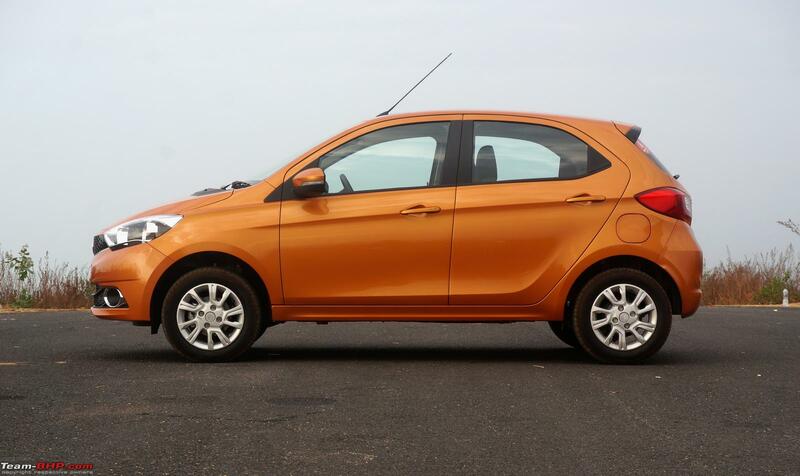 Tata Motors has gone all-out with this new mass market car. 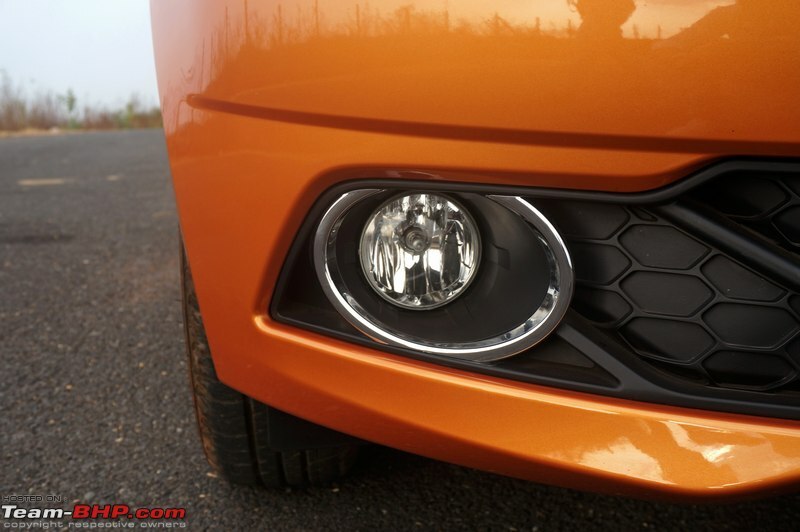 The new hatchback will be positioned below the Bolt, and is named 'Zica' - which stands for 'Zippy Car'. It's quite similar to how they derived the name Indica from 'India Car'. To clear the confusion, it is pronounced as Zee | Kaa (listen to it). Tata has been battling with Toyota for the number 5 spot in the Indian market, commanding a market share of 4.50% (as on November 2015). 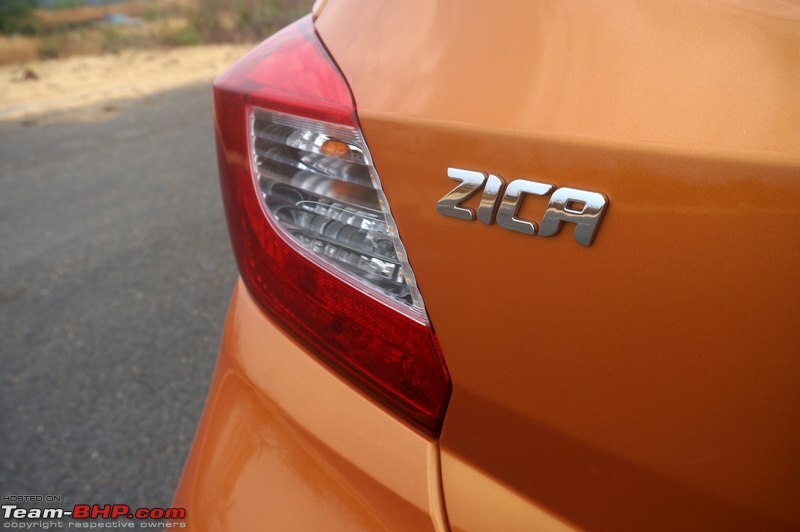 The company hopes that once the Zica goes on sale, their market share will increase and they move higher up the ranks. The Zica will roll out from the Sanand, Gujarat plant which is grossly under-utilized currently (it was originally built for the Nano). The production capacity of the Sanand factory is 2.5 lakh units annually, but its utilized capacity is <10%. 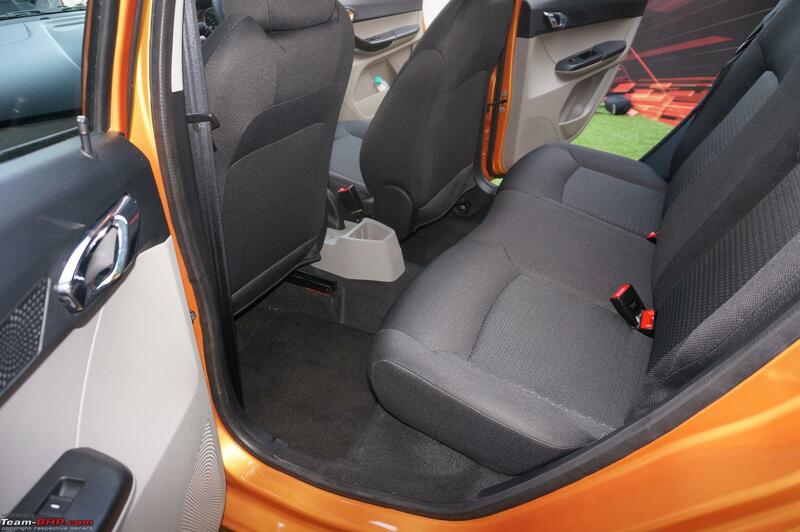 The production capacity for the Zica is 1.5 lakh units. 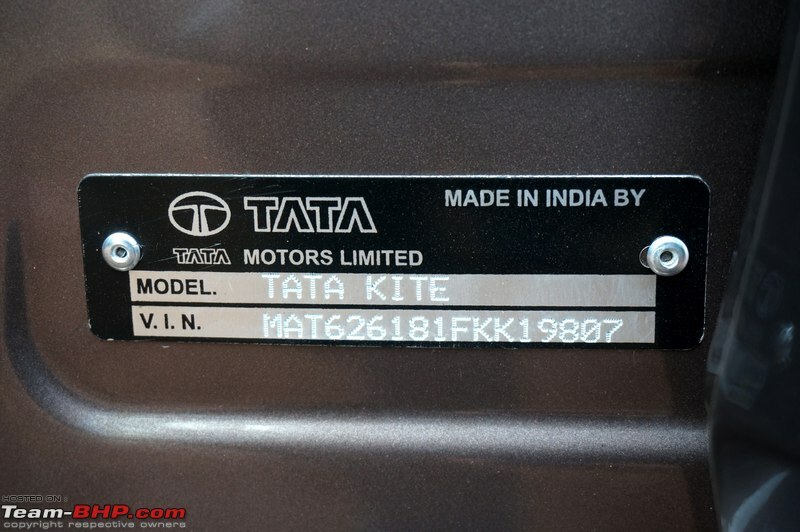 The Kite (codename for the Zica) has been one of the fastest projects that the Tata design & engineering team have worked on. It took only 3 years from ideation to execution and the result is what we have here today. 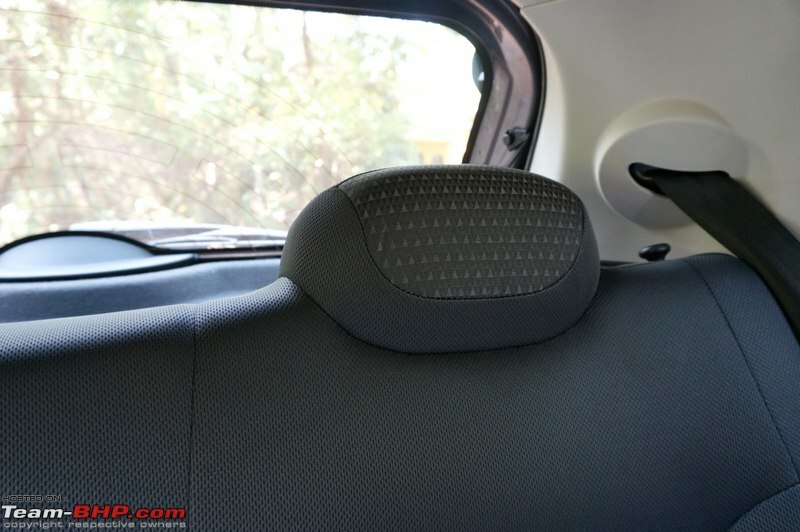 The car has been jointly designed by Tata's Pune, UK and Italy design studios and wears an all-new design language. 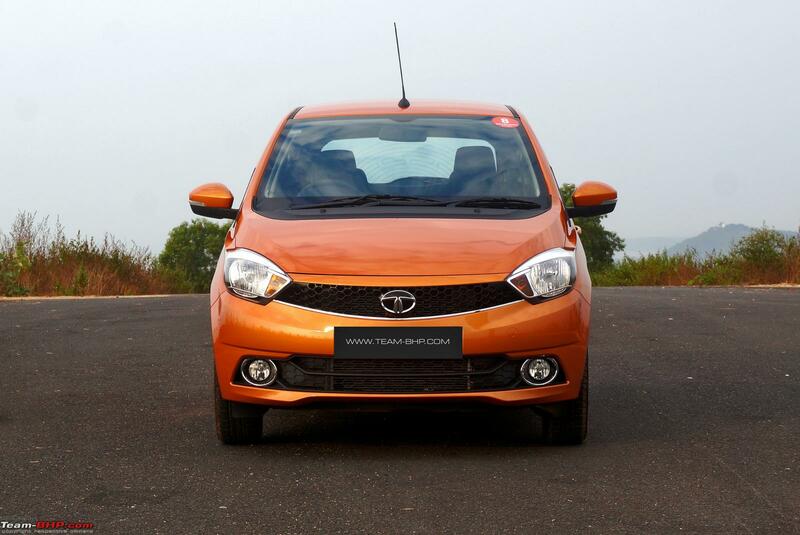 We're glad that Tata has finally gotten over that age-old Indica shape. Not that it was ugly, but the design has gotten too long in the tooth. 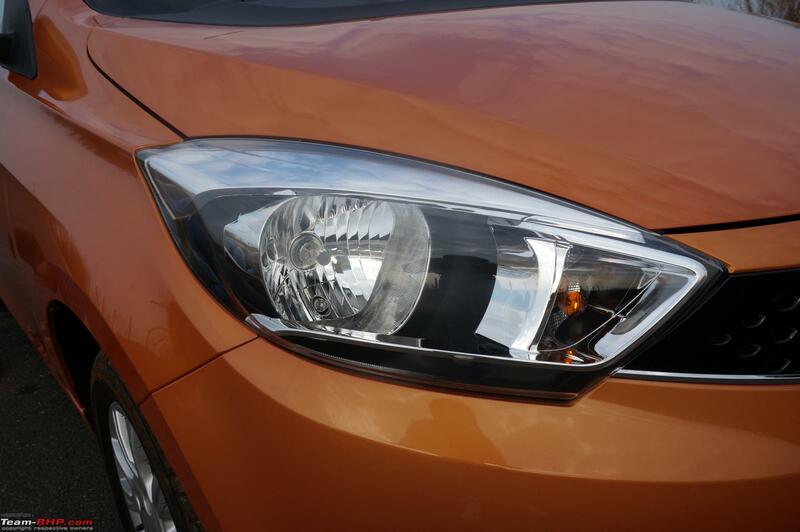 Simply put, the Zica is different. It looks refreshing and has a very European design that will please all. 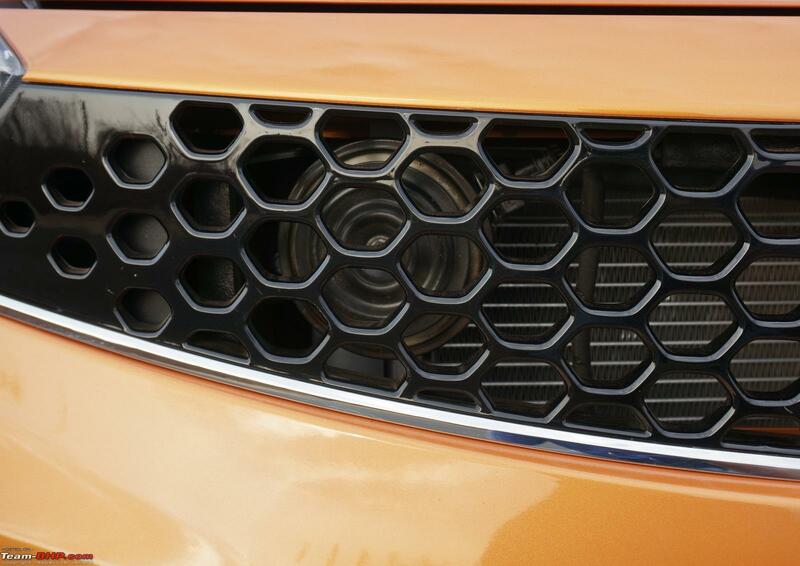 However, look closely and the smiling grill with the humanity line is typical of new-gen Tata cars. 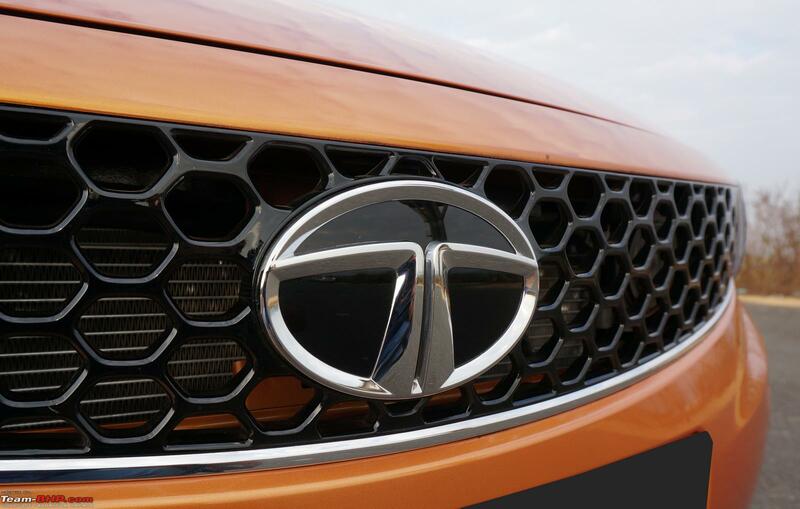 This is the first model to wear the new three-dimensional 'T' logo, which will eventually make its way on other Tatas. Its wheel : body ratio is a lot lesser, making the design appear more proportionate this time around...very unlike the Vista which had a large body & small rims. 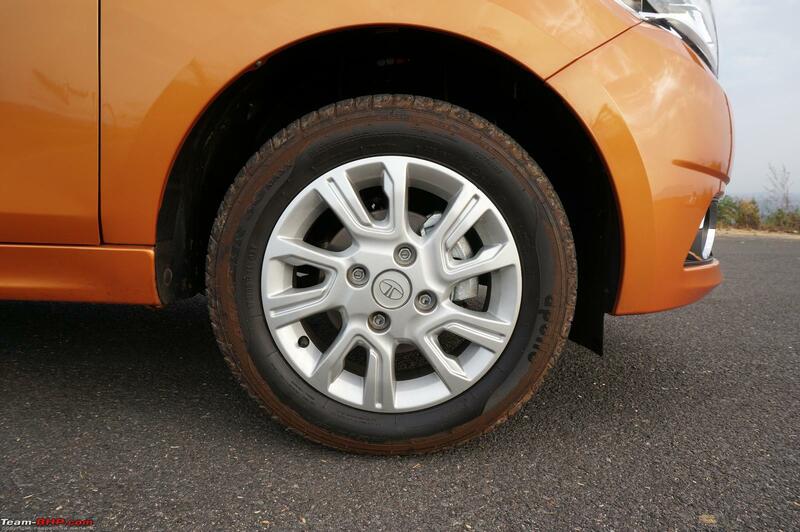 The 14" alloy wheels carry a neutral design & most people will like them. 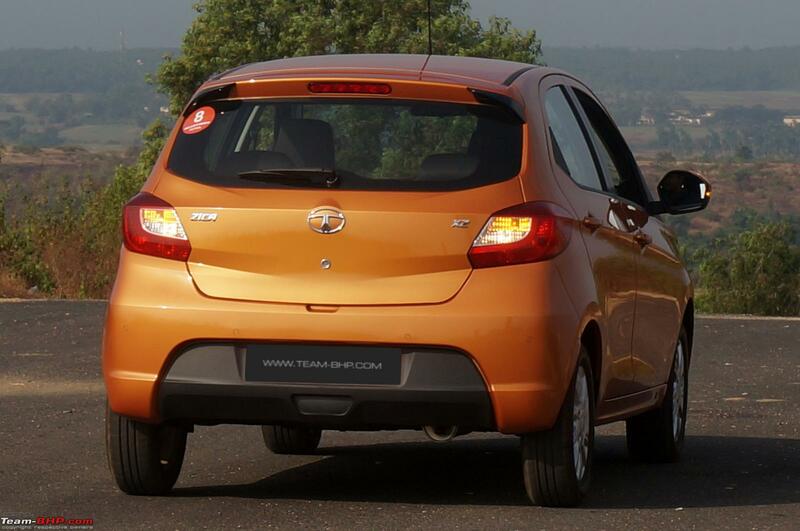 The overall stance of the car is squat and a far cry from other Tata cars. 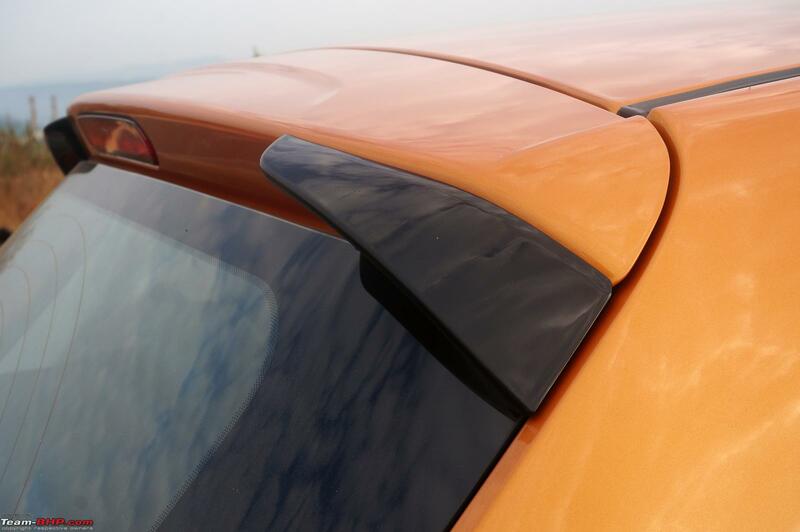 At the rear, it gets an integrated spoiler which is a part of the tailgate. Nowhere on the Zica will you find an engine badge. 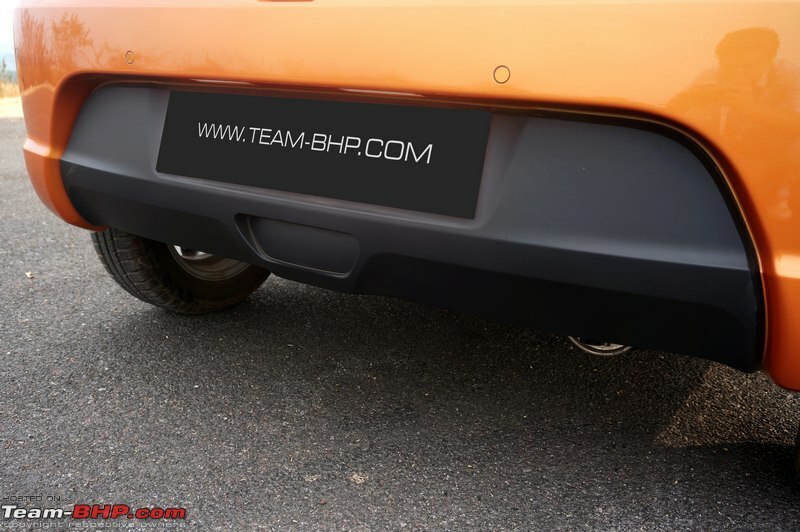 The tailgate looks clutter-free as it only wears the brand name on the left and the variant name on the right. 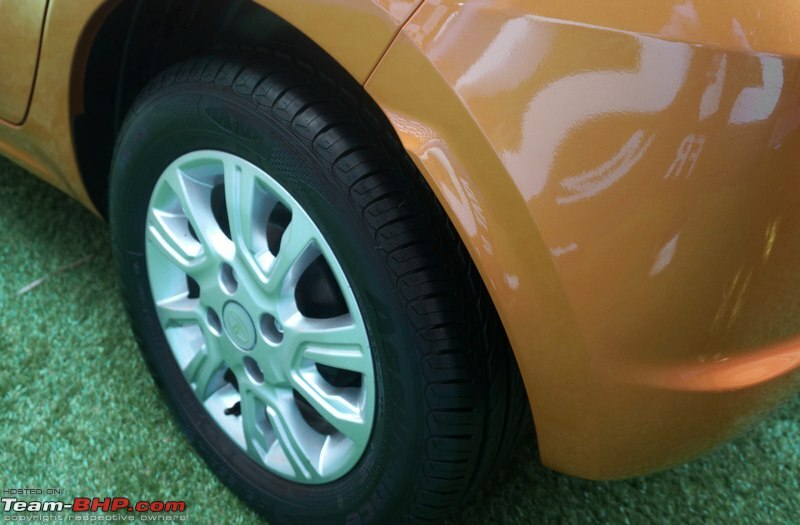 The Zica measures 3,746 mm in length, 1,647 mm in width, 1,535 mm in height and has a 2,400 mm wheelbase. 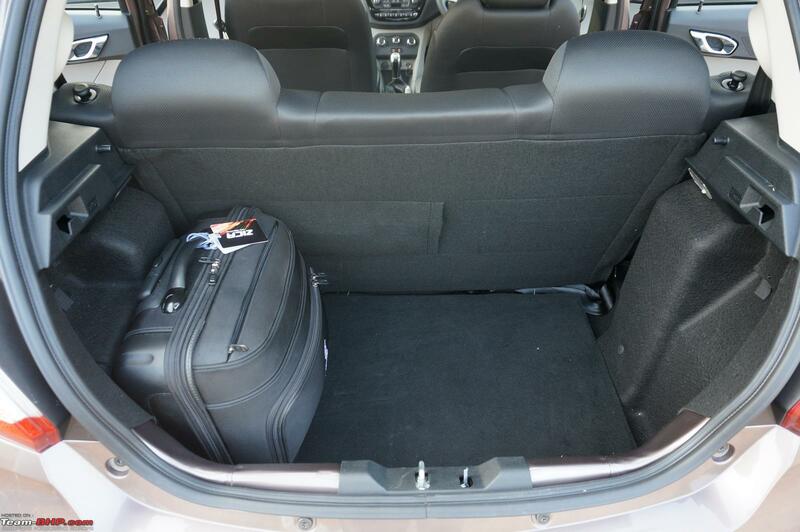 Dimensionally, it sits right between the Celerio and Grand i10. 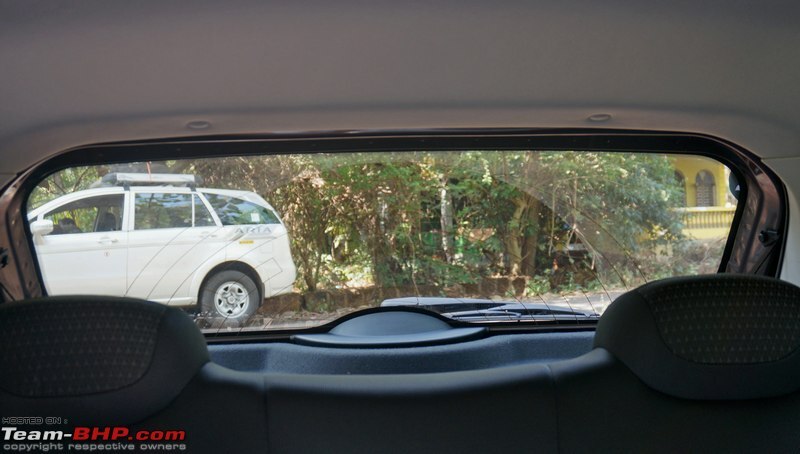 It has the shortest wheelbase compared to the two and, interestingly, the wheelbase is identical to the Indica! 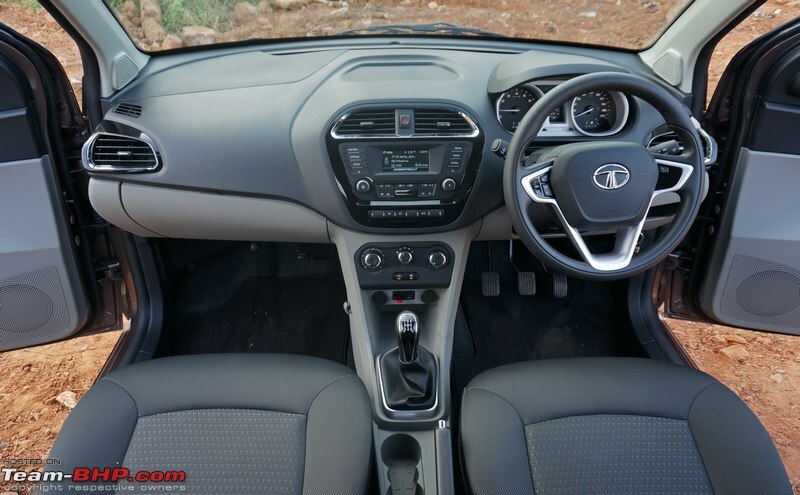 Tata insists that this is an "all-new" platform, but we've heard that the floorpan is the same as the ol' Indica's. Heavily reworked, of course. Paint quality is decent for the segment, although I did feel that the rich lustre of the Zest & Bolt was missing. 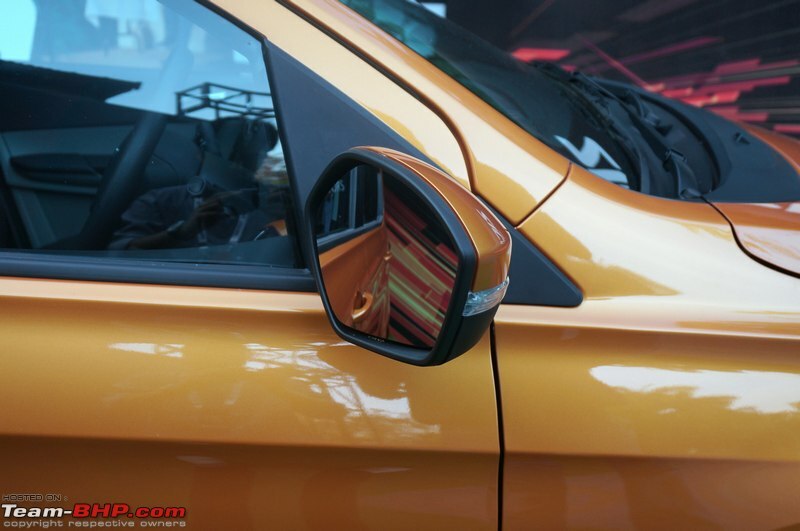 This is probably because the Zica is priced lower and painted in a different booth. 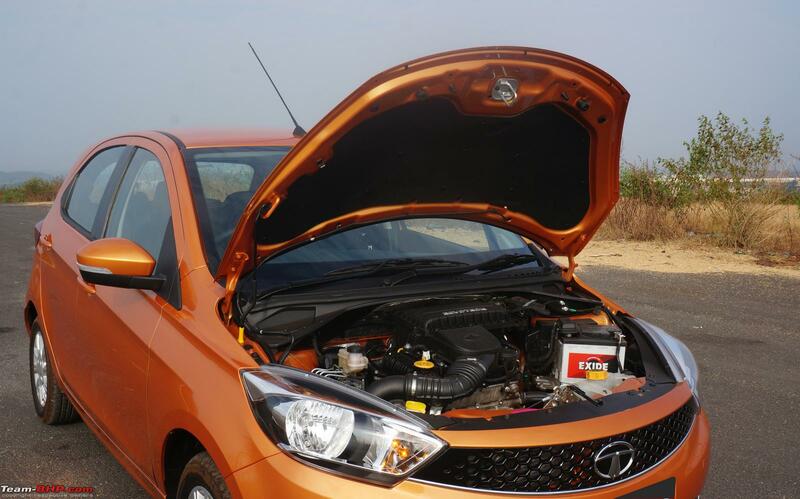 Remember, the Zest & Bolt are manufactured at Tata's facilities at Ranjangaon & Pimpri respectively. The car feels solidly built. 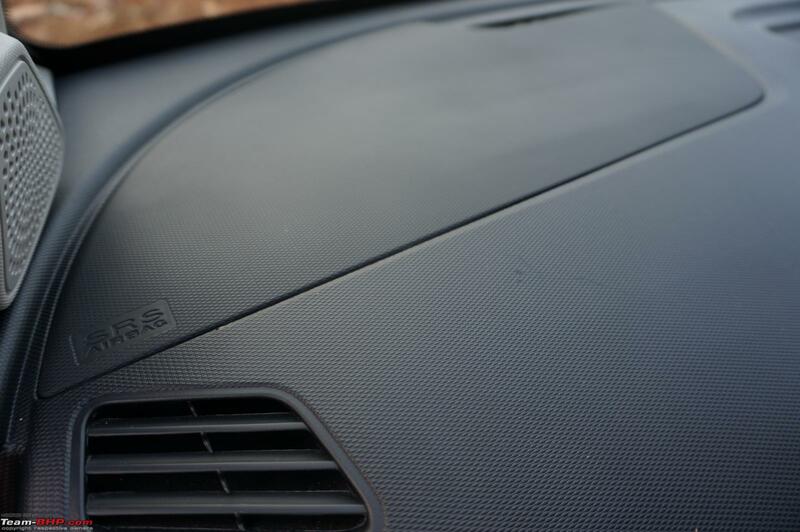 On conducting a 'tapping' test, we concluded that the body panels don't feel hollow or thin. Panel gaps & shut-lines are something that Tata seems to have worked on. They are mostly consistent, except around the bonnet & tailgate. 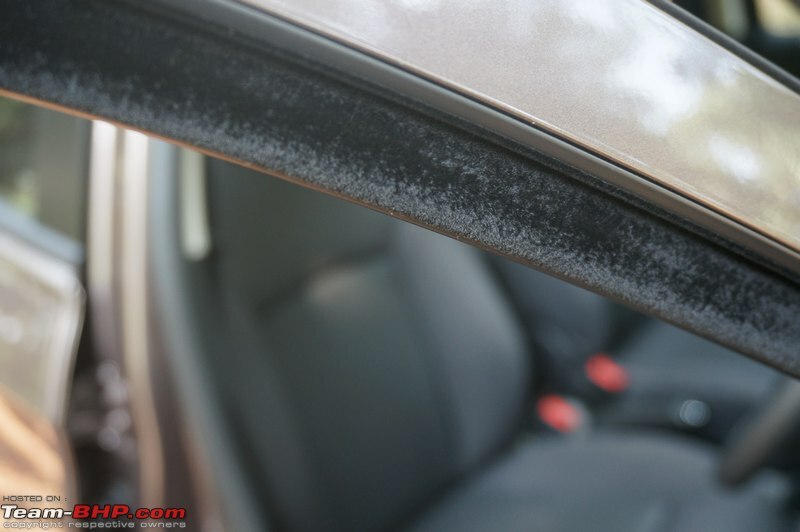 On a related note, I must mention that some of the door beading looked poorly finished. 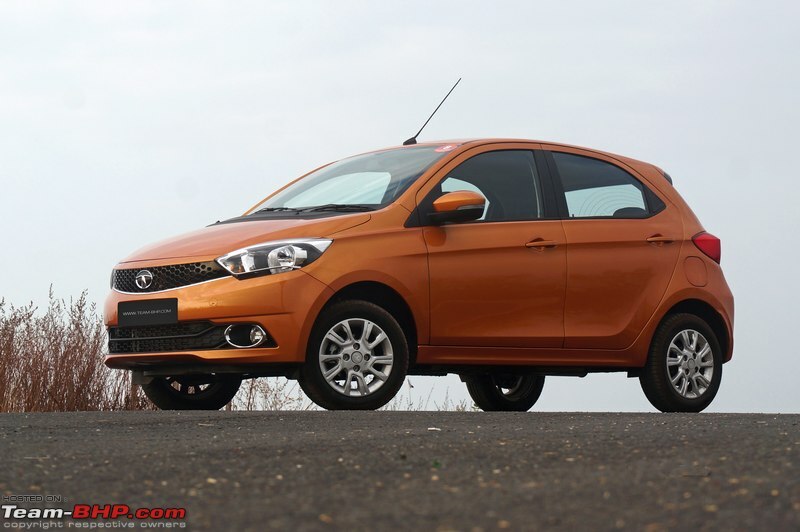 Tata engineers claim that the Zica will pass the BNVSAP. 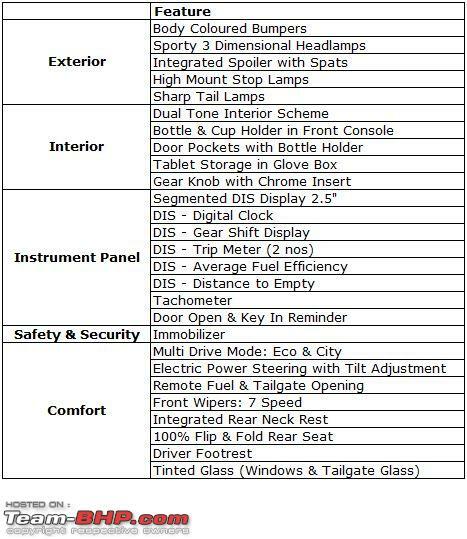 In terms of safety kit, it gets dual front airbags and the 9th generation Bosch ABS + EBD + Cornering Stability Control (same as the Bolt). 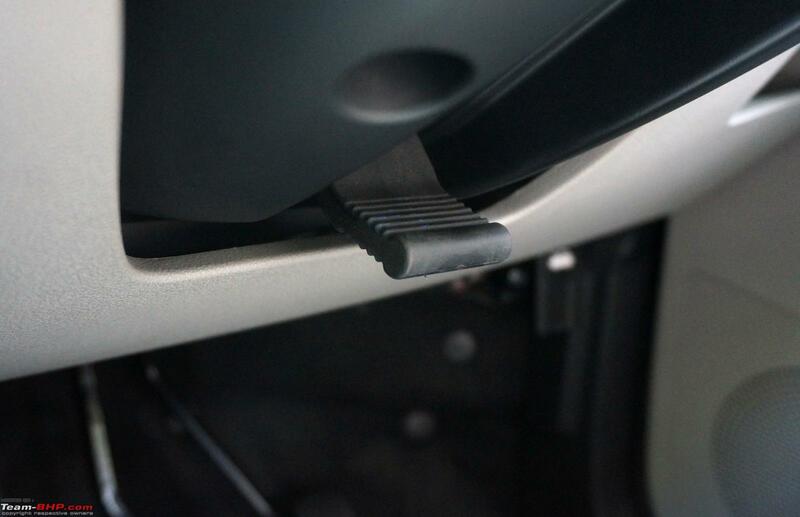 Tata says "CSC supports / stabilizes the vehicle during partial braking in curves by reducing pressure at the required inner wheel. 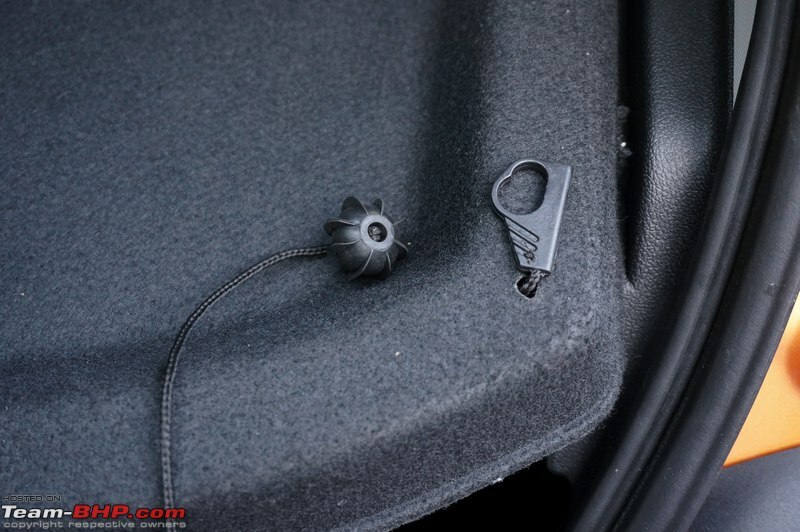 This helps to reduce the probability of vehicle oversteer during cornering". Face has a very cutesy appeal & this car has its own unique identity. 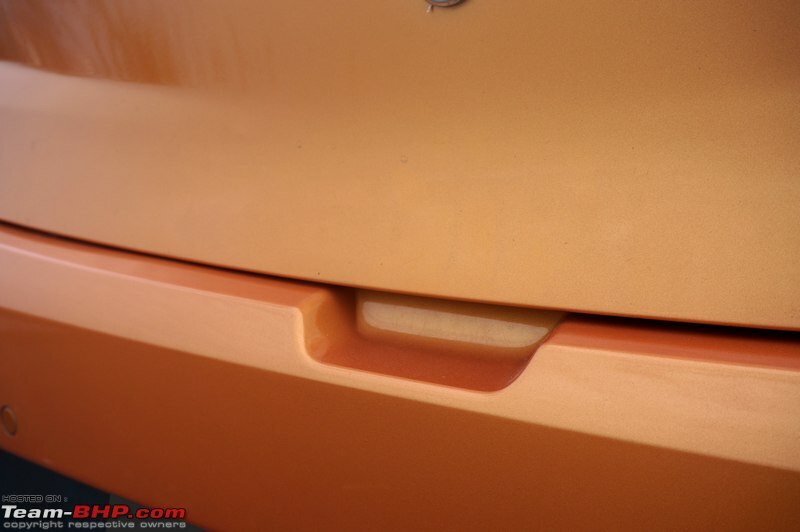 Grille has a more confident smile now, don't you think? To a layman, the rear could be mistaken for the Figo (at least at first sight). Look closely and there is enough to differentiate the two (similar story like the City & Ciaz). Don't miss the 4 parking sensors! Character lines on the side smartly work with the body paint and act as shadow lines (eliminating the need for black side strips to break the monotone). This Sunburst Orange is one of the four new body colours. Car looks chic! Last edited by GTO : 11th April 2016 at 15:35. The Zica isn't a car that you'll walk into, due to its low stance. 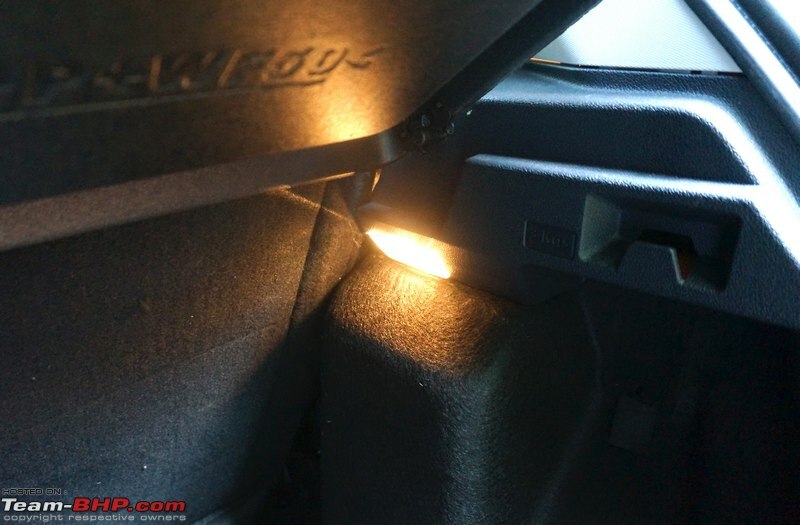 Ingress & egress aren't as easy as a Wagon R, Ritz or even the Bolt. Still, the doors open wide and help with getting in & out. The doors close with a solid thunk. 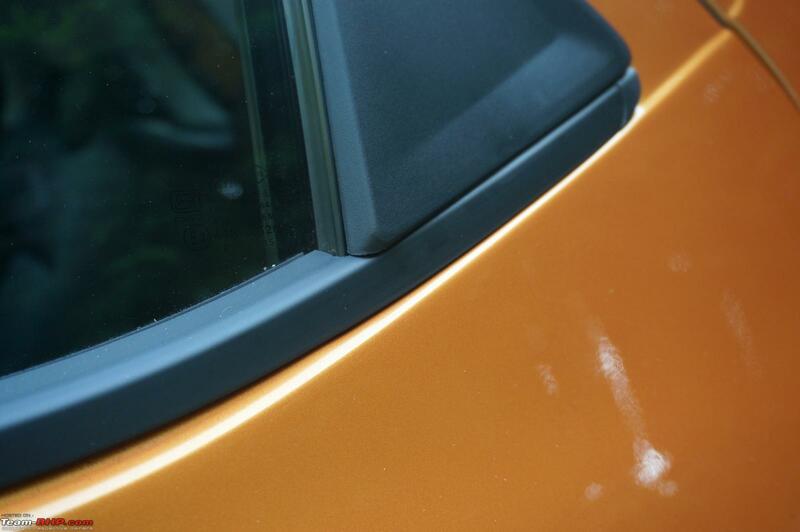 It isn't a European thud, yet the sound reassures you that the Zica isn't a tinny car. The interiors sport a black & grey theme; Tata has ditched beige. We've been seeing a lot of manufacturers follow this trend lately. 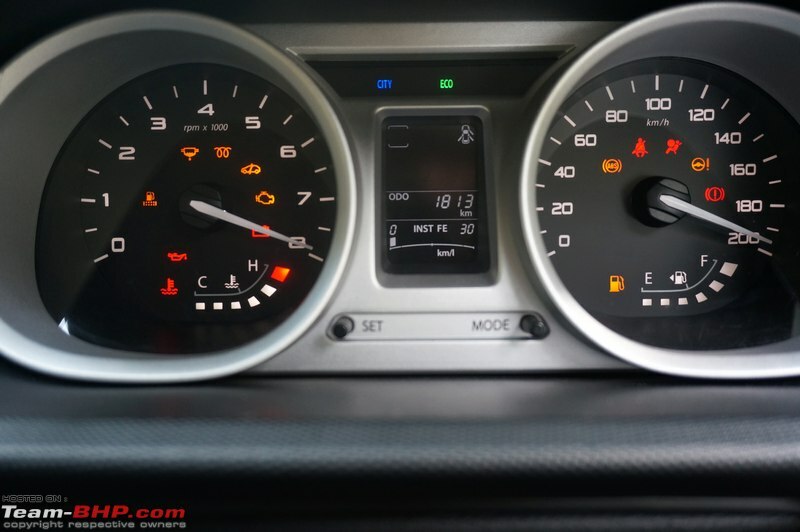 The design of the dashboard is simple yet attractive. You can't help but identify parts from other Tata cars - part sharing is generous. 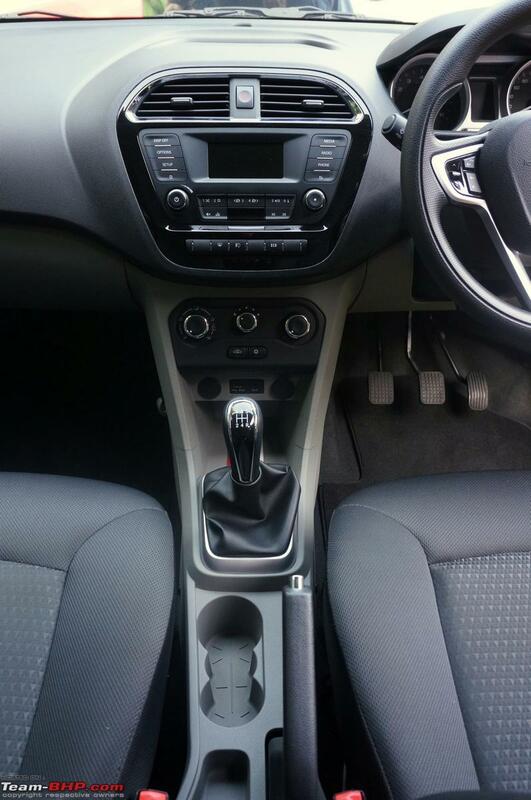 The steering wheel, control stalks, gear lever, window switches etc. are all picked up from its siblings, which isn't necessarily a bad thing. 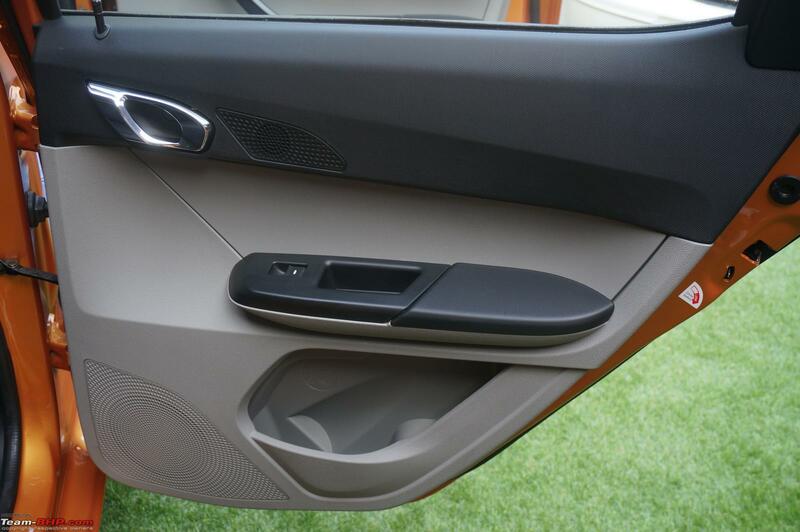 Tata's designers have tastefully used chrome and gloss black finishes in many areas to make the cabin a nicer place to be in. What strikes you first is the quality of materials. The top half of the dashboard and doorpad feels very good. 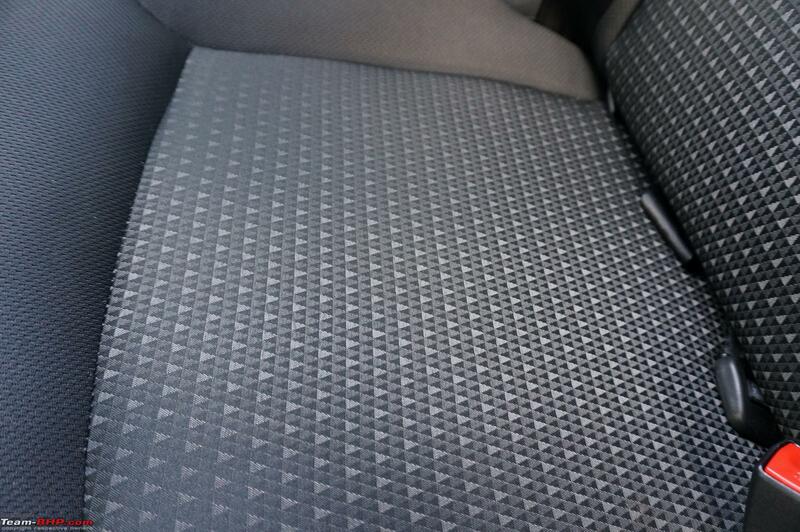 Even the texture design gives an upmarket feel. It definitely feels premium for a car of this segment! 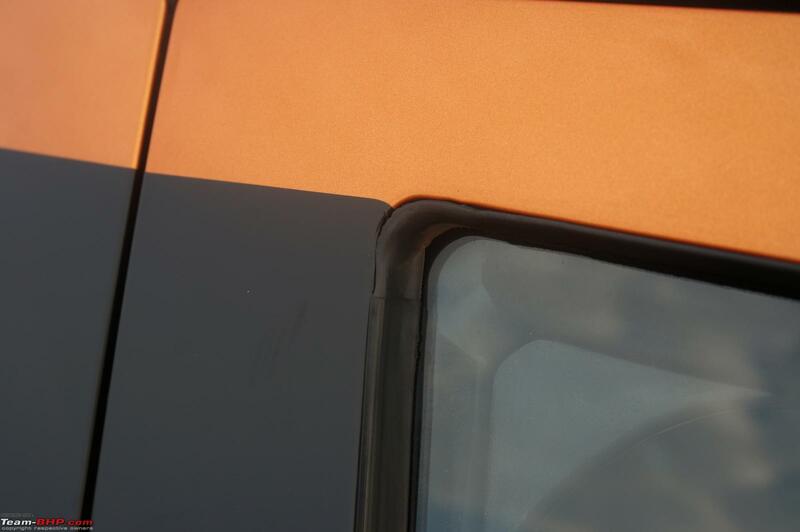 Zica owners will be very pleased with the quality. 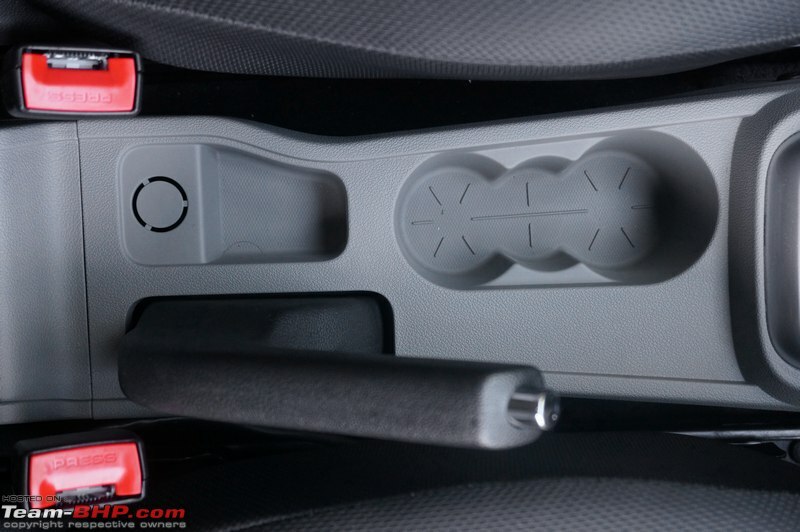 Still, I'd have liked some tactile feel from the switchgear. 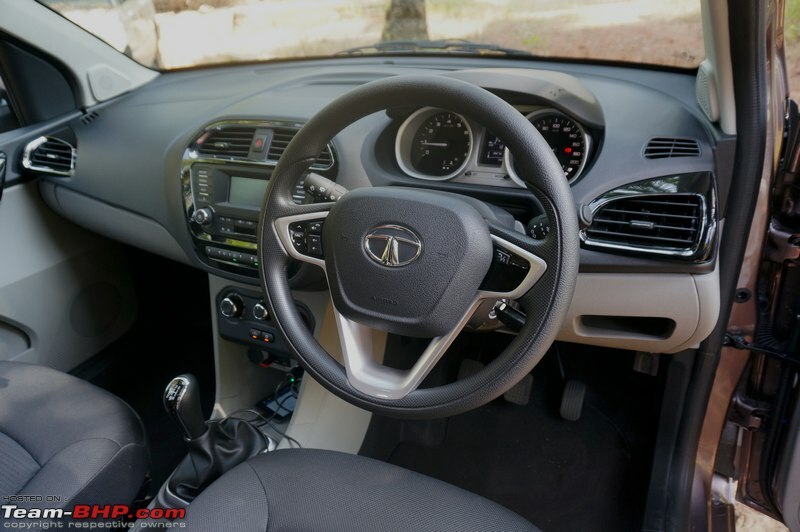 While Tata's efforts are evident in terms of design and fit & finish, it still lacks that finesse of a Hyundai interior. I loved the fact that these interiors have several small touches which owners may not notice on a short test drive...but they will surely appreciate these after years of ownership. 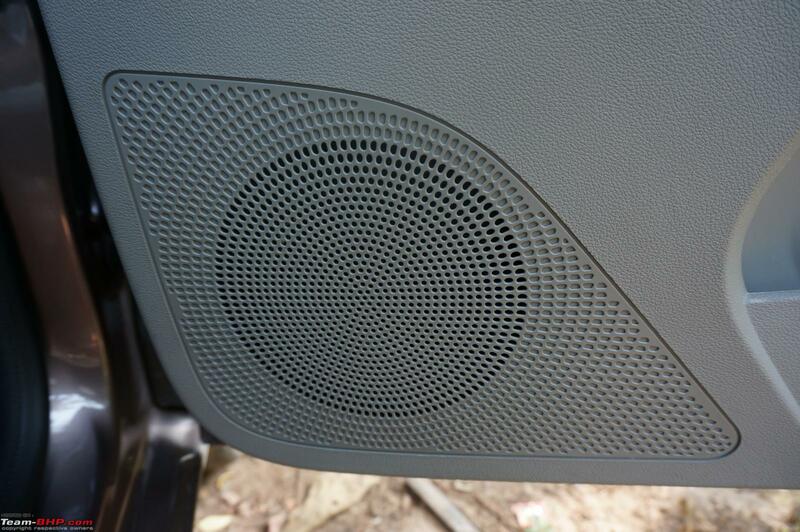 For instance, the speaker / tweeter grill has a unique design with circles growing in diameter with each concentric ring. 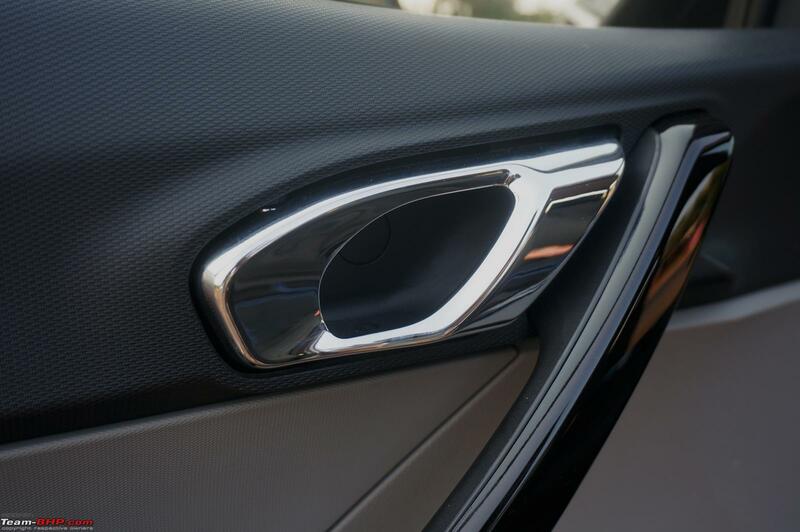 The inside door handles have a rubber damping so that owners don't get a plasticky sound when it's pulled and let go. 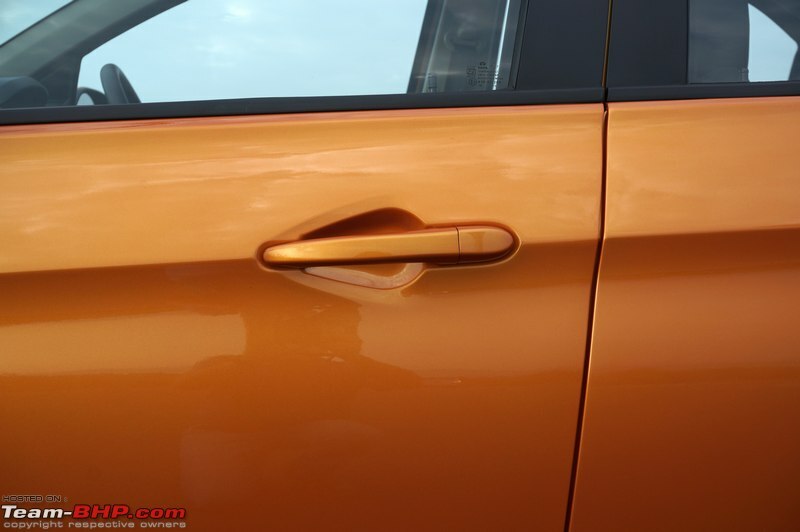 Speaking of door handles, these look very nice. They're plastic and possibly cubic printed for that chrome finish. 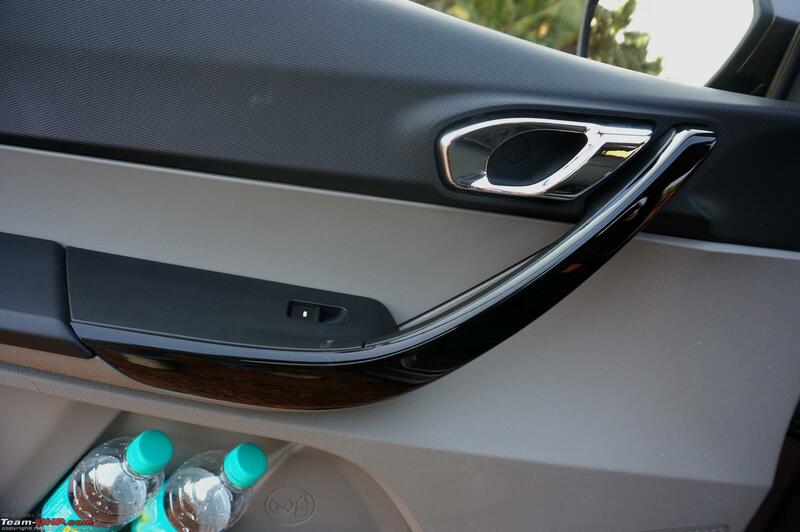 Both sunvisors have a vanity mirror each, there's a luggage hook to the left of the centre console (passenger footwell) and the MID tells you exactly which door is open. Then, there are lane changing indicators, illuminated power window switches on all doors, a white LED centrally-located cabin lamp & more. 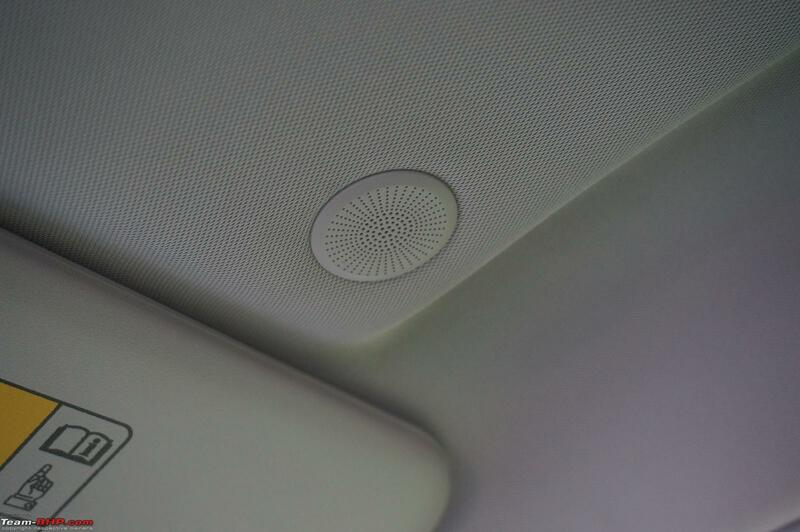 Look up and you'll see a very premium roof liner. These are the little things that add to a 'feel good' experience. The driver's seat can be adjusted for height and it offers a healthy range too. 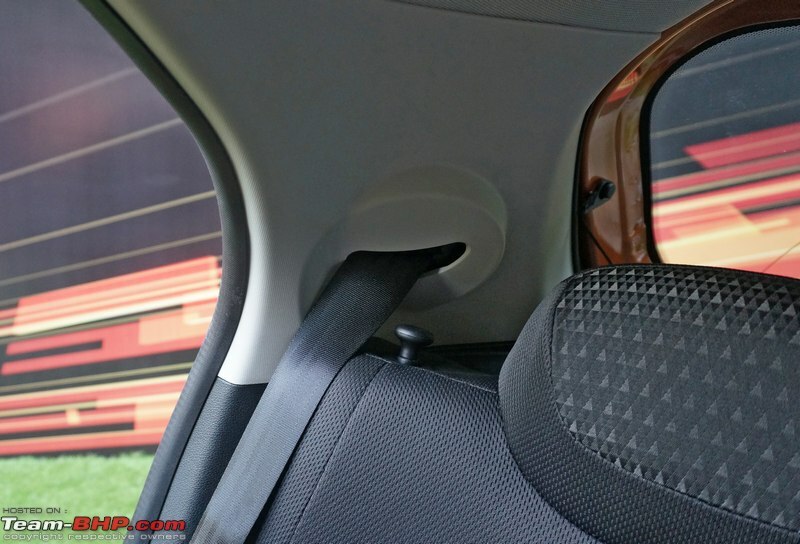 The passenger seat is fixed at the highest seating position, thus if the driver seat is positioned low, the front passenger can literally watch over the driver. 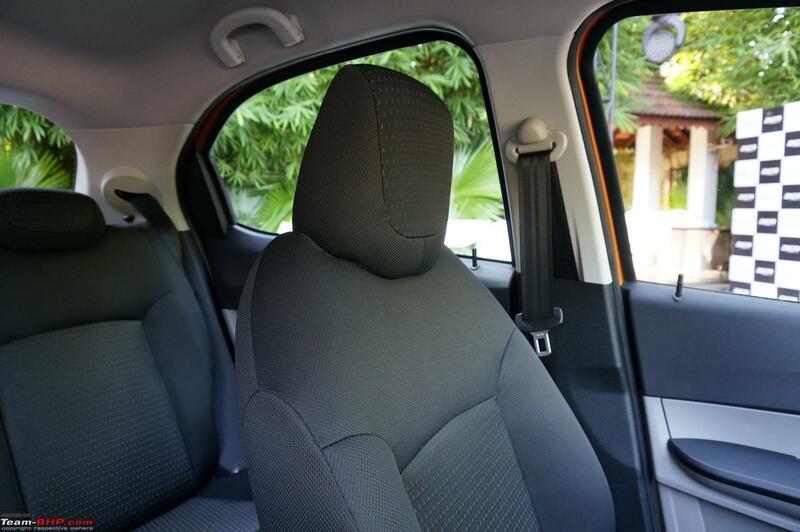 The front seats offer good support, both - lateral as well as under-thigh, for a person of a medium build and height. 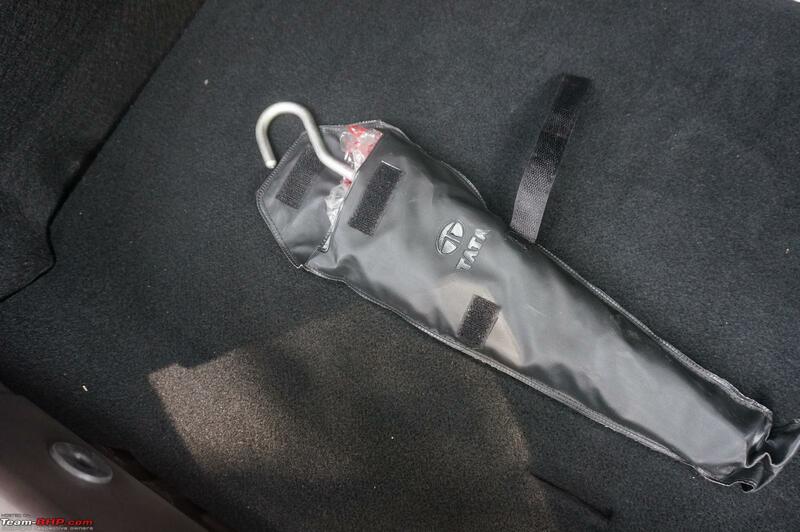 However, Vid6639 (6.0 ft) felt the need for additional shoulder and under-thigh support. Even the seat cushion is on the softer side and you tend to sink into them. It must be mentioned that soft seats aren't supportive over long distances. Unlike its competitors, the headrests of this car are adjustable, even though they look like they're integrated into the seat. 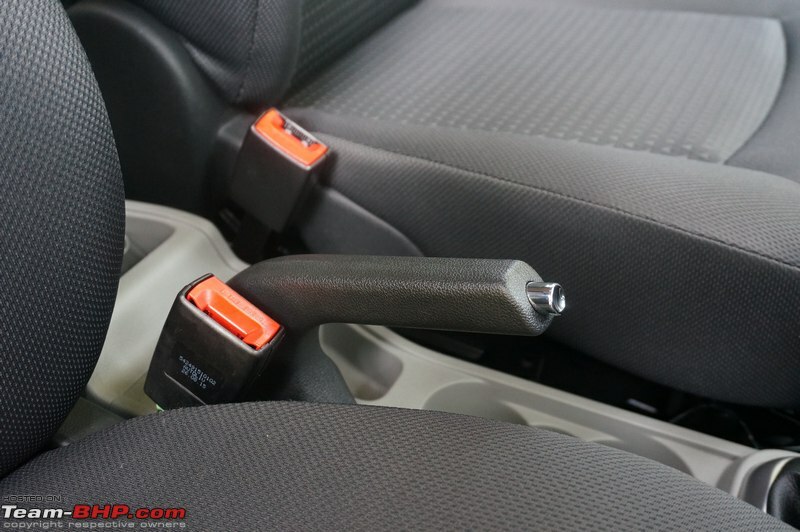 The steering wheel has been directly lifted off from the Bolt / Zest and offers tilt adjustment. 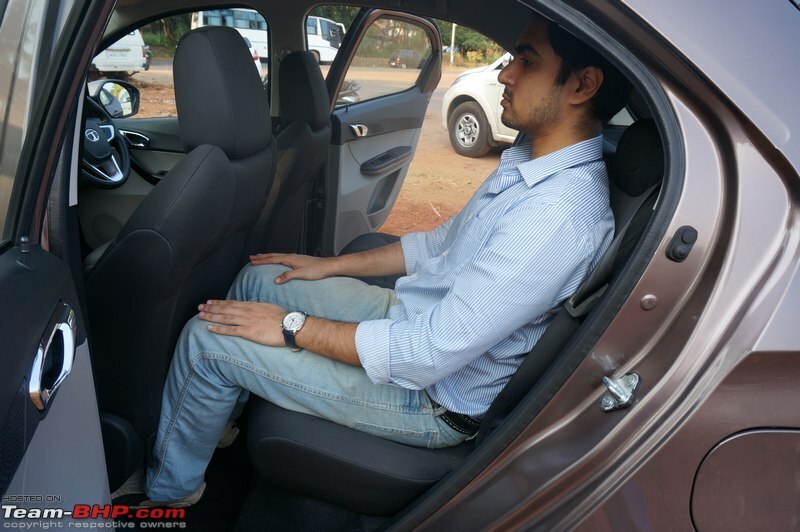 That, plus the healthy seat adjustment options, means that it doesn't take too long to find your ideal driving position. 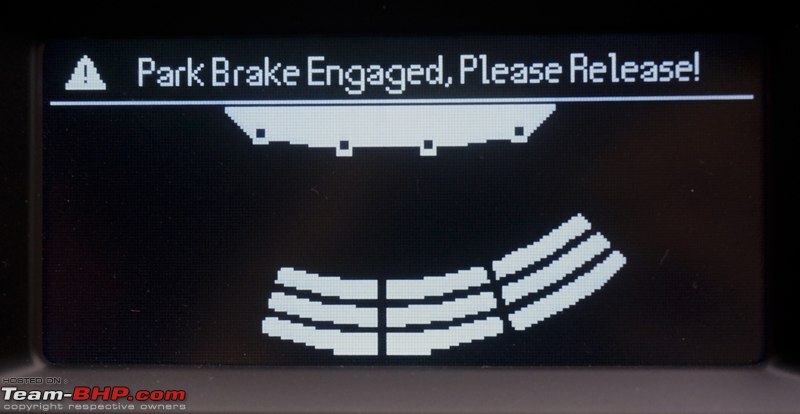 On the flip side, the meters are on the smaller side and so is the steering diameter, thus some drivers might have to revise their position (slightly) for an unhindered view of the instrument cluster. Frontal visibility is healthy, thanks to the downward sloping dashboard and the out-of-sight wipers. 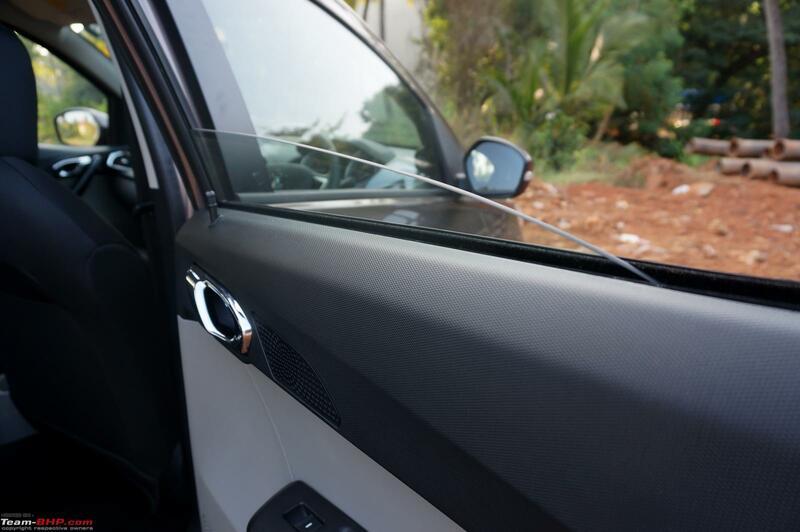 Even the side windows run below the front occupant's shoulder line, thus giving a feeling of openness inside the cabin. 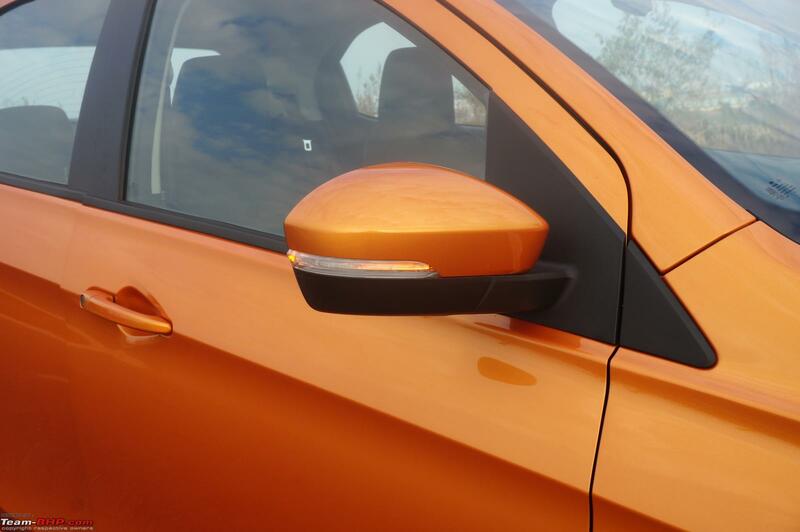 Rearward visibility is like any other hatchback. 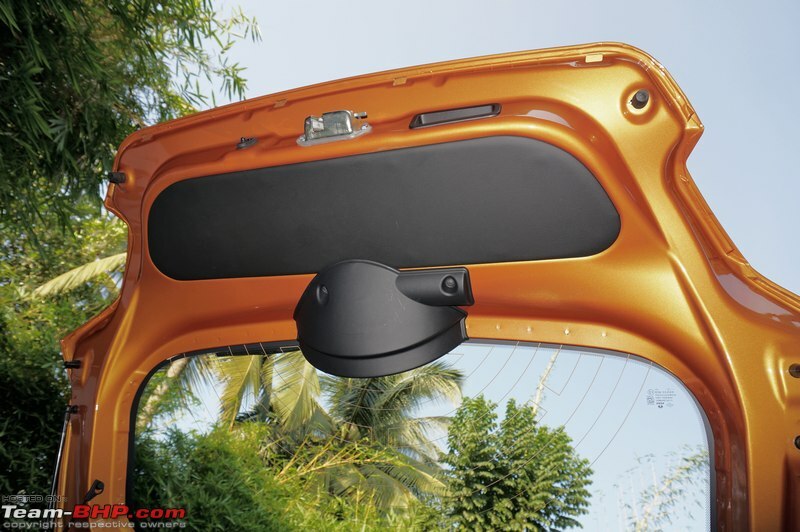 Yes, Tata has kitted the Zica with parking sensors. 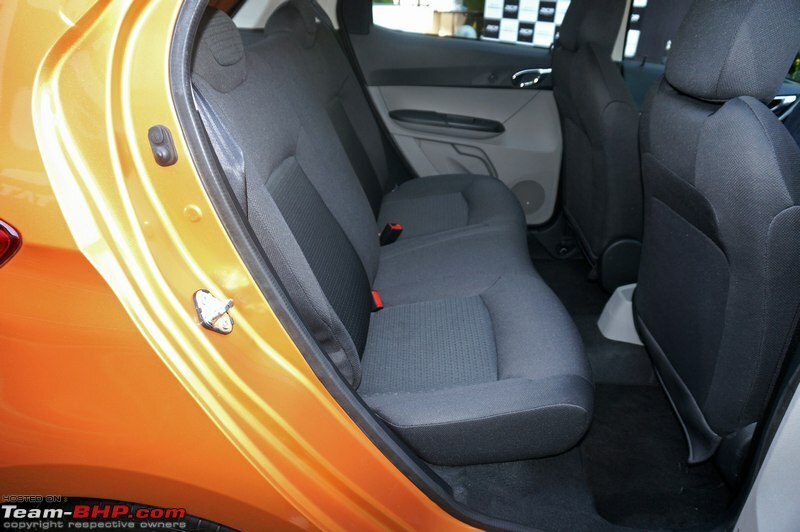 Unlike the Bolt, no one will complain about the lack of storage areas inside the Zica's cabin. The front doorpads can hold 2x 0.5L bottles + some smaller items, while the rear doors can hold a 1L bottle. Below the driver's side air vent is a spot for your keys, and you can park your smartphone ahead of the gear lever. 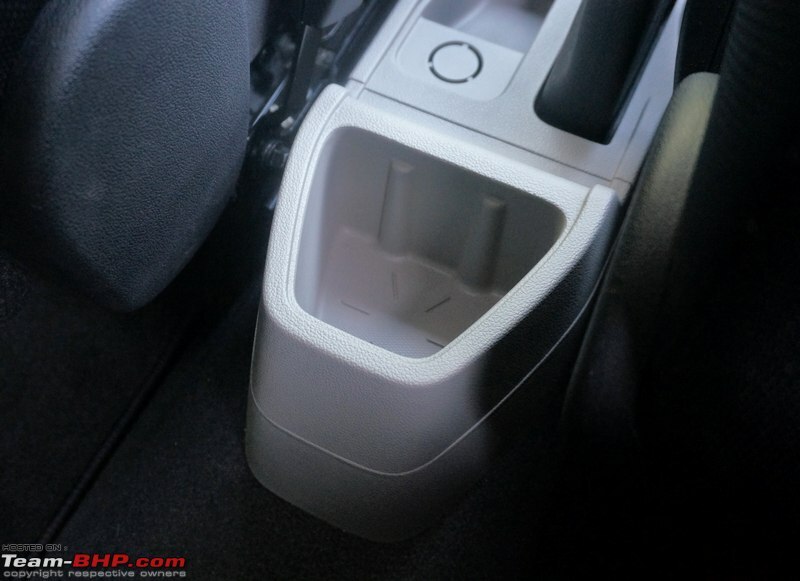 Beside the handbrake, you'll see 3 differently sized cup / bottle holders and a small cubby area. 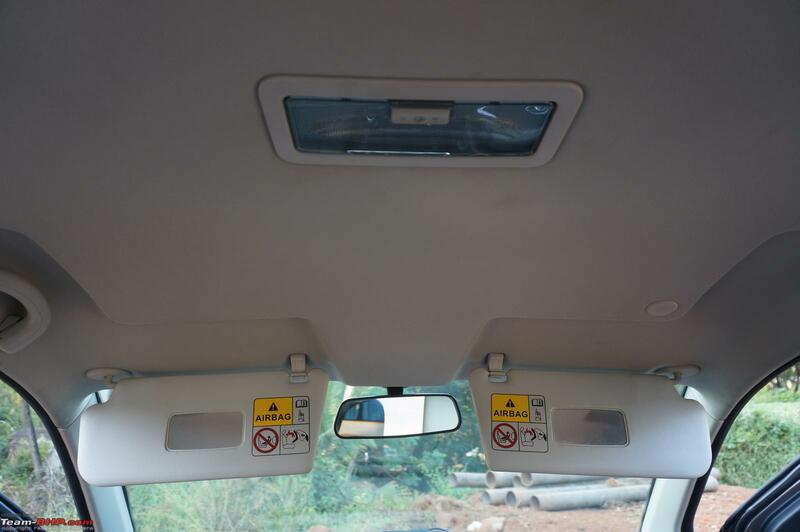 Tata said that the flat area above the dashboard is provided to place idols of gods / goddesses. 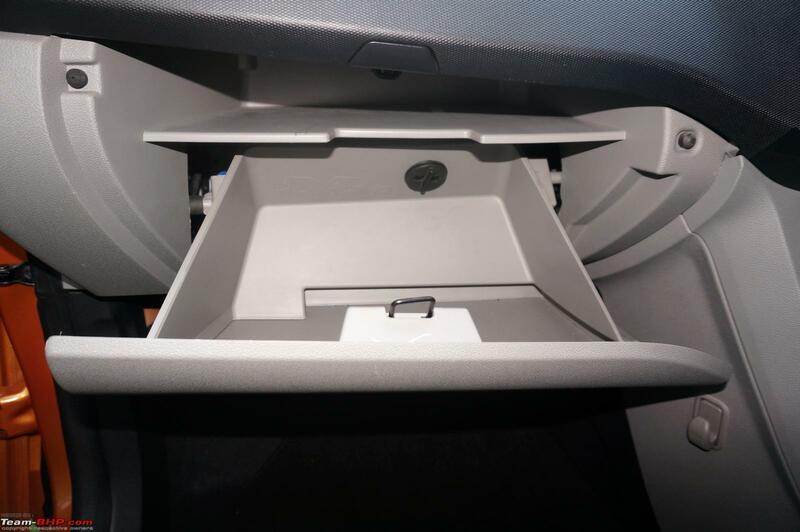 The glove compartment is big and it's segmented too! 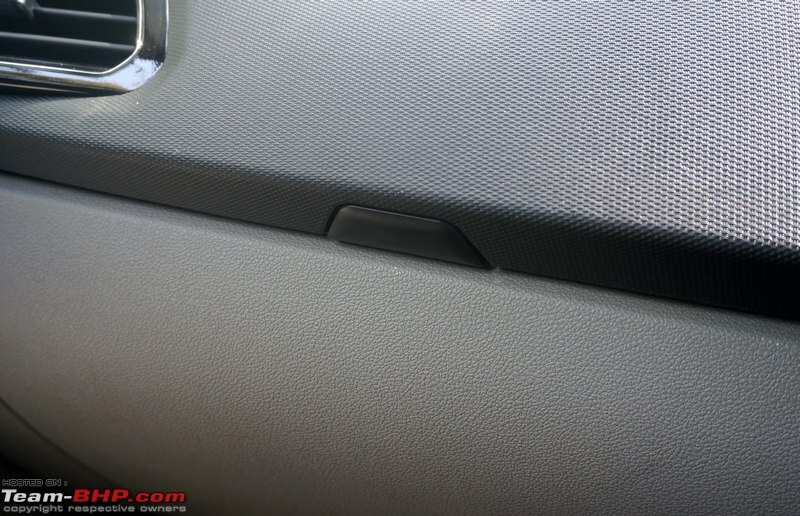 The top shelf (inside it) can host a small laptop or tablet. Speaking of the glovebox, its lid has a damped opening and closing action. Super neat! We found the petrol's air con to be super effective and never felt the need to go beyond blower speed 1. Mind you, even at that speed, the blower is audible. 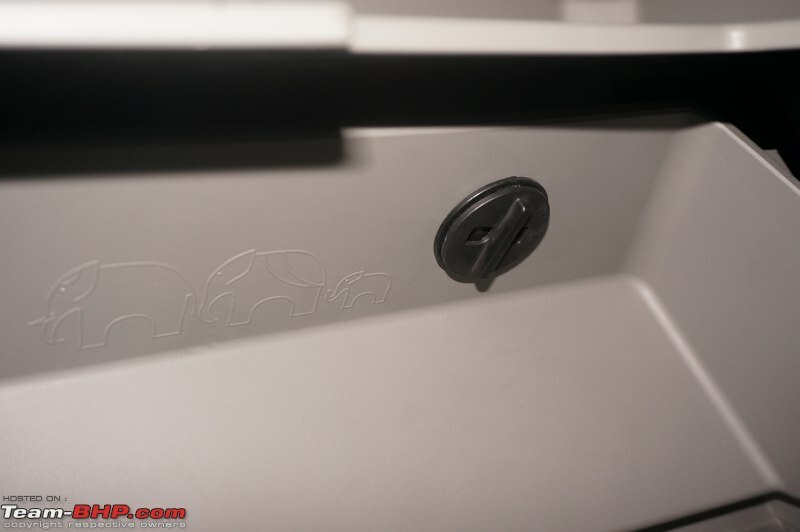 However, what confused us was that the diesel's unit felt noticeably weaker. Even at fan speed 3, we weren't comfortable. 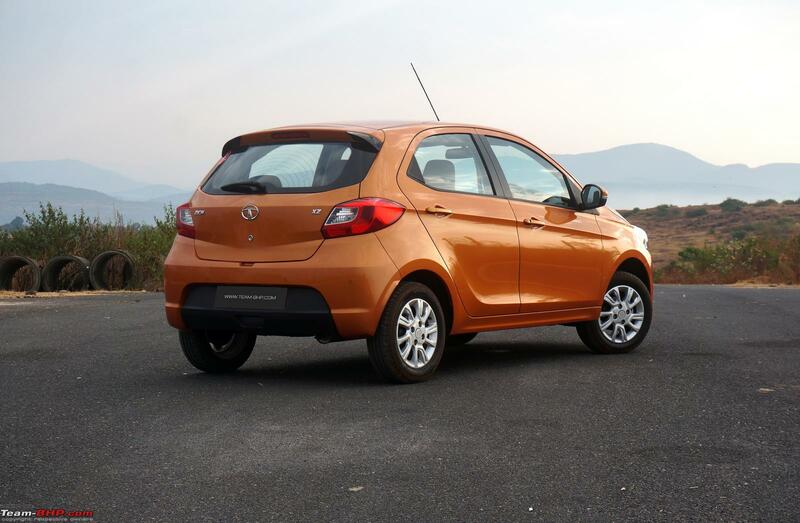 Tata says that both cars use an identical 110cc compressor. Perhaps a problem in the diesel test car? Another point worth mentioning here is that the design of the side air vents has been incorporated from the Tata MegaPixel concept, unveiled in Geneva in 2012. 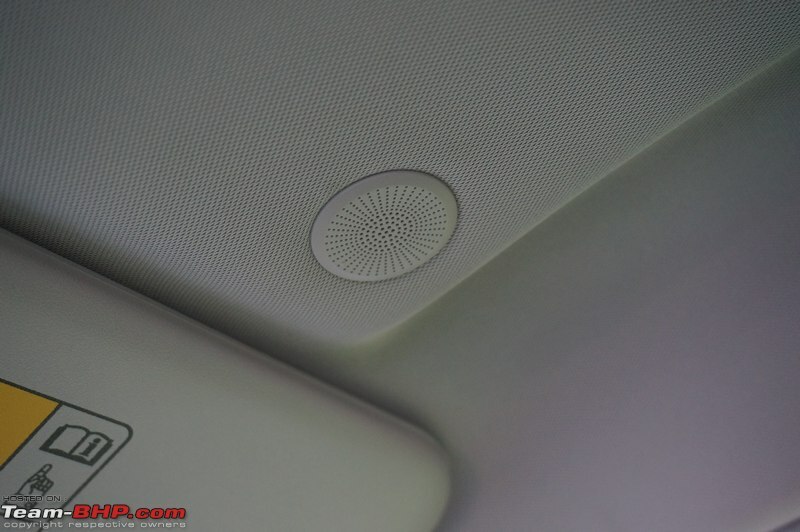 Let me assure you that this design is very effective in channelizing air flow across the cabin. We usually cover the ICE in the interior-front post. 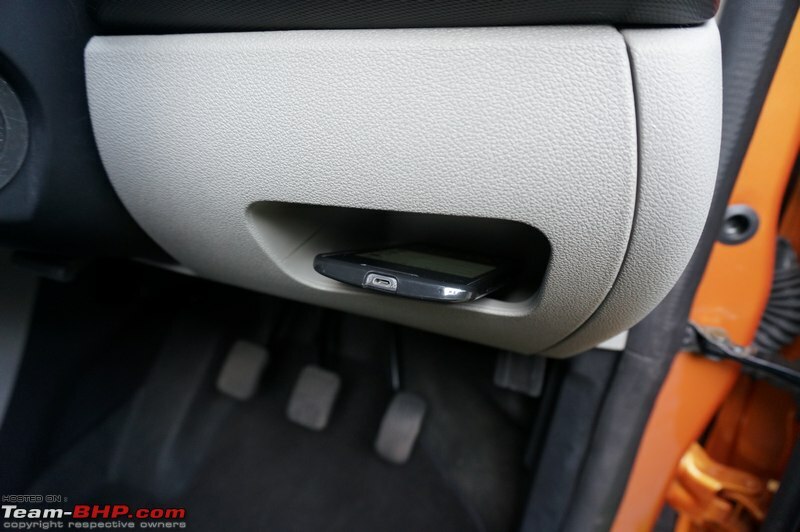 There is so much to say about it that we've kept a separate post for the audio system below. 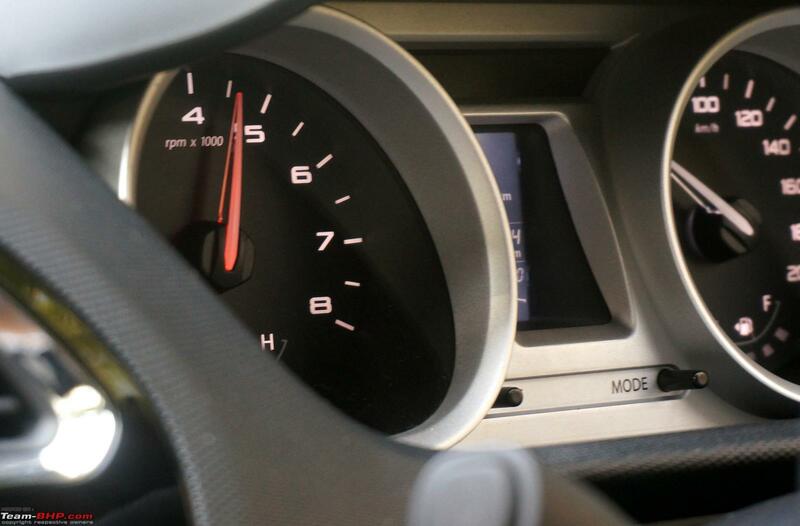 Tachometer needle turns red as it approaches the redline! Notice how the circle size keeps increasing with each concentric ring and finally ends up in a hexagonal pattern. Very cool! Enough place here to park a large 'phablet'! 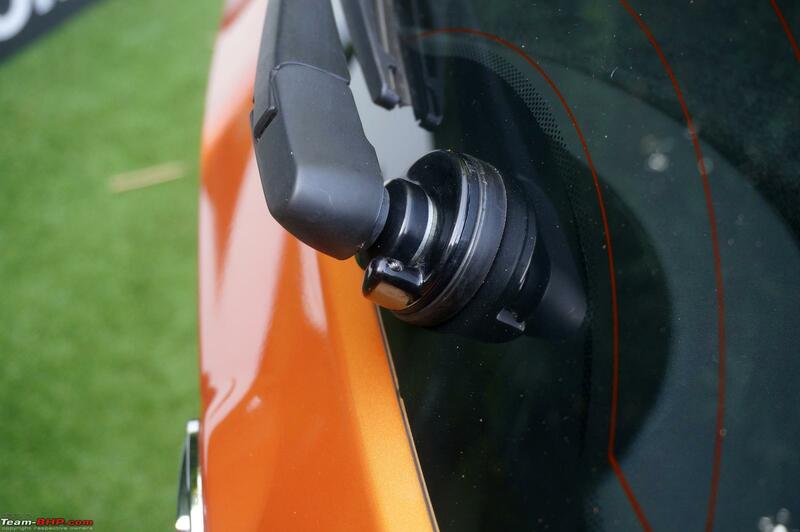 Both sunvisors get a vanity mirror. No illumination. 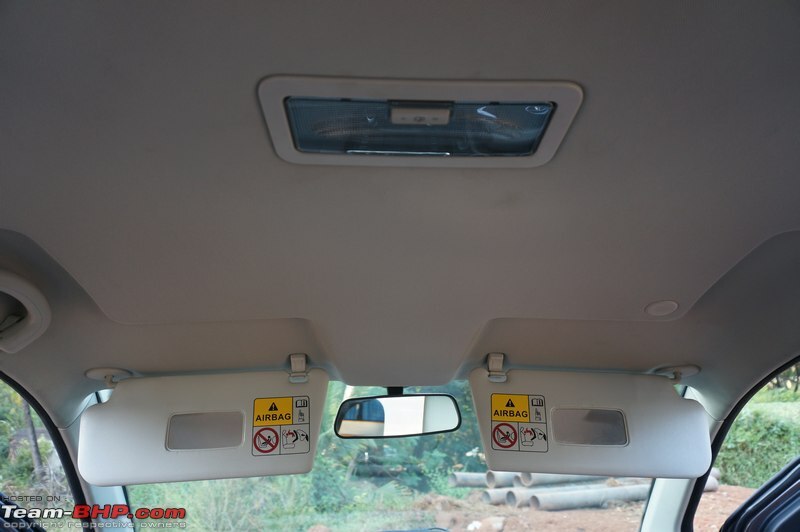 Driver-side sunvisor too has a child-seat warning . Over enthusiastic stickering chap? Last edited by GTO : 11th January 2016 at 11:29. 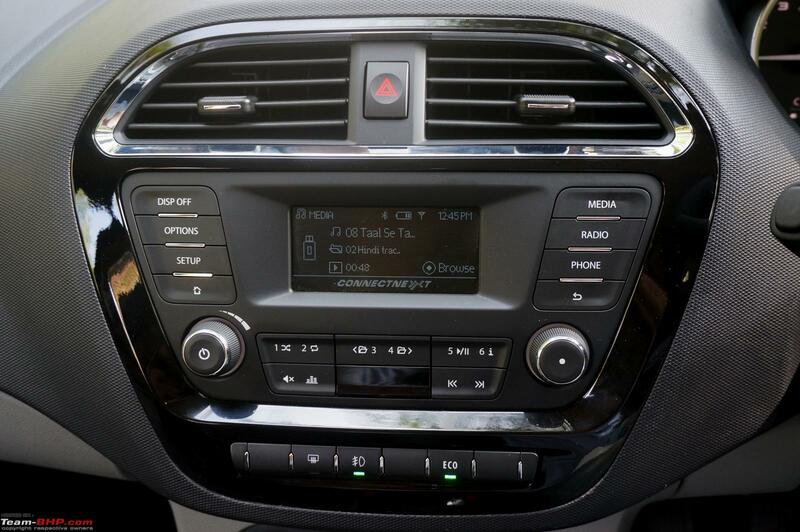 The head-unit supports USB, AUX and Bluetooth streaming (can pair up to 10 devices while on the move). No provision for an SD card though, and no CD player either (who uses that anyway?). 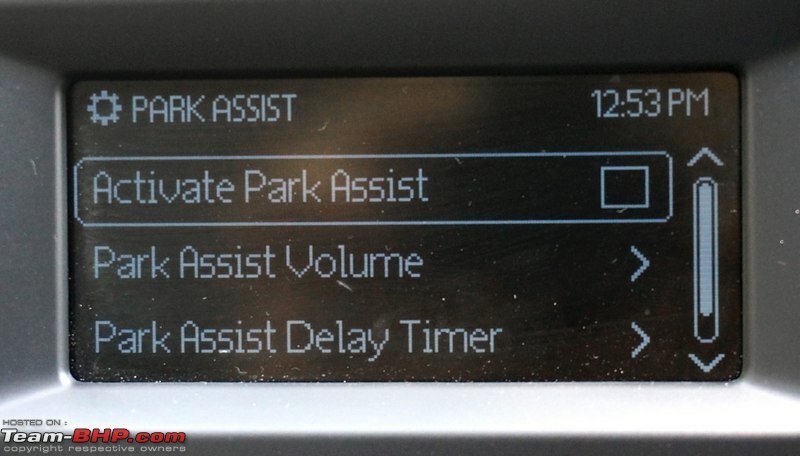 The system is very intuitive to use with all functions marked clearly on the respective buttons. 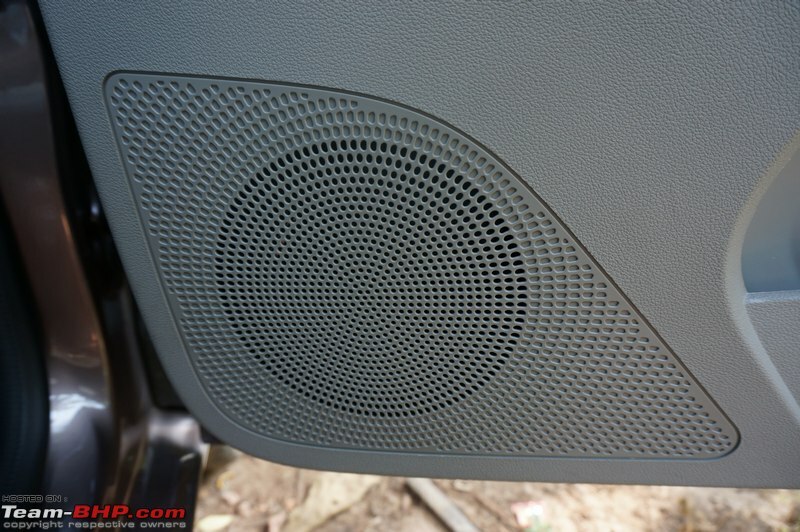 There's no doubt this Harman Kardon-developed 8-speaker ICE is the best in class. The talking point is undeniably the awesome sound quality from the 6.5" component speakers in each door, complimented by 2 tweeters on the A-pillars and 2 on the rear doors. 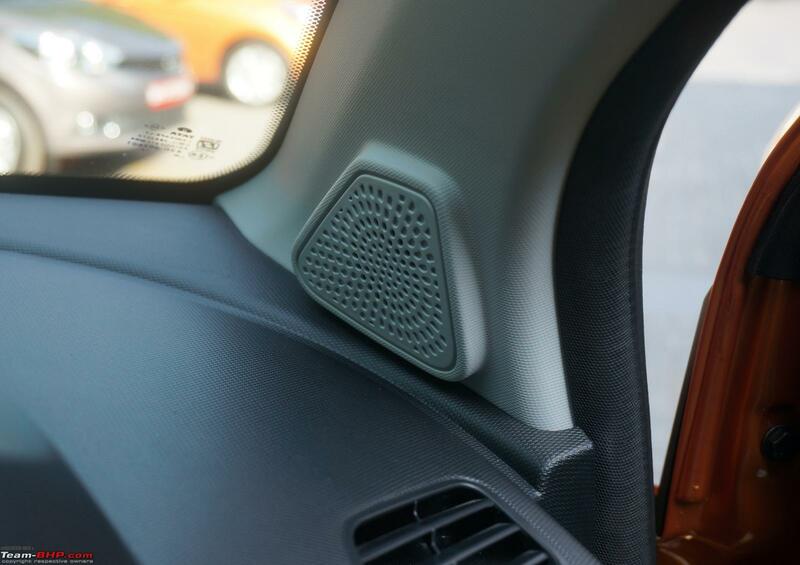 Since the Zica was developed from scratch, Harman played an important role in fine tuning the audio, speaker placement etc. to ensure that the output is perfect. Trust me when I say, there is no other hatchback's OEM audio system that sounds this good! The SQ would even pass muster in a Rs. 20 lakh car. Vid6639 and I enjoyed songs (even those we usually wouldn't listen to), just because of the audio quality. Be sure to tune the audio settings to your taste to truly enjoy it. A sound engineer revealed that the head-unit has a 20W RMS x 4 in-built amp to support the hardware. 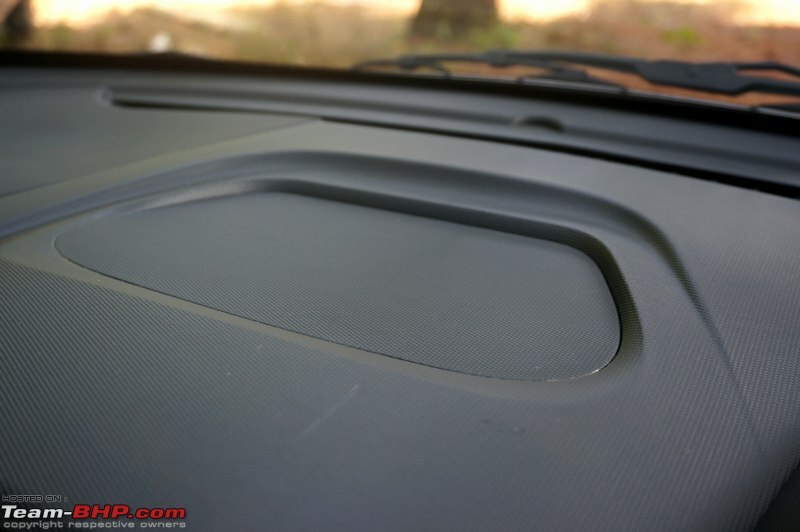 That's the same as the lower variant of the Zest (Zest's top variant uses a 25W RMS x 4 unit). 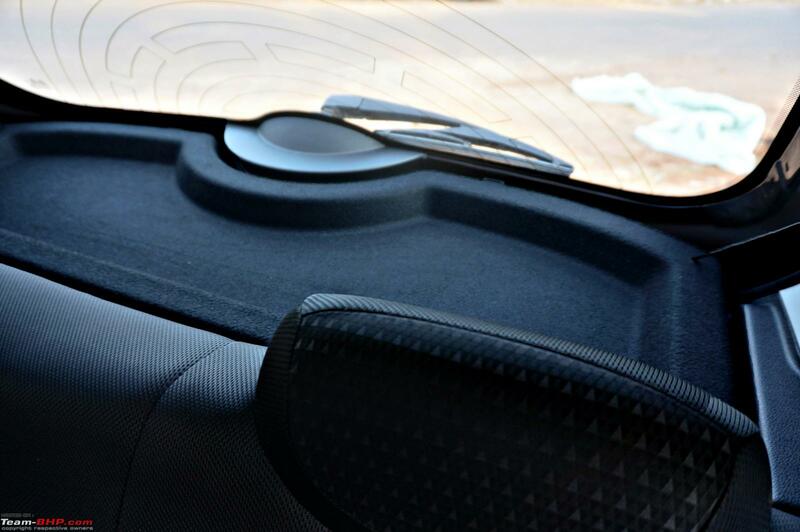 There is an option to amplify the sound when hearing tracks via AUX-in. The system works seamlessly when you fire up the engine from ignition mode (doesn't break the music for that brief moment). 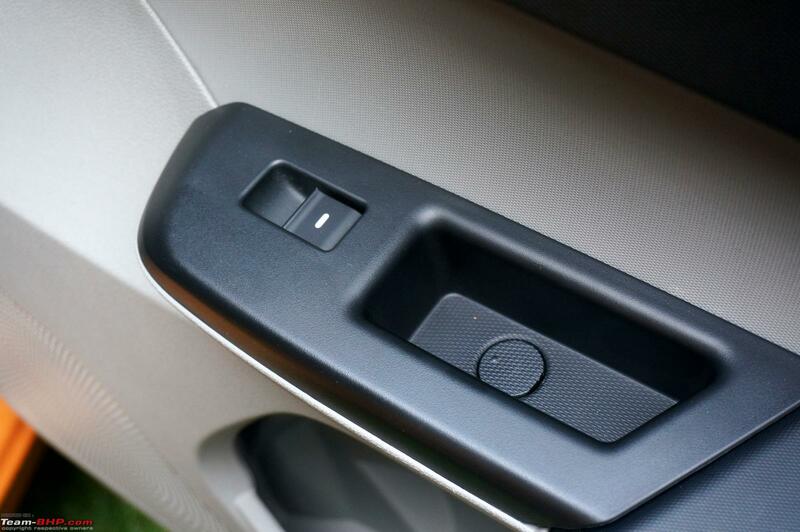 It will remain on until you switch the car off and remove the key from the slot. The HU doubles up as a display for the 'park assist' system with a range of 1.5 meters. It'll also throw up warning signs such as 'handbrake engaged' and 'STOP' when you're too close. You can start the parking assist via the head-unit (without engaging reverse), and also set its beep volume to your preferences. A delayed timer can be set up to leave the sensors on for a while even after you move out of reverse gear. 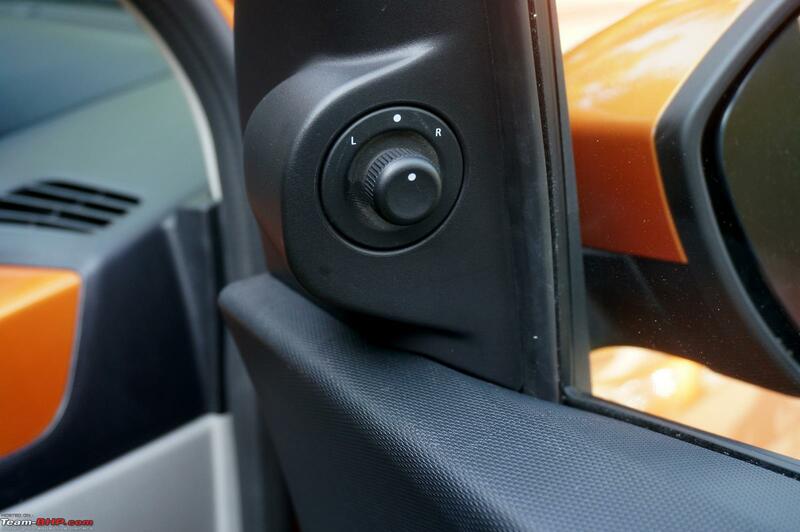 This is helpful to stop the music from continuously coming on & off (music is muted in reverse) when you are juggling your way out of a tight spot. 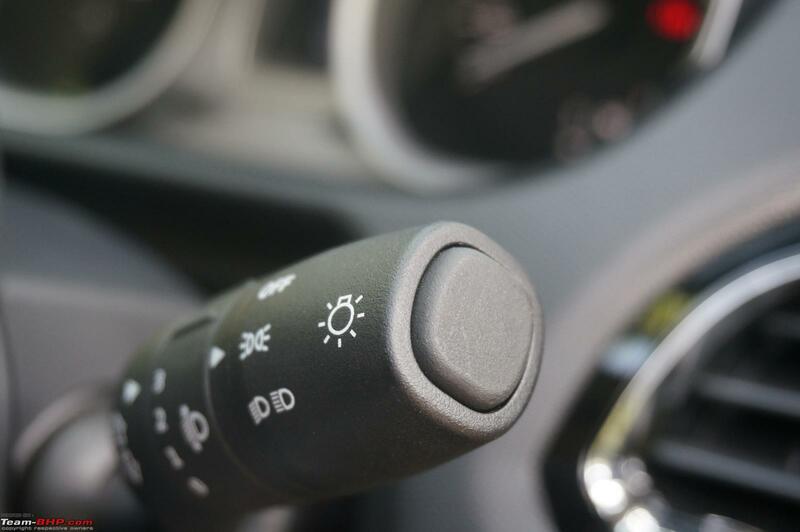 Using the delayed timer, you can concentrate on your parking maneuver till you have gotten in or out completely. 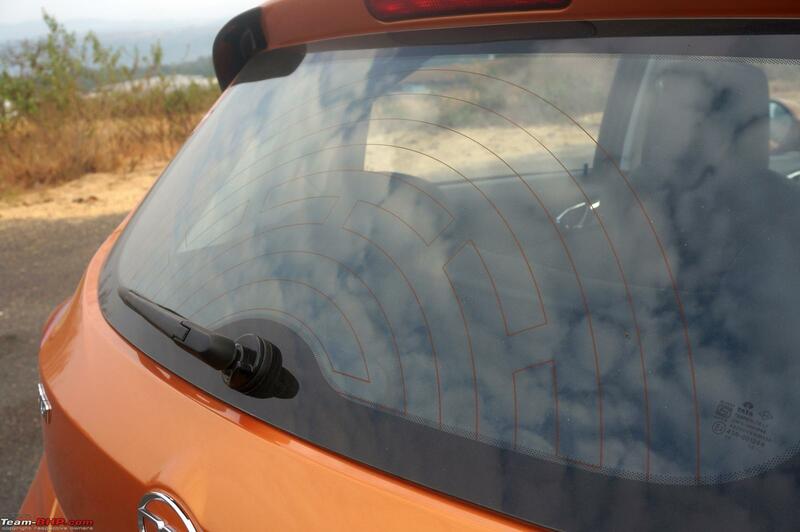 Reverse at a speed of over 10 kph and the sensors will stop giving feedback. 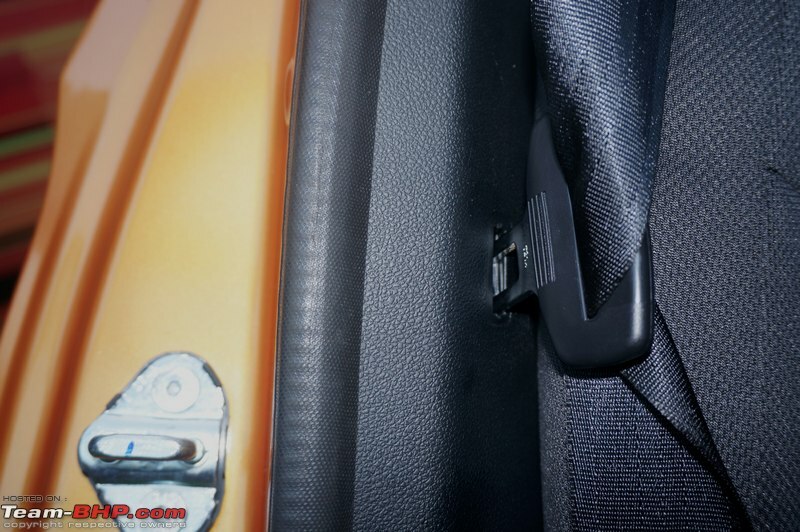 Features such as auto locking doors, speed dependent audio volume and follow-me-home headlamps can be controlled via the HU. This is an offline map by MapMyIndia available free-of-charge (download here). Not only that, Zica owners get free updates for life! 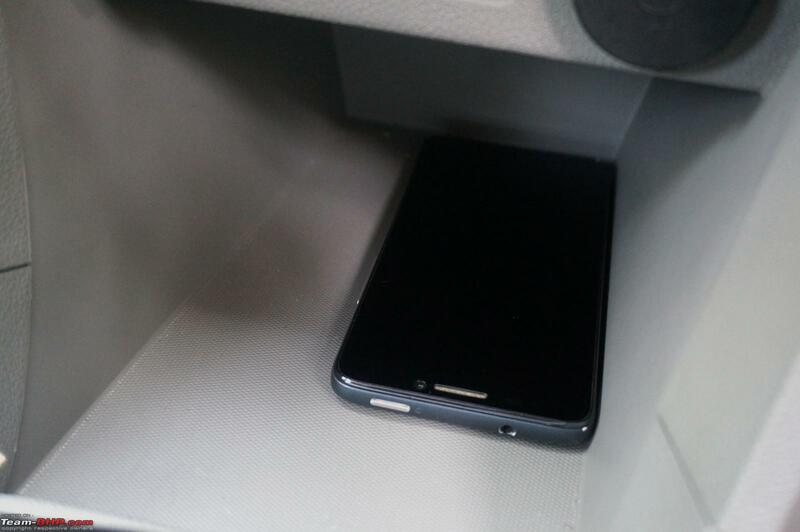 It syncs your phone with the car's screen via Bluetooth and works just like any other map - with the advantage of offline performance in zero network areas. 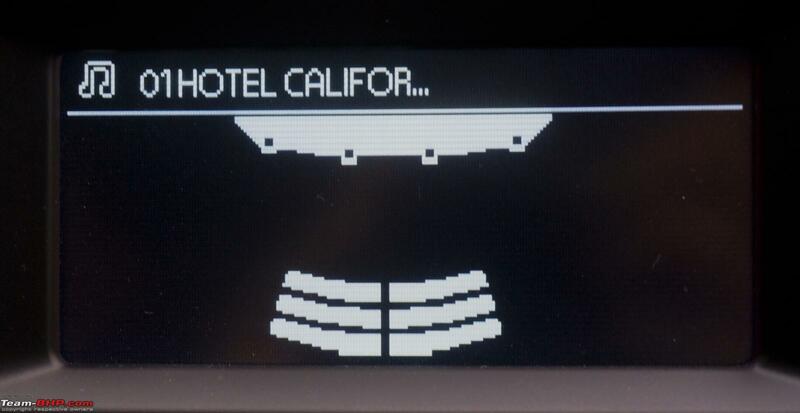 Each time you are approaching a turn, a display shows up on the head-unit with a navigation arrow, distance in which the turn has to be taken, distance to destination and the expected time of arrival. This is in addition to the voice guidance (whose activation lowers the song volume). 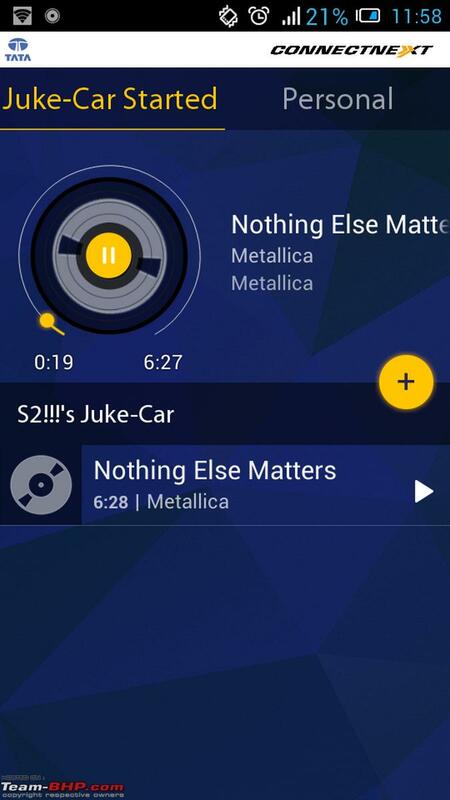 Yes, there is an option to switch off the voice guidance and enjoy your music without any interruption. On a road trip, it isn't always necessary that the person whose phone is connected to the car's system via AUX-in or Bluetooth contains the best music. 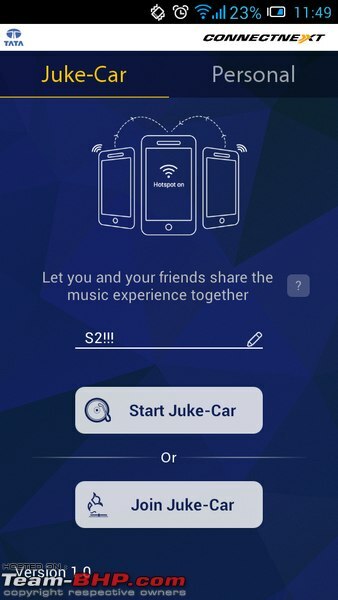 With this app, up to 10 devices can connect to the master phone (via Wi-Fi hotspot) and add their songs to a master playlist. The song is transferred to the playlist almost instantly. 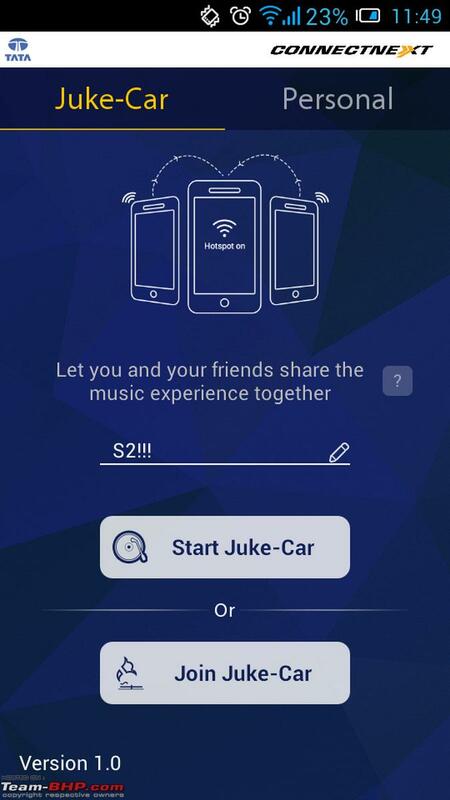 Once done, other users can disconnect and even then, the song will remain on the app. Once the master phone closes the app, all songs get erased from the list. It is a super cool app, but for android users only. 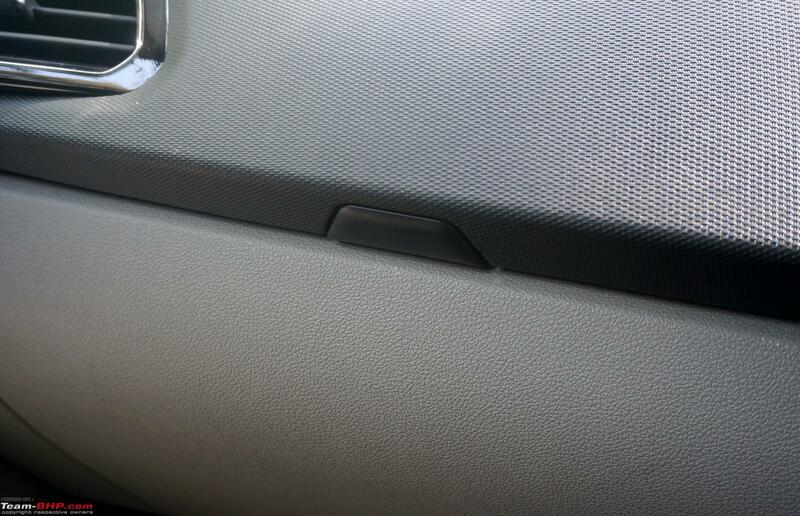 FYI: this app can be enjoyed by all android users irrespective of the car they're in. (Click here to download). Last edited by GTO : 9th January 2016 at 16:40. The rear doors open wide just like the front ones, but you're still sitting inside this car (like a Grand i10), and not walking into it (like the WagonR). 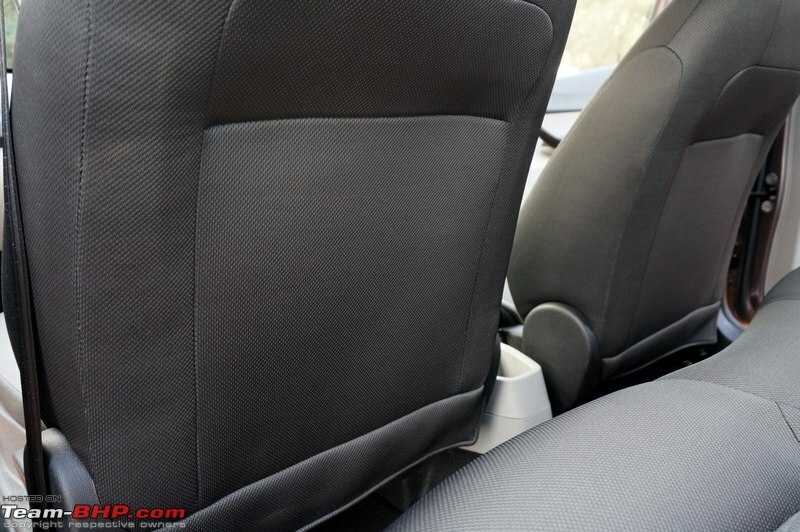 What you'll notice immediately is that the rear bench is contoured - it's not a flat bench. The seat itself is soft and offers decent under-thigh support for persons 5'8" and below. Taller folk will sit with their knees slightly pointing upwards, although it isn't uncomfortable. 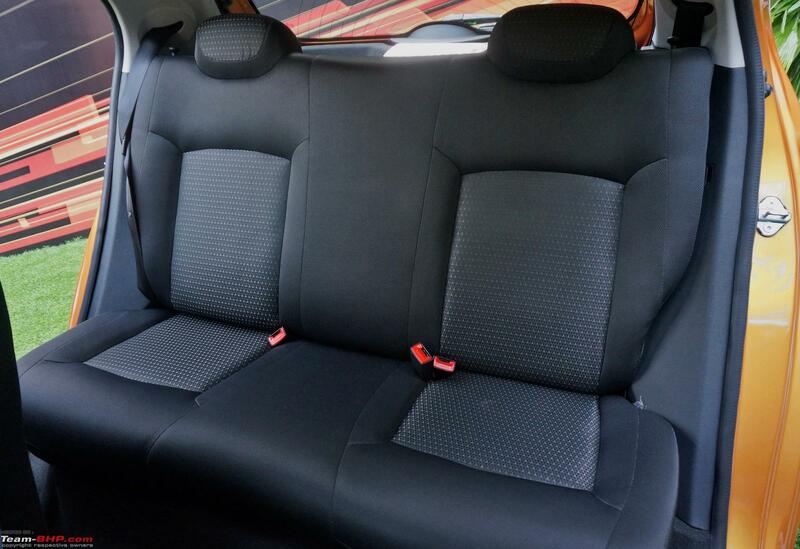 This is a rare Tata car where 3 adults at the back will be a squeeze. 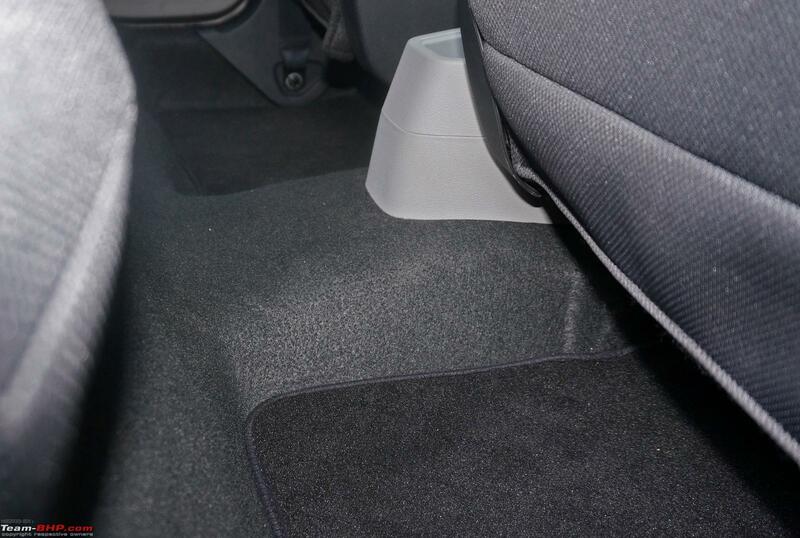 Remember, the Zica (1,647 mm) is narrower than the Indica (1,665 mm) & Grand i10 (1,660 mm). Its wheelbase is lesser than its direct rivals, yet at 5'10", I could just about fit behind Vid6639's (6.0 ft) driving position. No room to spare, but I could be seated. Yes, the seatback is scooped to release whatever knee room is possible. There is ample space beneath the front seats to tuck your feet in. 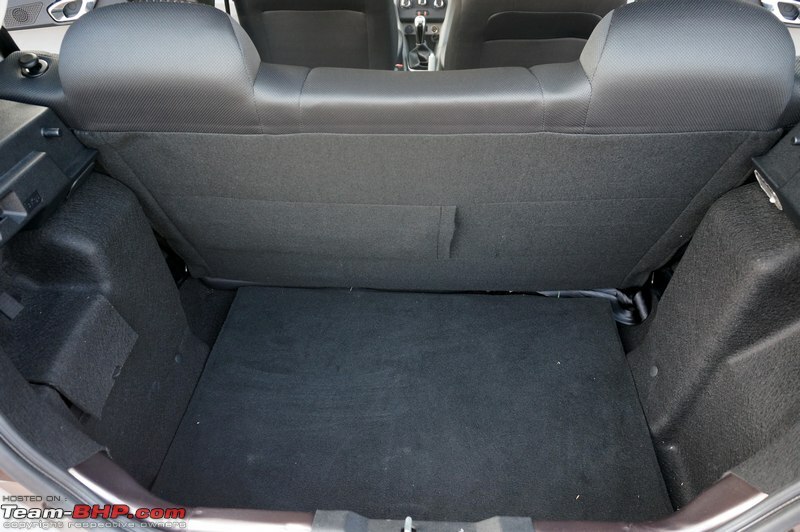 The floor hump is quite tall and the (hopefully occasional) 5th passenger will have to place his feet on the side. 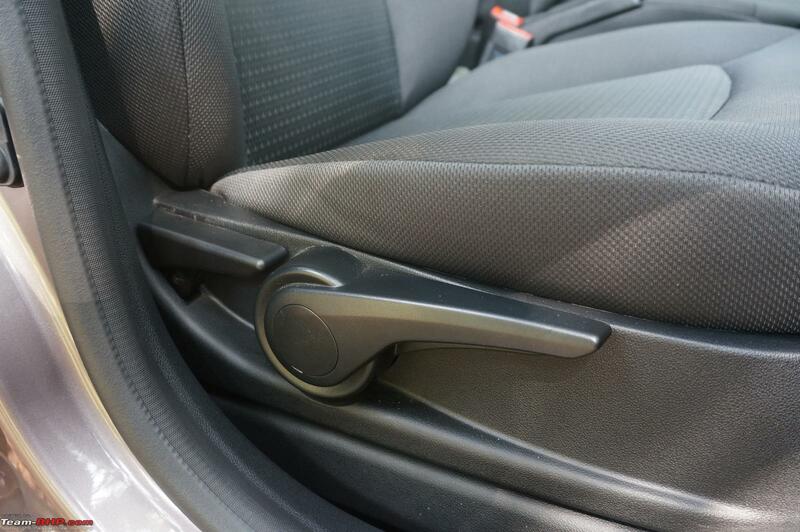 The handbrake console extension at the back doesn't improve matters either. 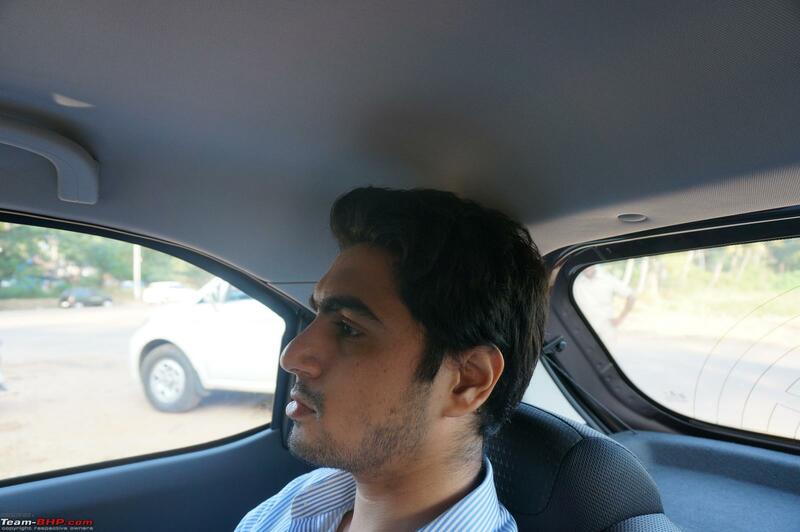 Headroom is very limited - at 5'10", my head was touching the roof (see picture below). The black interior shade & tapering window line don't make things airy in here. That said, it doesn't feel as claustrophobic as the Swift. 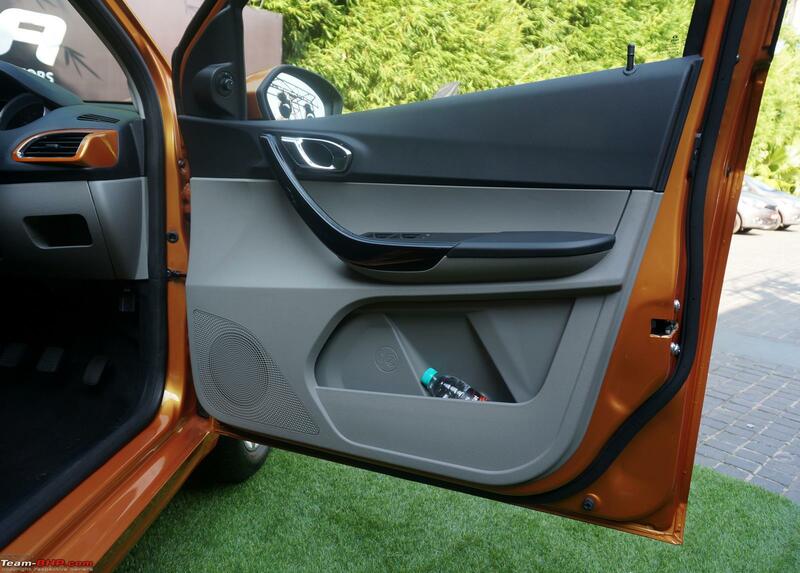 Rear passengers get a 1L bottle holder on each door, a big + deep cubby on the handbrake console and the contoured parcel shelf for storage. The Zica boasts of a 242 litre boot which is considerably bigger than even the more expensive Bolt (210L) and Swift (204L), but smaller than the Grand i10 (256L). Its shape makes it very usable. 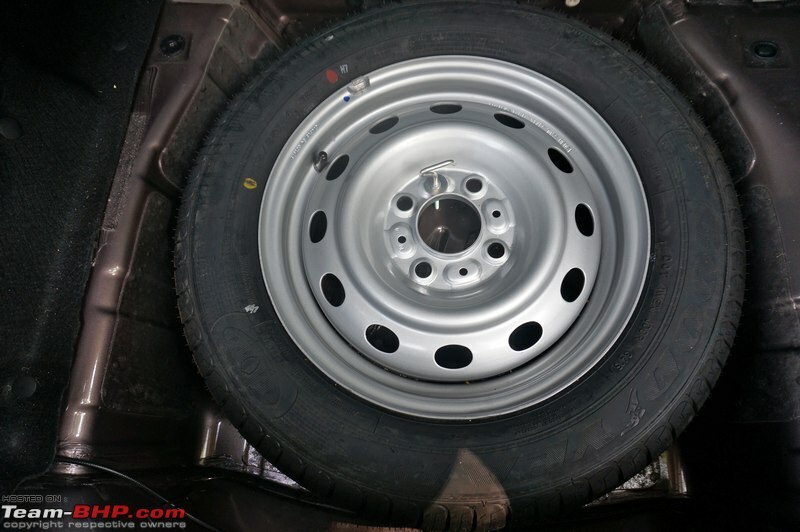 The high loading lip does require some effort to load heavy items in though. 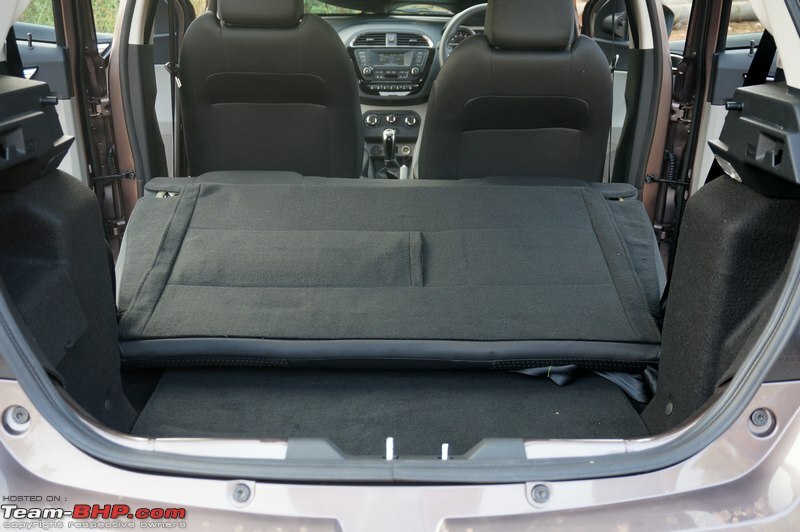 To accommodate more cargo, the rear seat can fold flat by lifting the seatbase off. Still, due to the uneven floor level, you don't get a completely flat floor. Last edited by GTO : 9th January 2016 at 16:39. 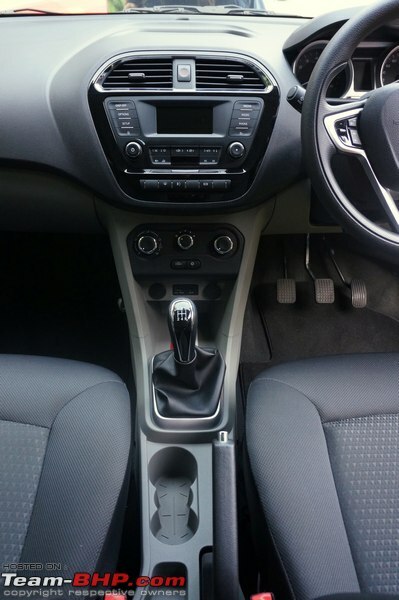 There are two engine options available with the Zica - a 1.2L petrol and a 1.05L diesel. 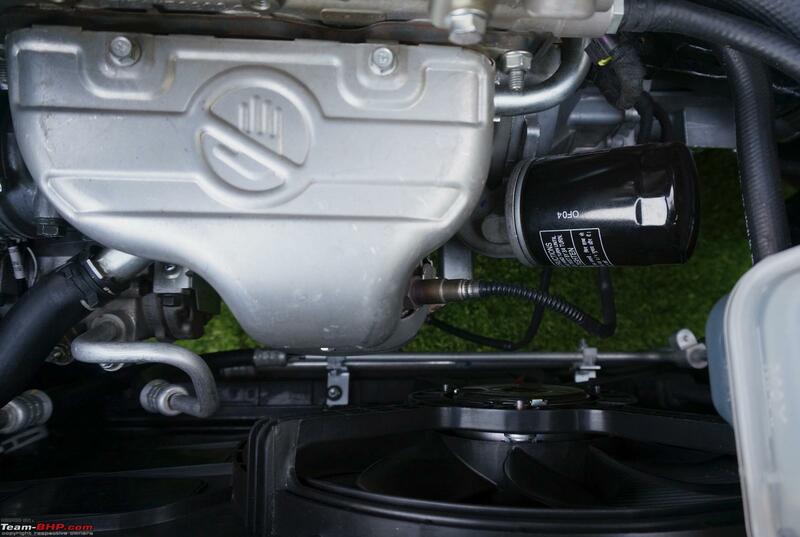 The petrol is a 1,199 cc, 3-cylinder, 12V DOHC, all-aluminium engine which churns out 84 BHP (@ 6,000 rpm) and 114 Nm torque (@ 3,500 rpm). 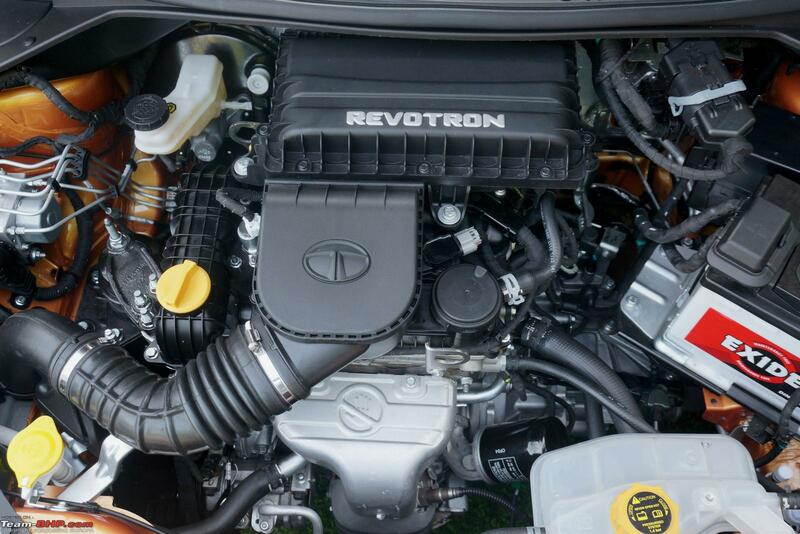 Being a new age petrol, it belongs to the Revotron family, even though it doesn't have a turbo. 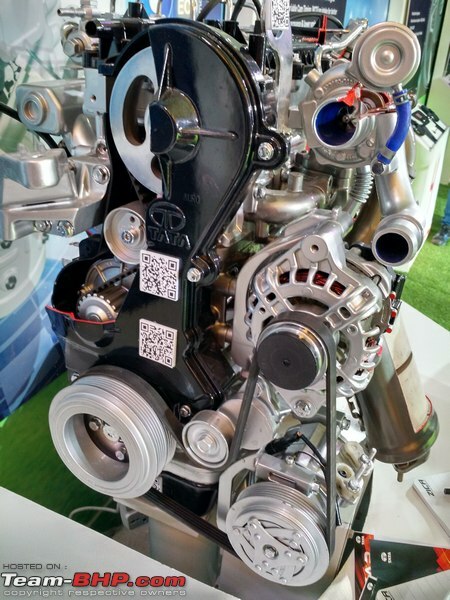 The diesel is a 1,047 cc, 3-cylinder, 12V DOHC common rail engine producing 69 BHP (@ 4,000 rpm) and 140 Nm torque (@ 1,800-3,000 rpm). 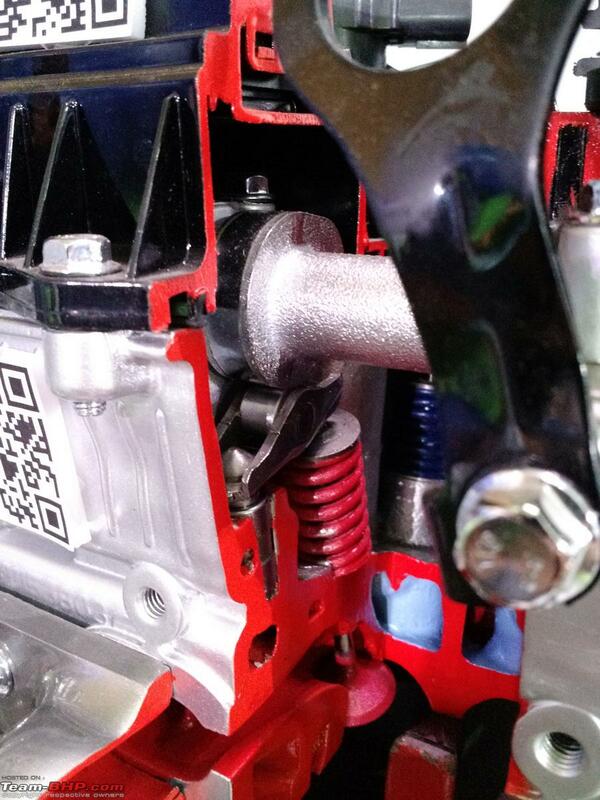 This motor uses an aluminium head with a cast iron block. 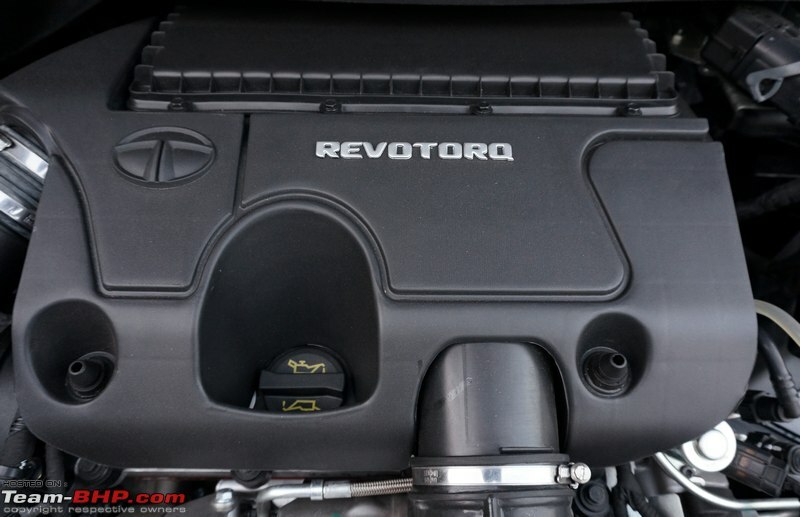 The diesel belongs to the Revotorq family. Both of them are equipped with Multi-Drive. 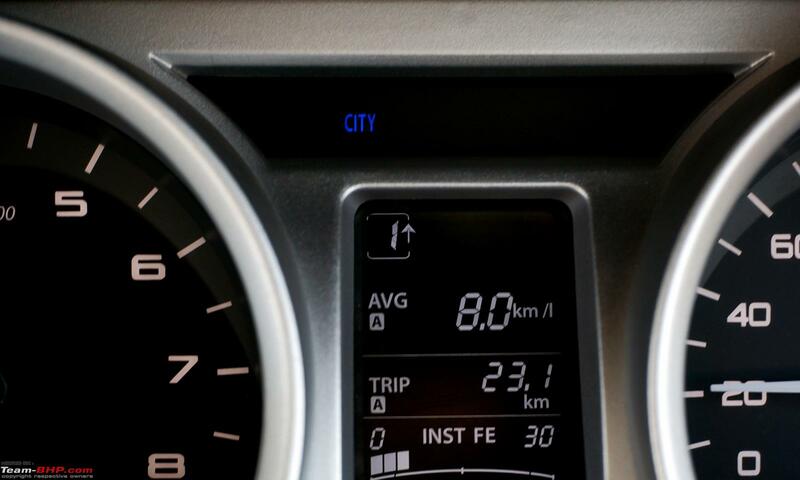 Owners get the option to choose between 2 driving modes - City and Eco. These are basically 2 preset engine maps. While City mode is set as default, Eco mode needs to be manually selected each time you start the car. To put things into perspective, consider the City mode as a regular driving mode. 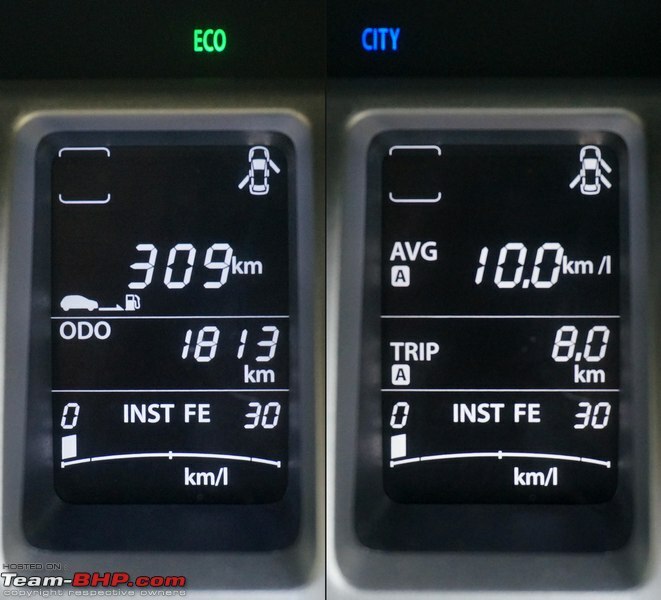 It's the Eco mode that is different. Eco mode dulls the drive by ~30% and that urgency is missing. You can literally feel the sluggishness while accelerating. 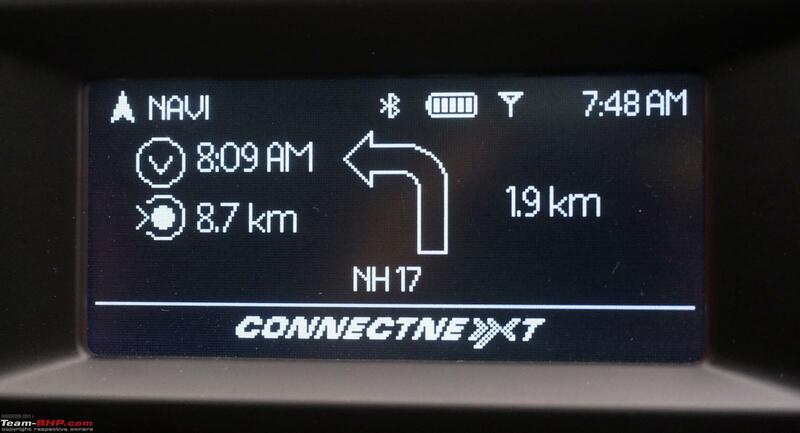 Obviously, this mode is tuned for fuel efficiency and is best left to sedate driving conditions. 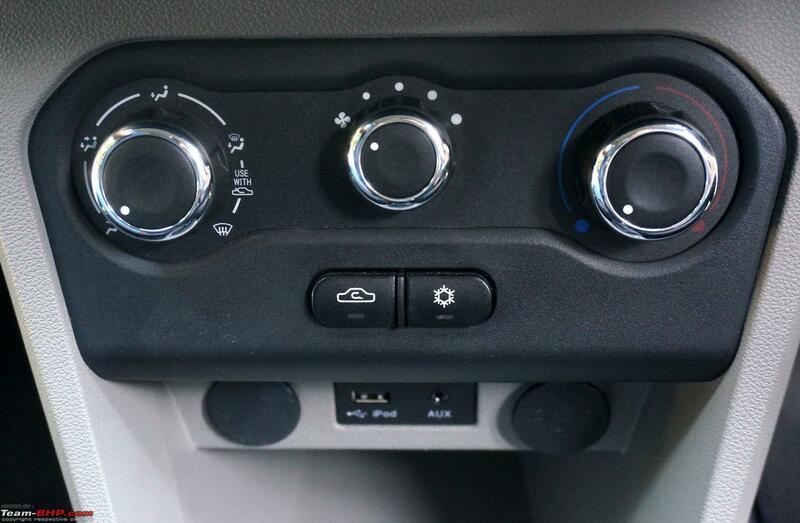 We didn't feel any drop in air-con performance between the 2 modes. 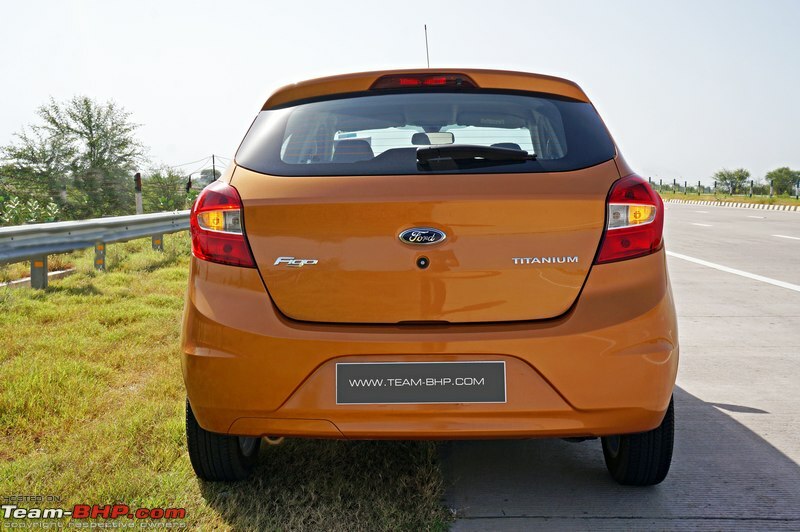 Do note that the Bolt & Zest get a 3rd mode called 'Sport' for peppier performance. Fire her up and you'll instantly realize this is no Kappa2 motor. Being a 3-cylinder unit, vibrations are prominent. Even at idle, with the temperature gauge settled down, you can feel vibrations on the seat, steering wheel, pedals and gear lever. 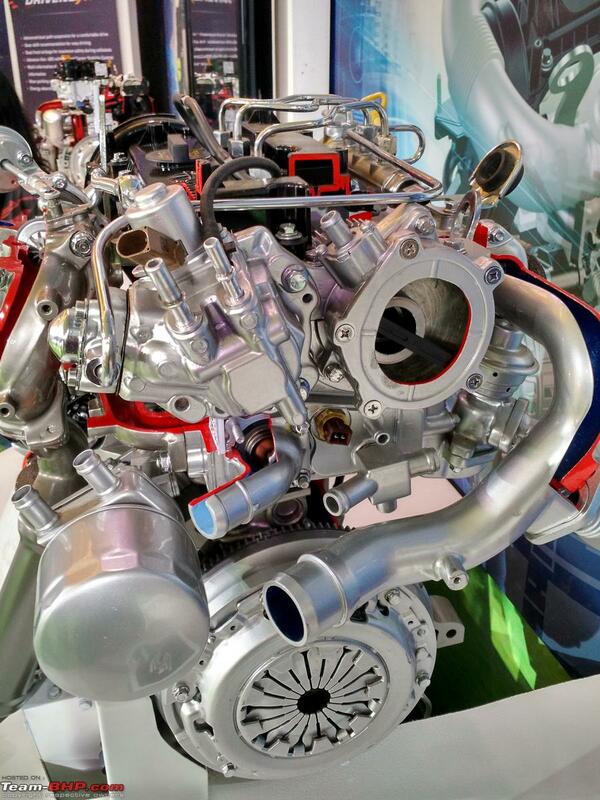 The 3-cylinder engine is very lumpy and can get vocal too. 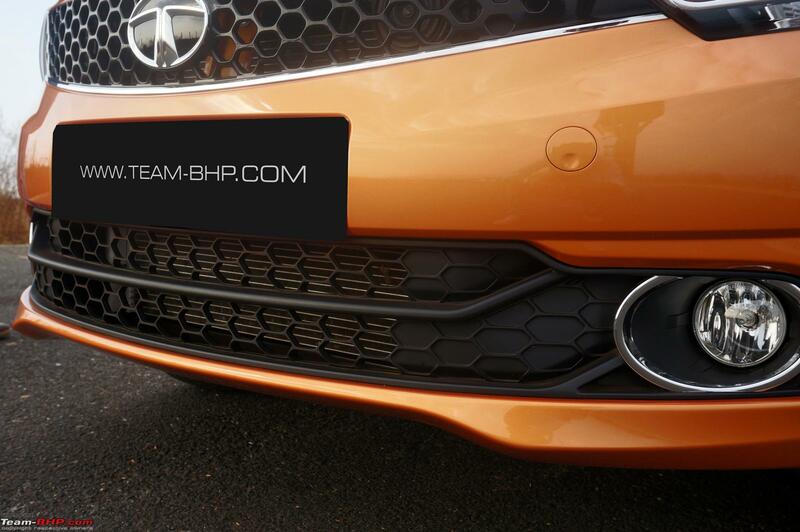 Owing to the car's 1,012 kg kerb weight, it has power-to-weight & torque-to-weight ratios of 83 BHP / ton & 113 Nm / ton respectively. That's on par with the Celerio. Still, when driving around in the city, the Zica doesn't feel particularly sprightly. On the other hand, it feels relaxed. 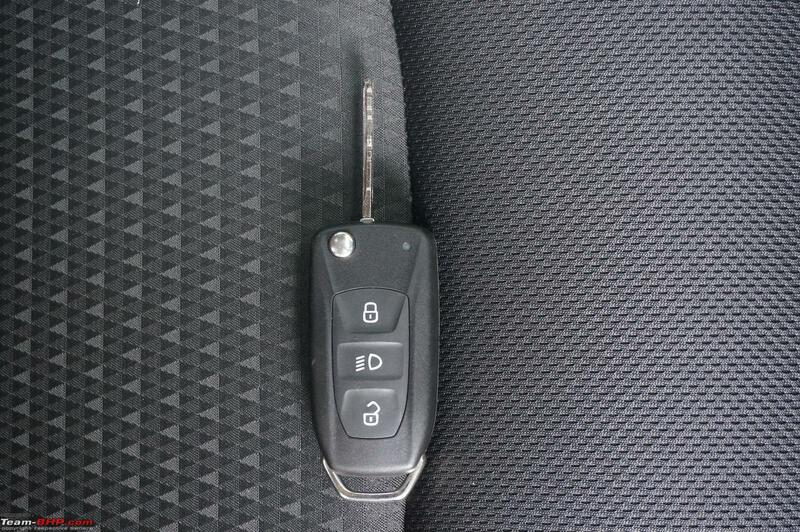 The talking point is its driveability. You can easily potter around in a higher gear and there is no shuddering felt inside the cabin either. It has enough poke to carry you in town with few gear changes, albeit in a relaxed manner. You won't find the need to rev the Revotron hard. Overall, it's a fair point A->B commuter, but is no scorcher. Like some other 3-cylinder engines, city driving can get jerky though, especially in stop & go traffic. You'll have to put in special effort to drive smoothly. One needs to carefully manage the accelerator & clutch to avoid jerks. 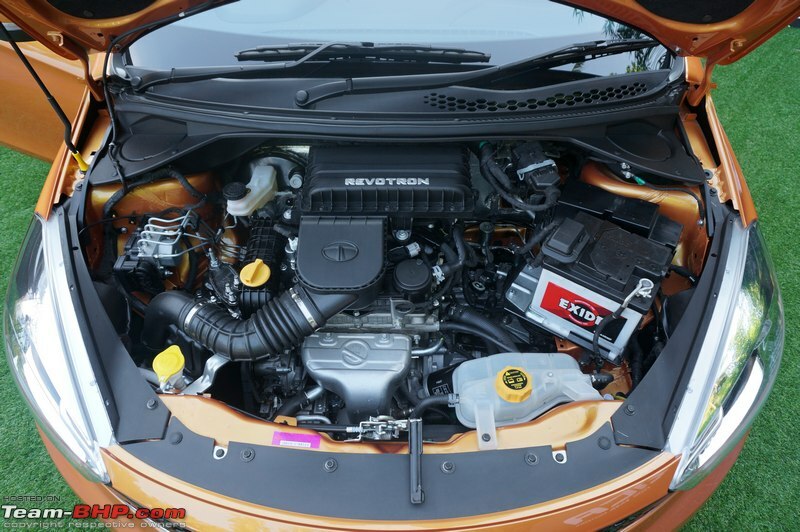 This 1.2L is fairly rev-happy and doesn't beg you to upshift closer to the redline. As the revs climb, the engine definitely gets more vocal inside the cabin, yet it doesn't sound thrashy or strained. Even if you hit the rev limiter, the fuel doesn't cut off suddenly; it will just hold on to ~6,300 rpm. 1st gear takes you to 50 kph while 2nd maxes out at ~88 kph. Outright performance is comparable to the Celerio. 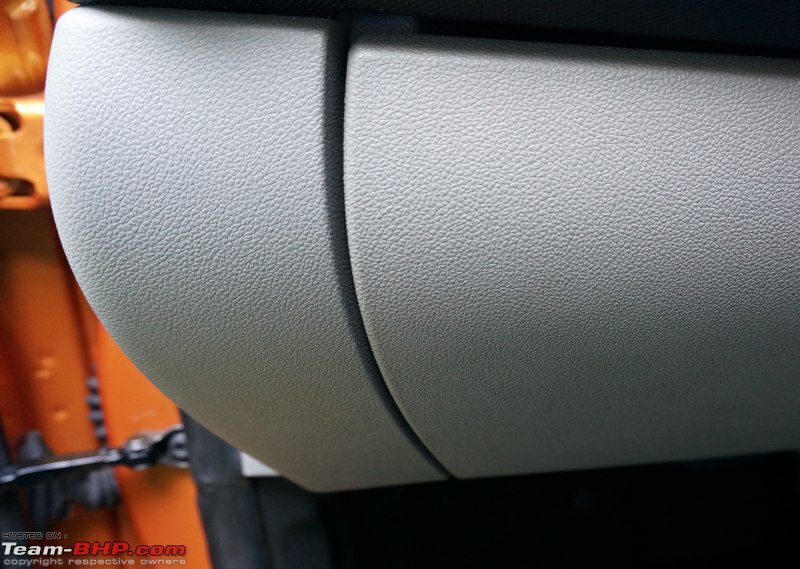 In terms of cruisability, 100 kph is seen at 2,800 rpm in 5th. We found the car losing steam beyond the 100 kph mark, and progress becomes slow thereafter. Overtaking manoeuvres will require some planning and downshifting. 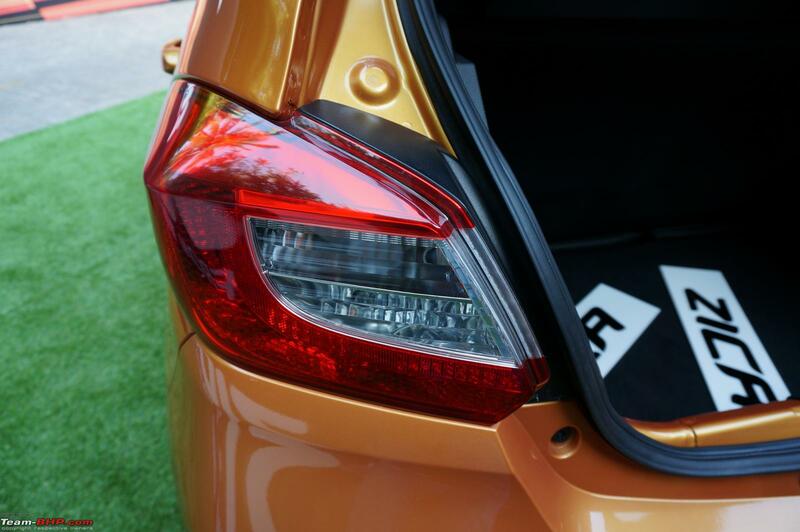 Highway performance will be even more ordinary with passengers + luggage on-board. The engine is audible inside the cabin past 1,500 rpm. At mid-level rpms, a very throaty sound filters through - it's almost diesel-like! 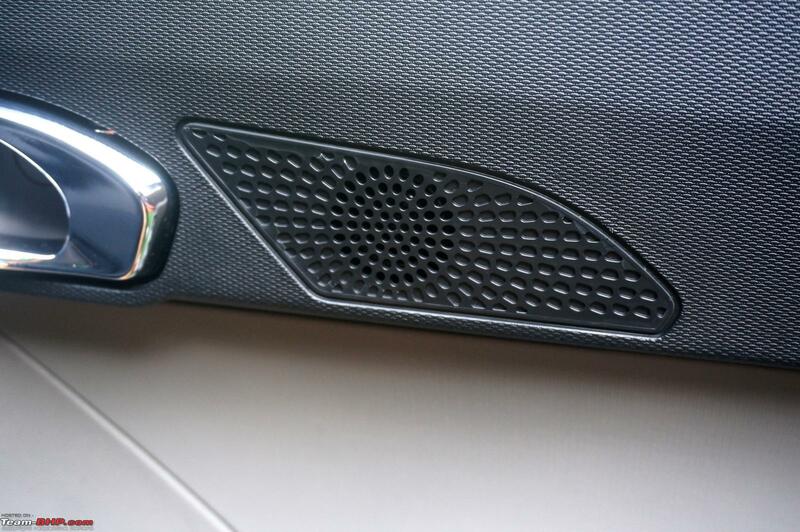 Between 2,300 and 2,800 rpm, we could hear a peculiar resonant vibration coming from behind the dashboard. We reported this issue to Tata and hope that it was a car-specific problem. Like other 3-cylinder petrols, you'll easily notice the drivetrain clank sound when you press the throttle again, after lifting off. 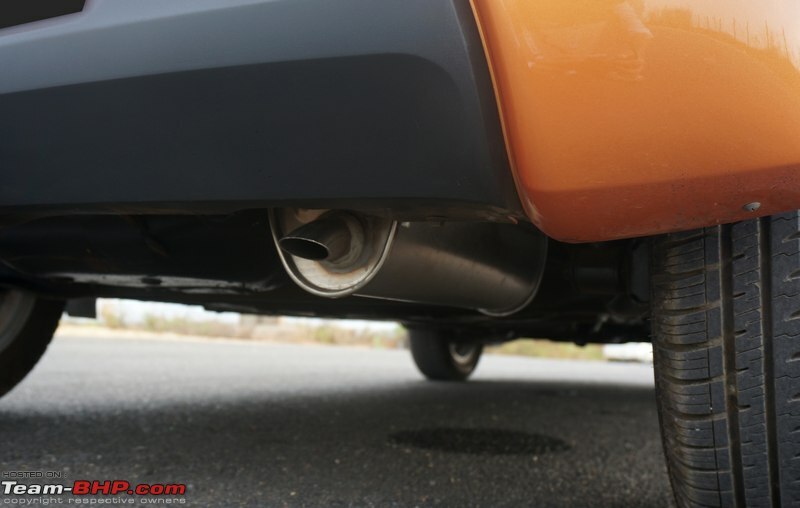 Must add, the exhaust crackles when you lift off, like the Mini Cooper S . The sound isn't very prominent, but a keen ear / BHPian will pick it up (especially on the outside). 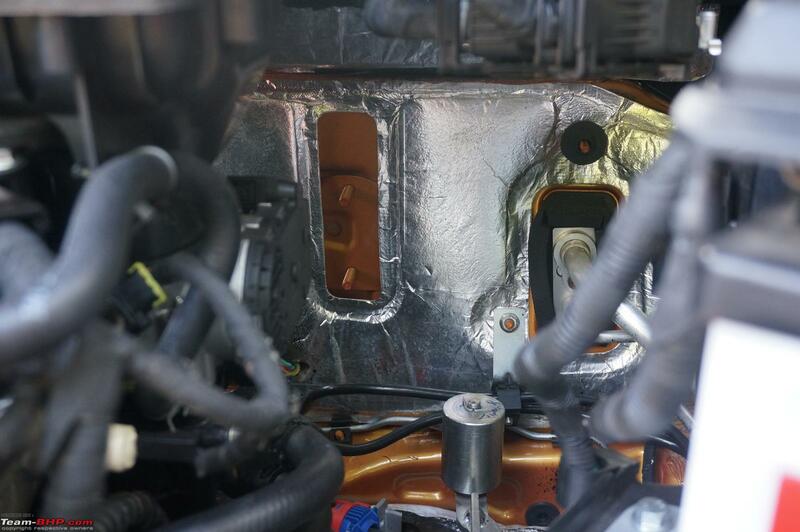 Even after two layers of insulation, wind noise from the A and B pillars creeps in above 80 kph. 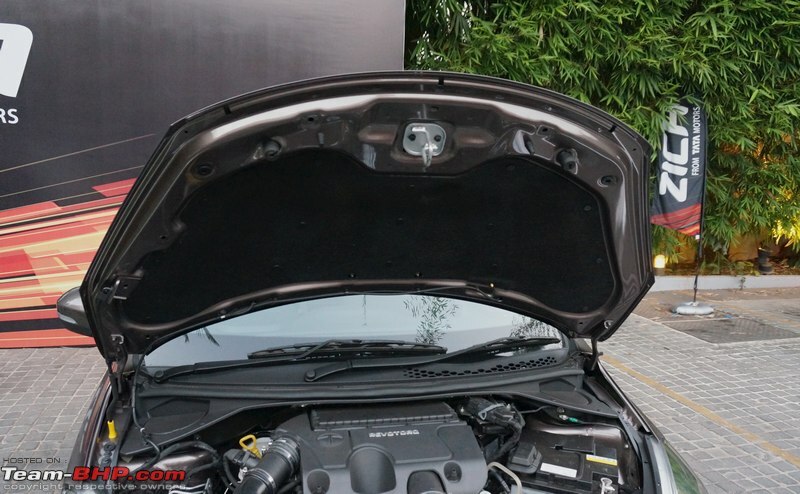 Open the hood and you'll appreciate the fantastic job done by the engine mounts to minimize the petrol's mental vibrations! 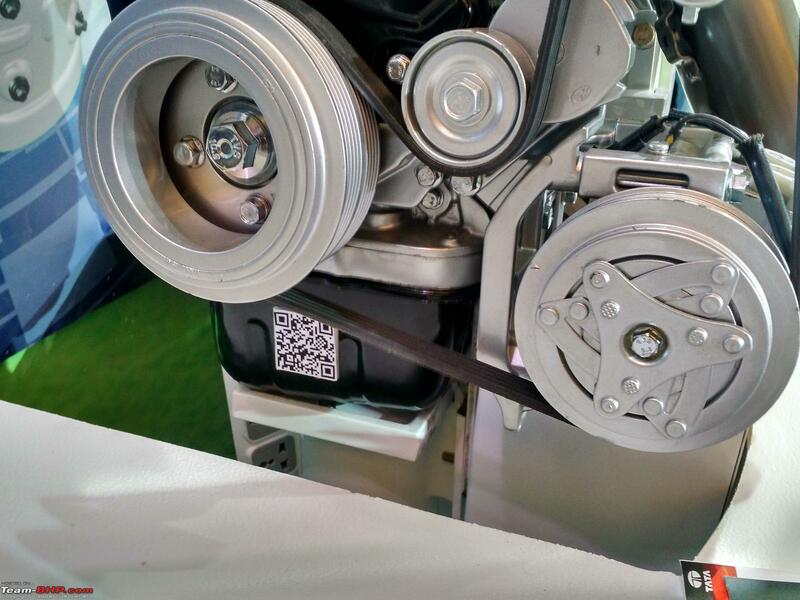 Tata claims to have added a bed plate on the lower part of the crank case for rigidity & lower NVH. You can literally see the engine dancing about violently, but vibrations felt on the other components are only a fraction of that. 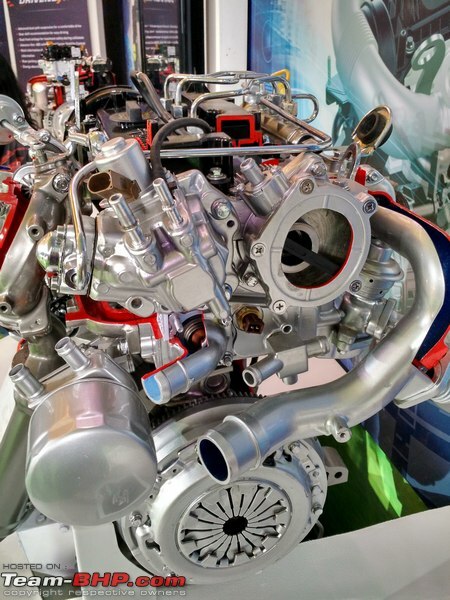 To keep the cost of ownership & maintenance low, this engine boasts of hydraulic lash adjusters (no periodic valve tuning), a chain-drive and an auto-tensioner at the front-end Accessory Drive (increases life of the entire system, reliable and minimizes frictional losses). This is the same engine that was showcased at the 2012 Auto Expo in the Manza Hybrid. 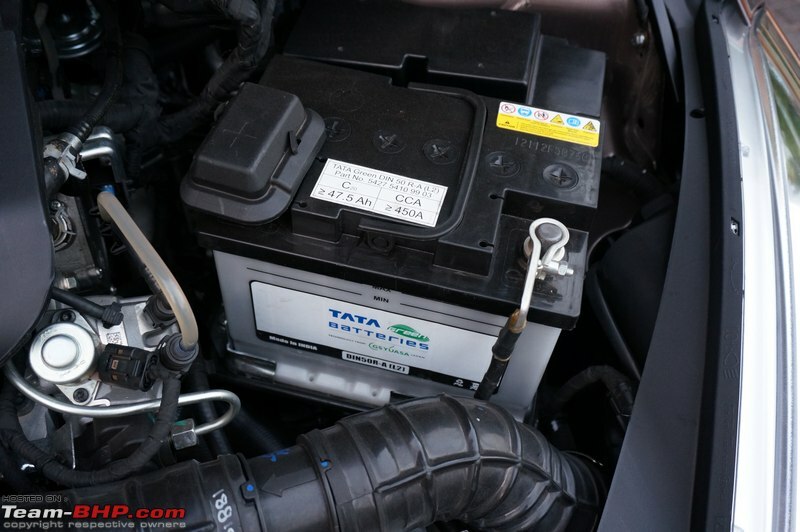 Obviously, over the years, Tata has given it many updates and bumped up the output too. 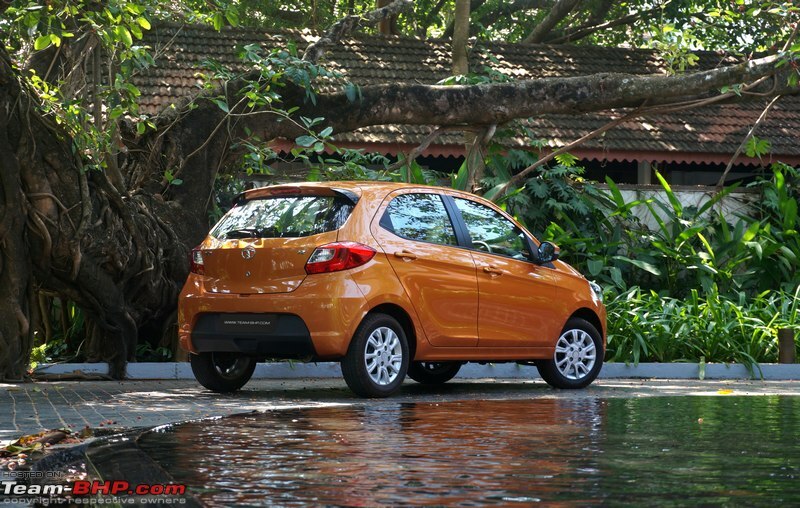 Its performance figures are similar to the 1.4L Indica eV2, despite having 1 cylinder less. Step into the diesel after the petrol and you'll be a little confused! Quite contrary to the petrol's characteristics, the diesel felt more refined and the overall engine sound was noticeably muted in comparison! 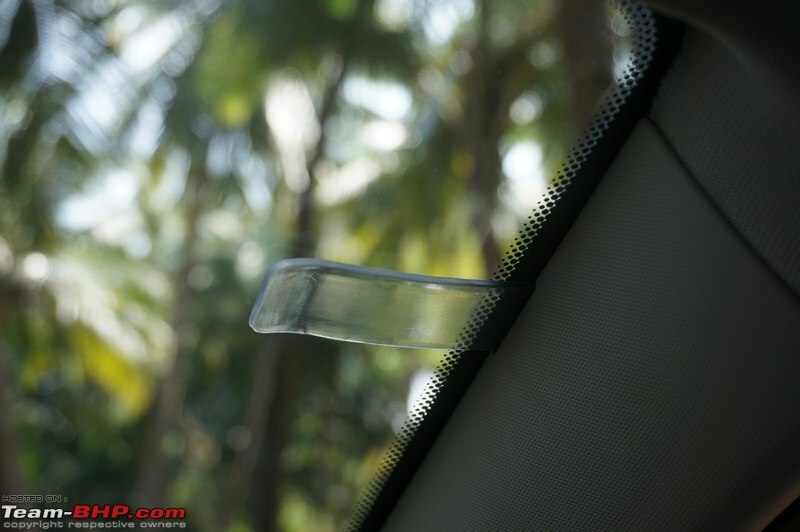 Yes, there were vibrations felt across the cabin - steering, gear lever, pedals, seats etc. However, these aren't present to an extent of being a deal breaker. When idling, the diesel is definitely less lumpy than the petrol. The diesel is also a lot smoother off the line. It effortlessly picks up speed from a standstill and feels zippier. Tata has tuned the engine well. 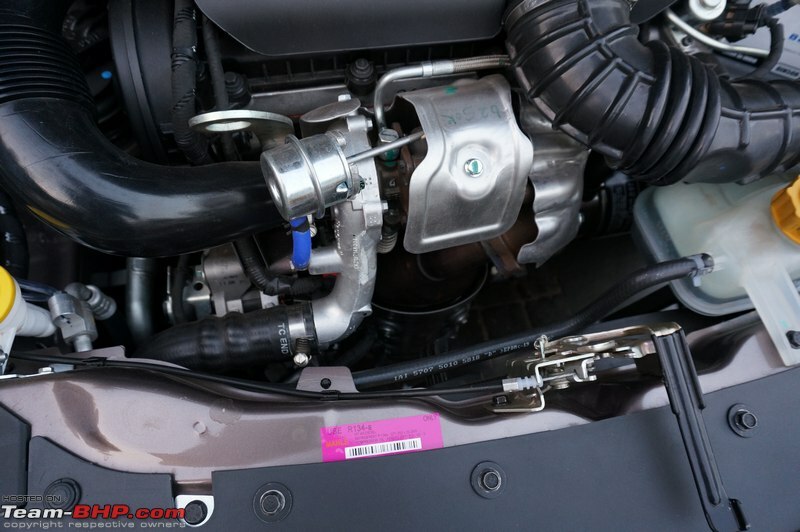 Because of the small turbo and short gear ratios, there is almost zero turbo lag. 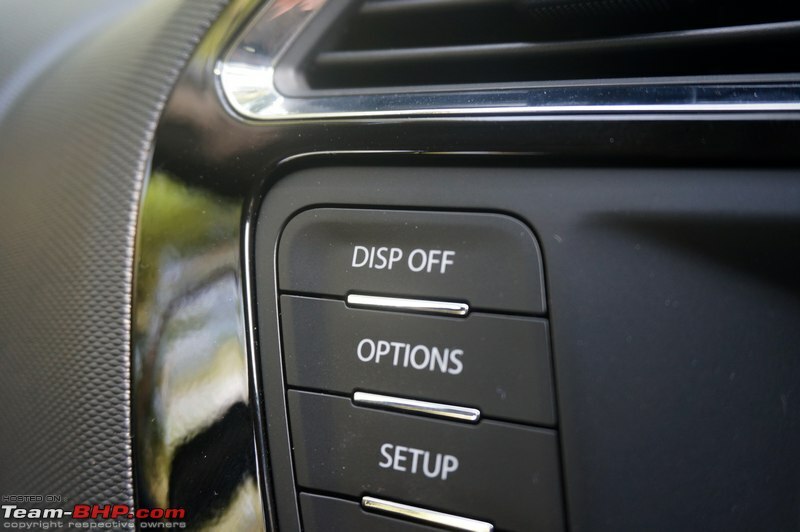 It doesn't complain while pottering around in a higher gear at a lower speed, neither does it beg you to downshift. 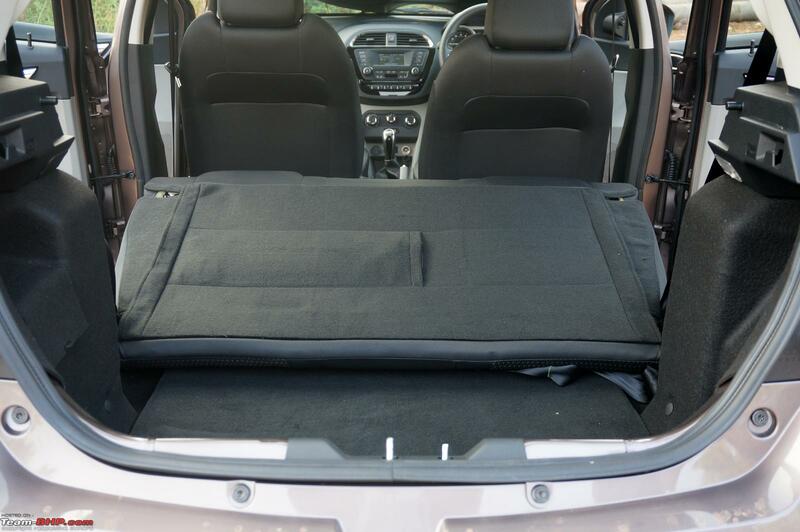 The Revotorq is very driveable & owners will appreciate this in their daily commute to work. Boost is felt past ~2,100 rpm, yet power delivery is overall linear in nature. Power continues till ~3,800 rpm, post which it starts to taper off. If you insist, the diesel will rev all the way to 4,800 rpm, but there's no point going beyond 3,800 (it's not got anything at the top end). 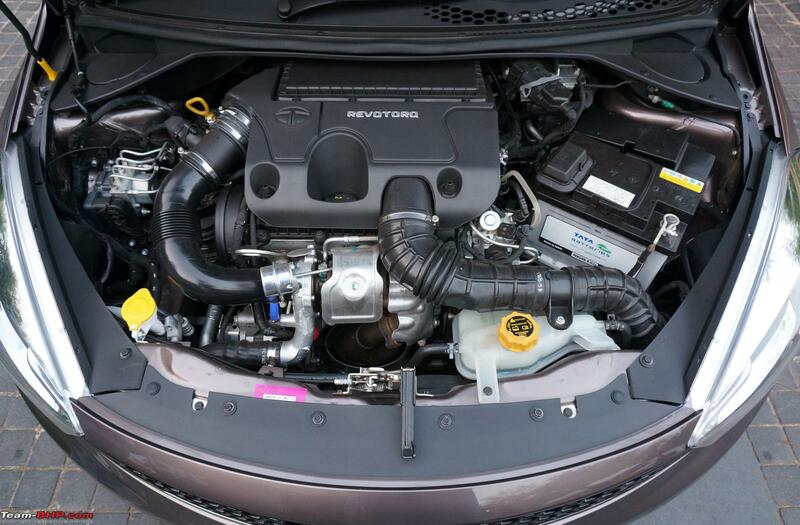 The diesel has a narrower power-band than some others. 100 kph comes in at 2,500 rpm in 5th gear. 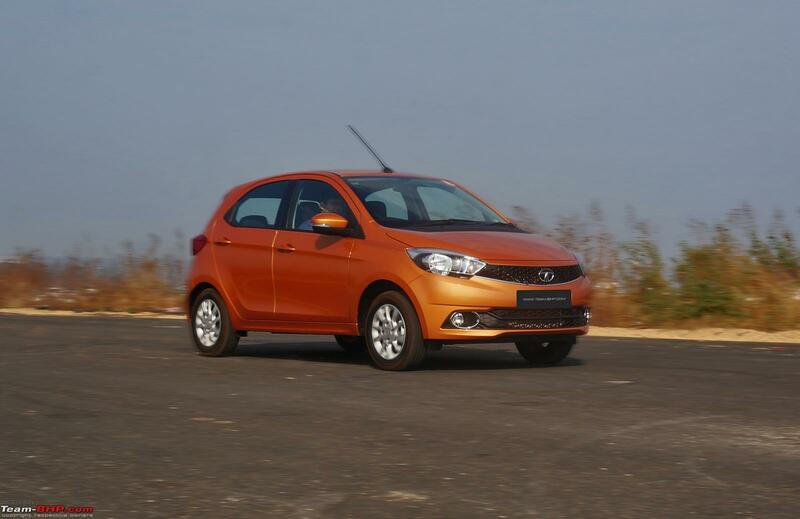 Unlike the petrol, the Zica diesel doesn't feel as gutless beyond that speed. That said, it's no road burner either (far from it). Overtaking fast moving traffic can be tricky. Not only will you have to plan the manoeuvre, even once you're actually overtaking, the short third gear (max 100 kph) necessitates an upshift midway through the move. This car will do good to keep up with highway traffic and nothing else - power is commuter-like. I must mention a scary incident - the mats of the diesel were a size bigger. In the middle of an overtaking manoeuvre, I pressed the clutch for an upshift, but the pedal never came back up!! 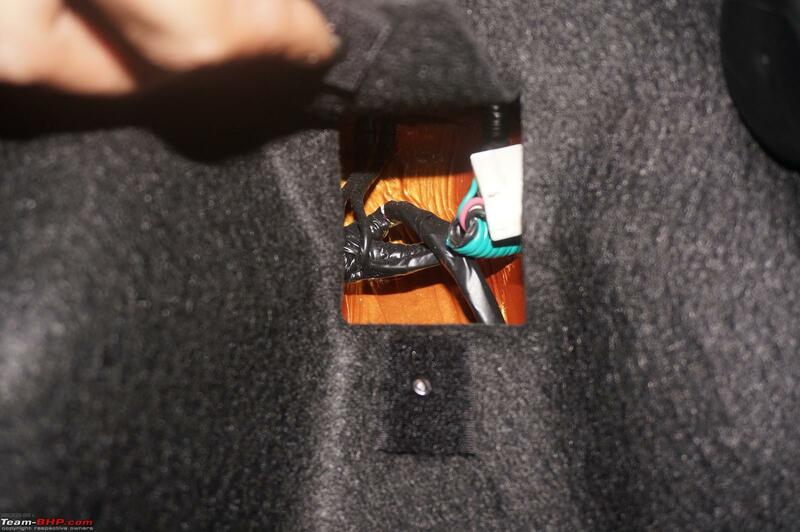 The damn thing had gotten stuck at the top edge of the mat putting us in a risky situation! 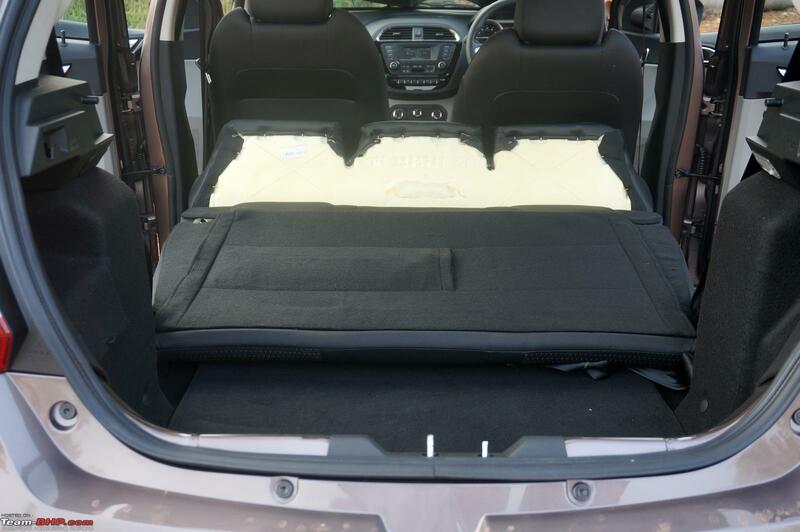 We have given feedback to Tata on this mat design issue. The diesel's engine note is more like that of a 3-cylinder petrol than an oil-burner! 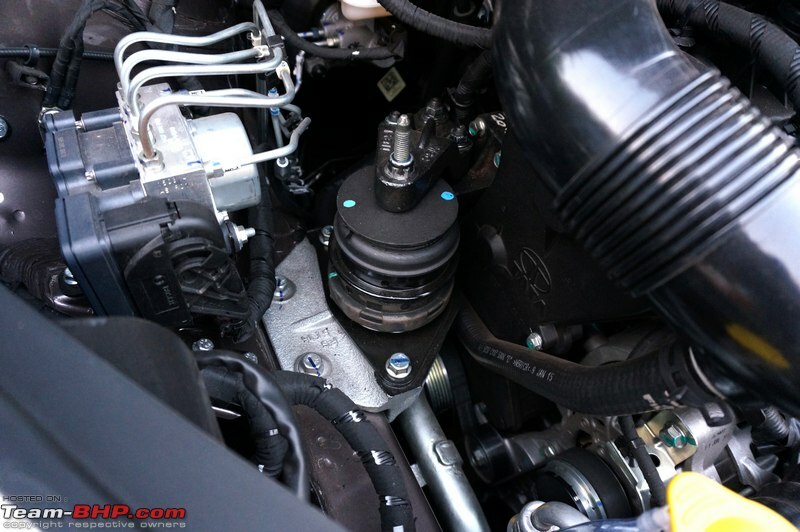 Diesel clatter is less, but it has that typical 3-cylinder thrum. 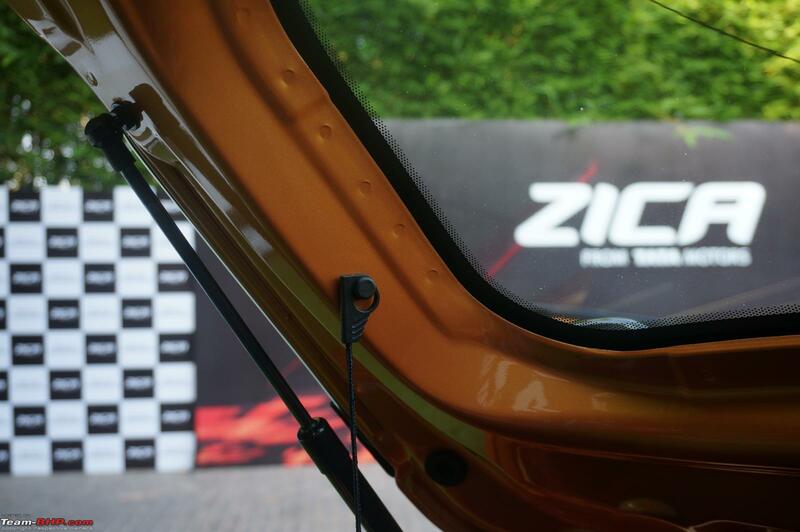 Stand outside and you'll be able to hear the engine sound, but on the inside, the Zica is surprisingly silent. 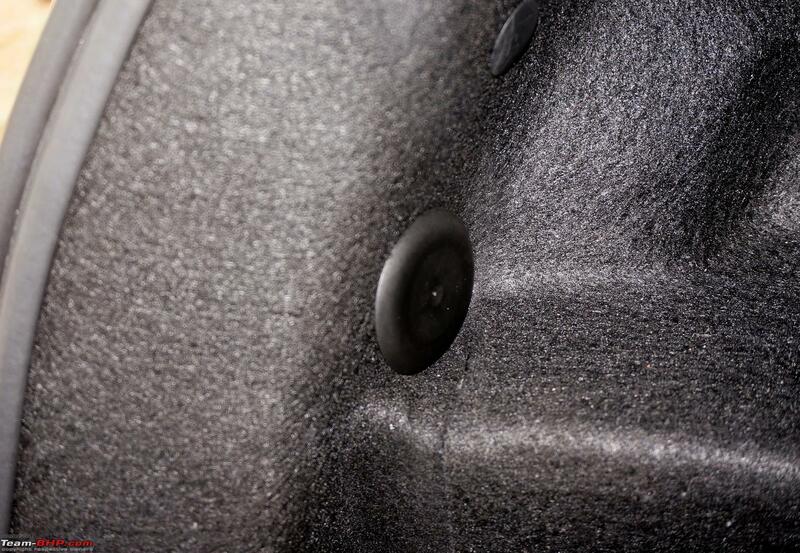 Tata claims to have used a sound deadening sump for superior noise insulation. 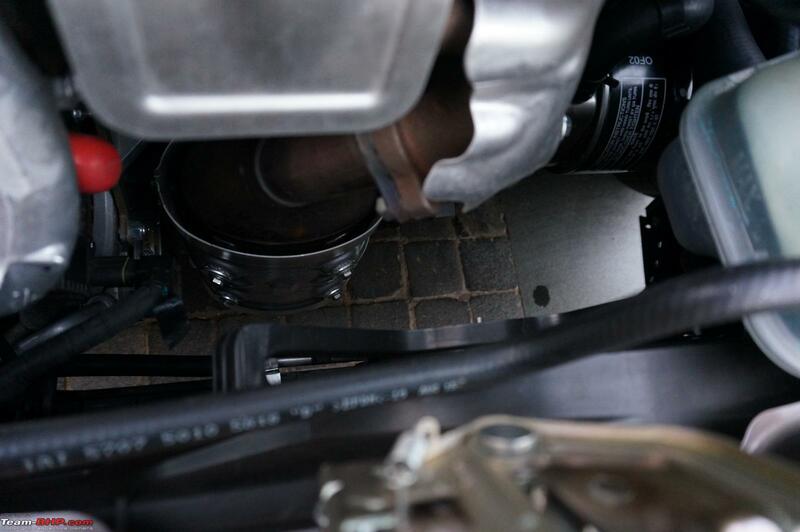 That drivetrain jerk that we observed in the petrol was also missing here. 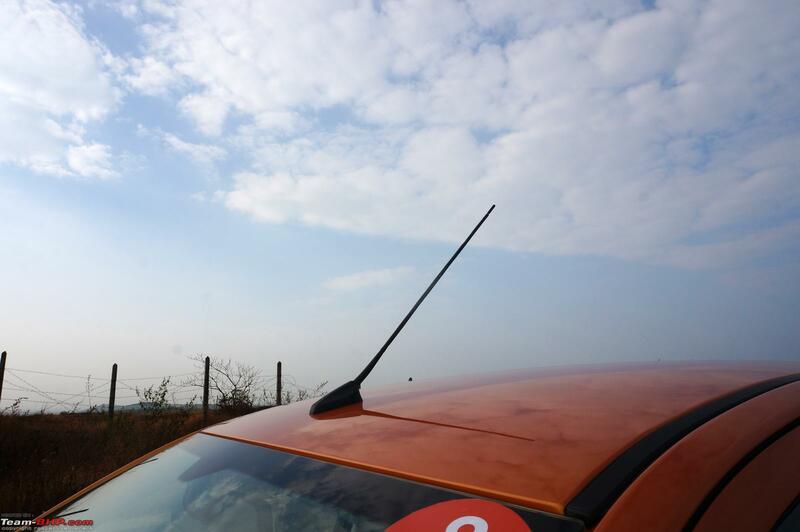 Wind noise however was identical to the petrol. Between the two engines, we'd pick the diesel. It's more practical & likeable. 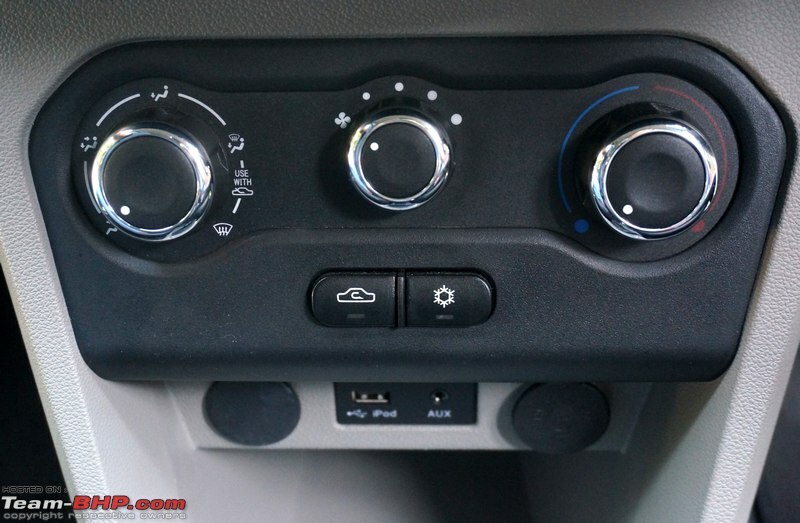 Both engines use the same TA65 gearbox (also seen in the Indica eV2), albeit the diesel's clutch appears to be different to handle the additional torque. 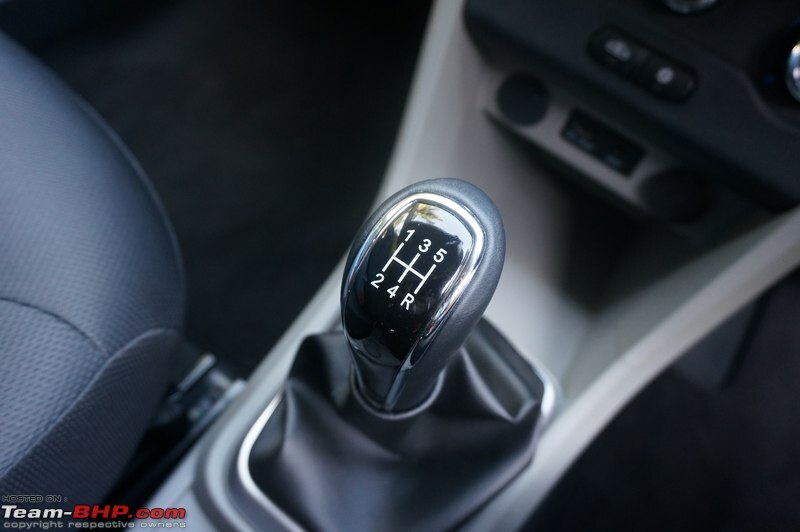 The 5-speed manual gearbox's throws aren't long and the shifter's operation is decent. At times, it feels almost as slick as the Celerio's, but requires more effort to slot in compared to my Grand i10. There is a tendency to mis-shift between 2nd & 3rd though and the gearbox isn't sure-slotting. 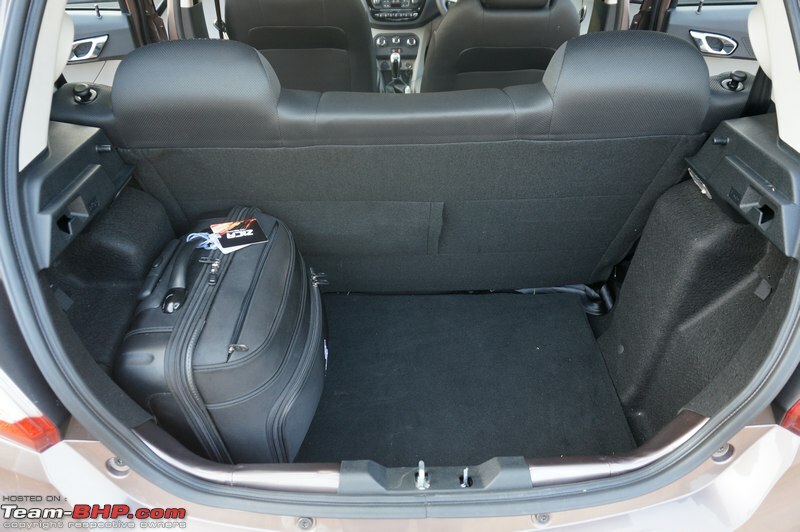 Still, for a budget hatchback, it does the job just fine. 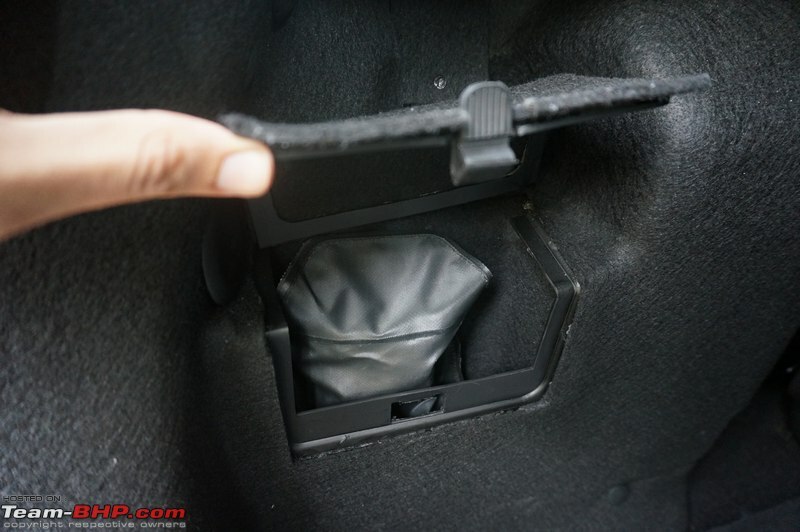 The clutch is light and has a short travel range. Vid6639 particularly complained about the petrol's clutch which felt almost lifeless and didn't communicate shift points to the driver. 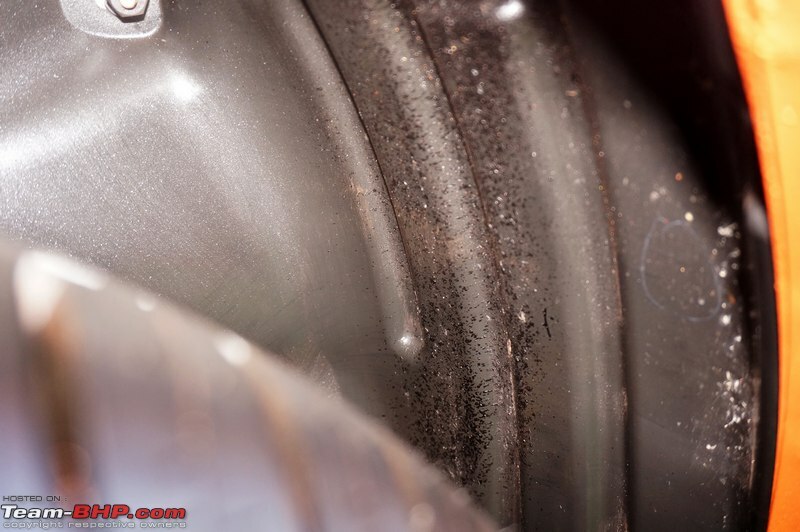 The diesel's clutch, on the other hand, fared better in this area. The light clutch is a boon in bumper-to-bumper traffic conditions. 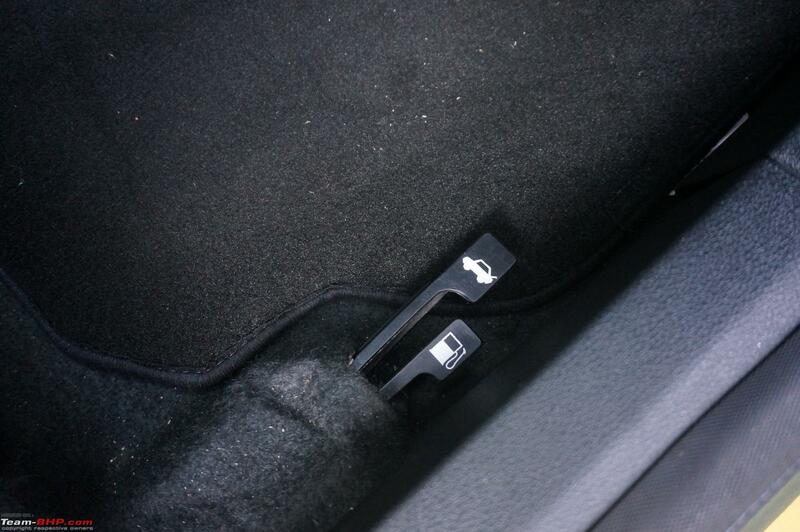 There's even a dead pedal to rest your foot. 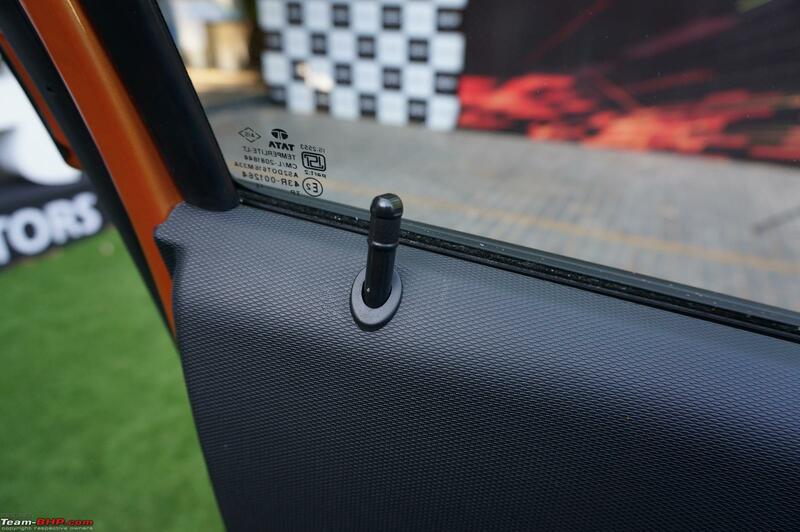 Although it is placed a tad too high, we appreciate the fact that Tata has included this feature in here. 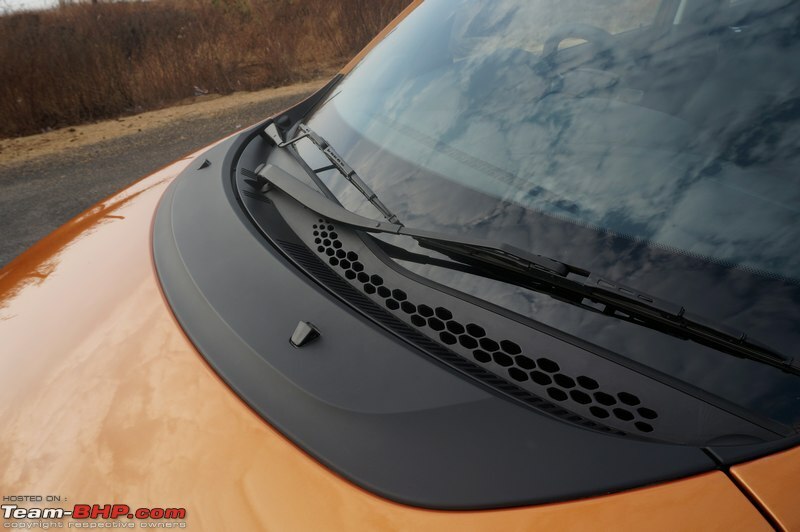 Tata cars are known for their absorbent ride quality and the Zica is no different. It glides over broken roads and dismisses smaller potholes with a muted thud. 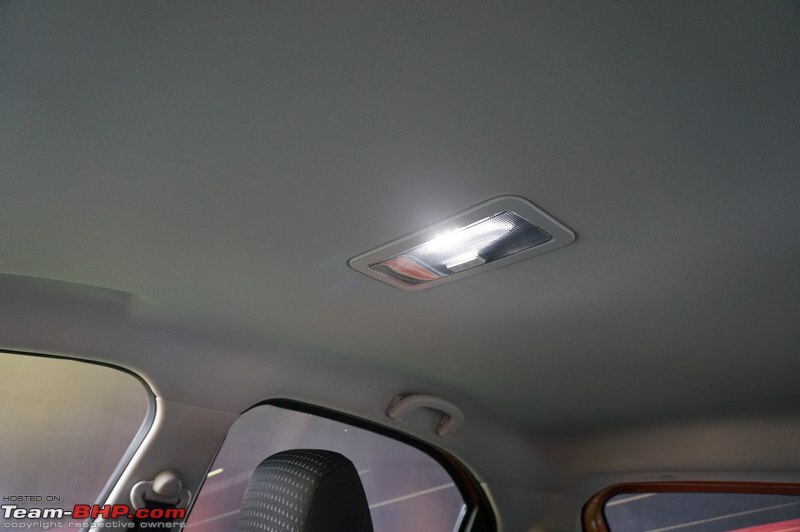 The larger ones do filter in, yet the impact is adequately absorbed and the car doesn't toss you around like some other hatchbacks would. The suspension does its work silently too, without complaining. Must mention, there is nearly zero vertical movement after hitting a rough patch. Mid-corner bumps don't unsettle the car's composure and the rear end is well-behaved. 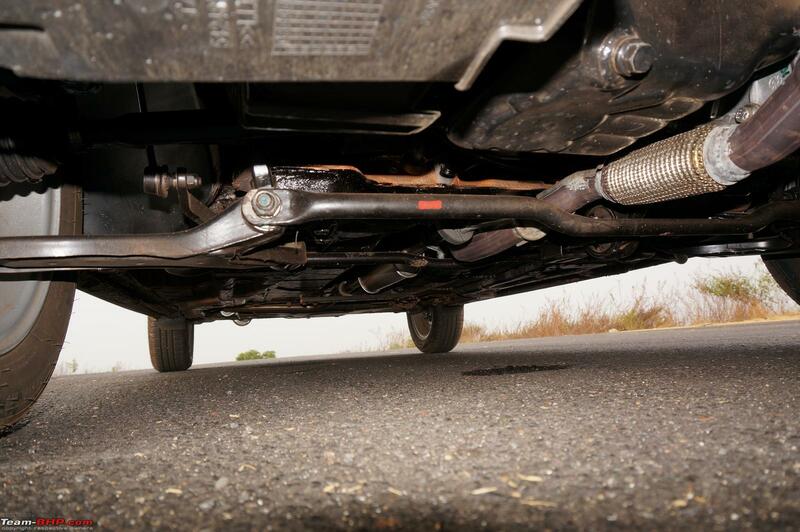 The Zica is equipped with an independent front suspension and a semi-independent rear setup - twist beam with dual path struts. 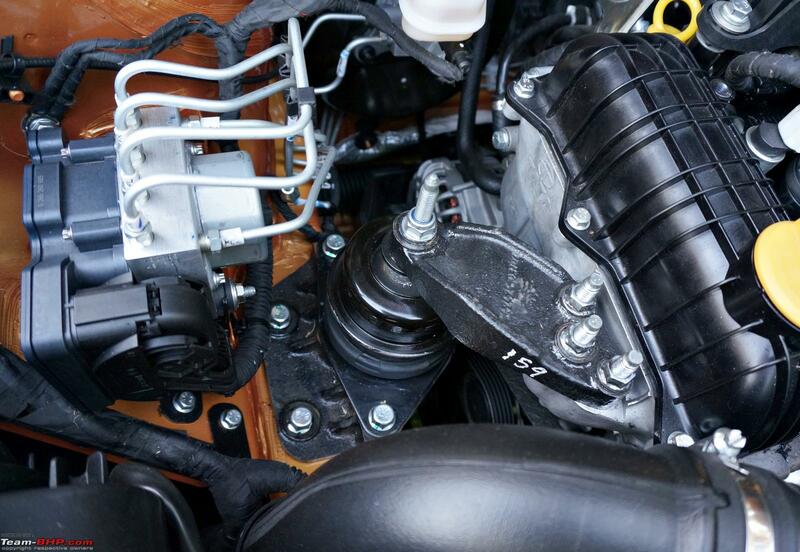 This type of strut has two separate paths for energy to be transferred from the springs & dampers, thus it allows them to tune the car better for ride and handling. 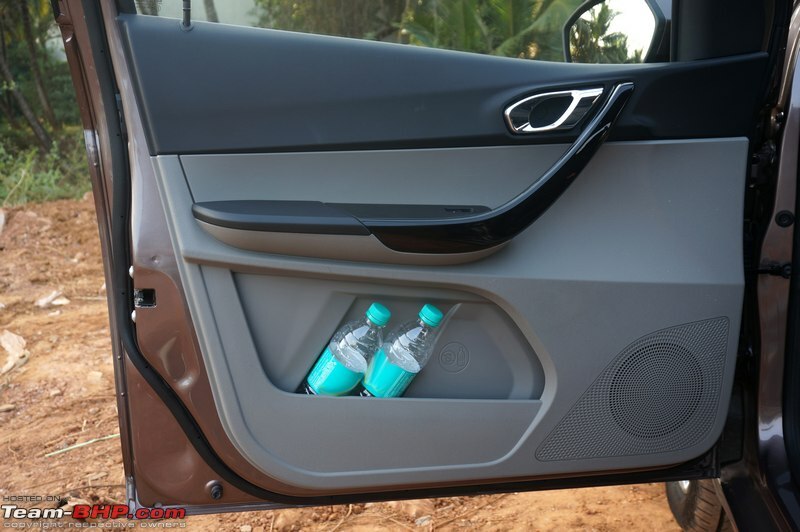 It's a 2 cup system which Tata claims no other hatchback from the segment has. 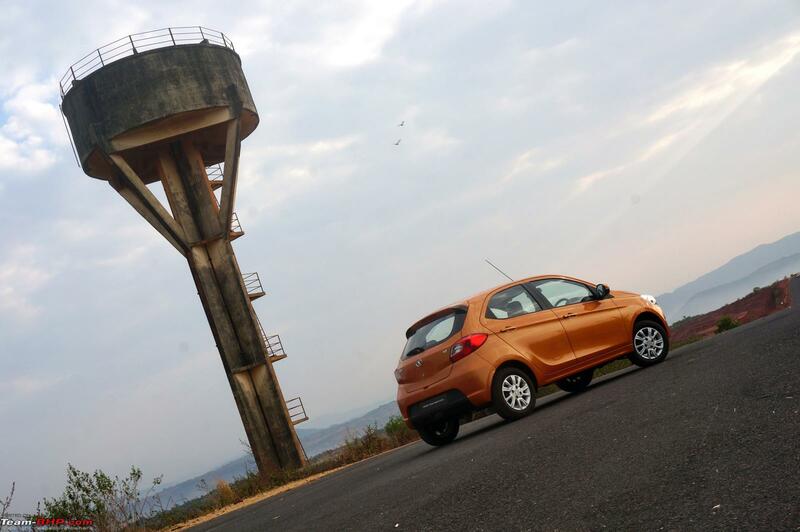 When in a mood to push the Zica around, the diesel felt more stable. 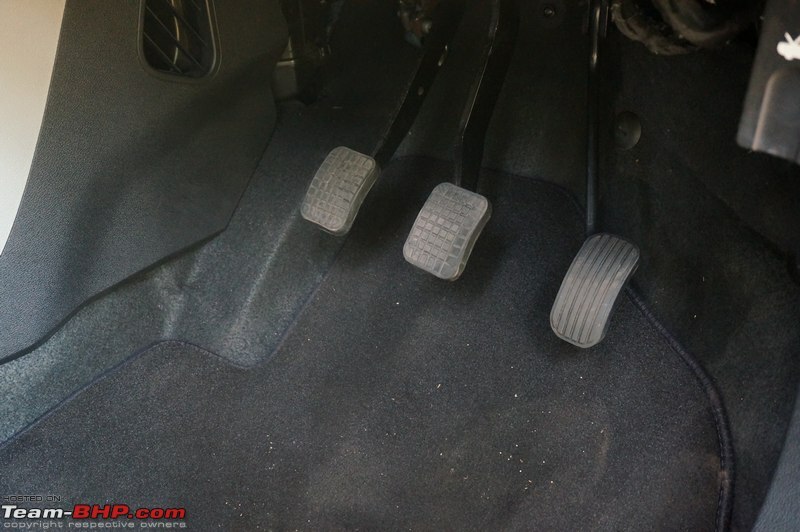 It holds on to its line and doesn't understeer easily. Straight-line stability is very good for the segment and the dynamics are overall safe & conservative...just the kind of neutral behaviour you'd expect of a family hatchback. Nothing to write home about, nothing to complain about either. The electric power steering is one of the nicer units around. Being smaller in diameter (360 mm), it's very convenient for urban commuting and manoeuvrability. It's light at city speeds and weighs up sufficiently as the speedometer needle climbs. 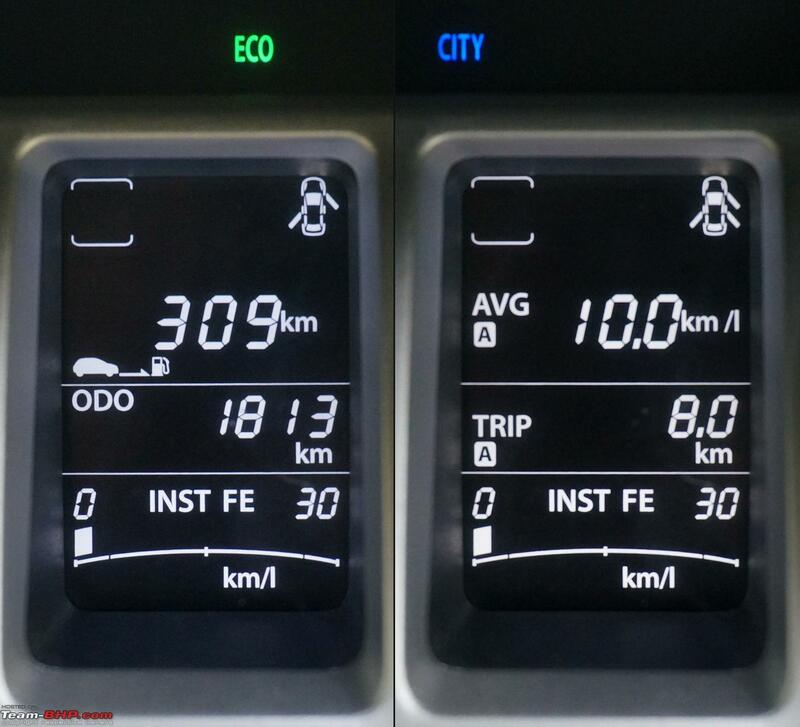 We both agreed that the diesel's steering was noticeably firmer, while the petrol's was one-finger light. Still, it isn't lifeless and does give you some feedback of what the front wheels are up to. 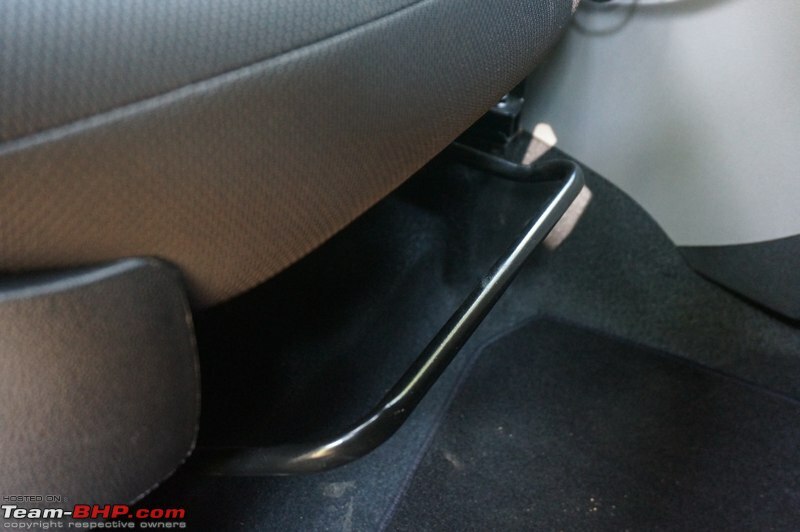 At higher speeds, you get the confidence to chuck the car around a little due to its weight. I liked this steering much better than my Grand i10's inconsistent EPS. 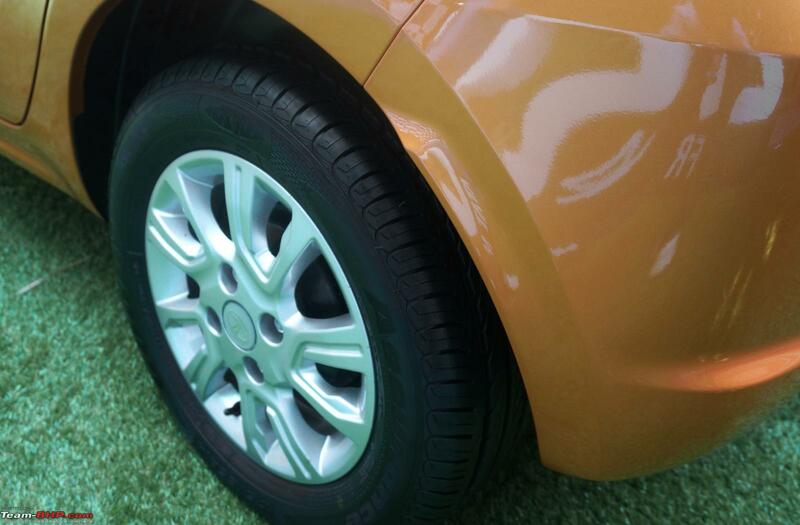 The Zica's brakes are equipped with Bosch's 9th generation ABS + EBD. We felt that initial brake bite is missing, but after that, they are progressive and do the job as expected. That initial lack of bite will take some getting used to. 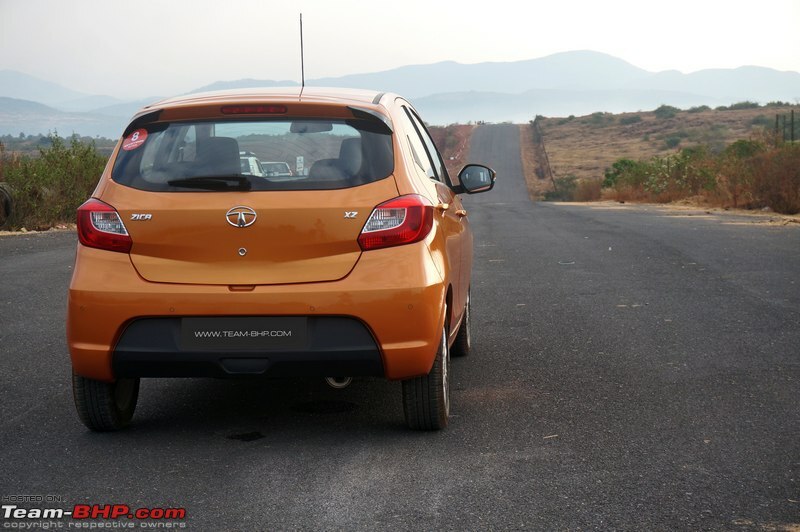 The brakes have cornering stability control too (Tata says "CSC supports / stabilizes the vehicle during partial braking in curves by reducing pressure at the required inner wheel. 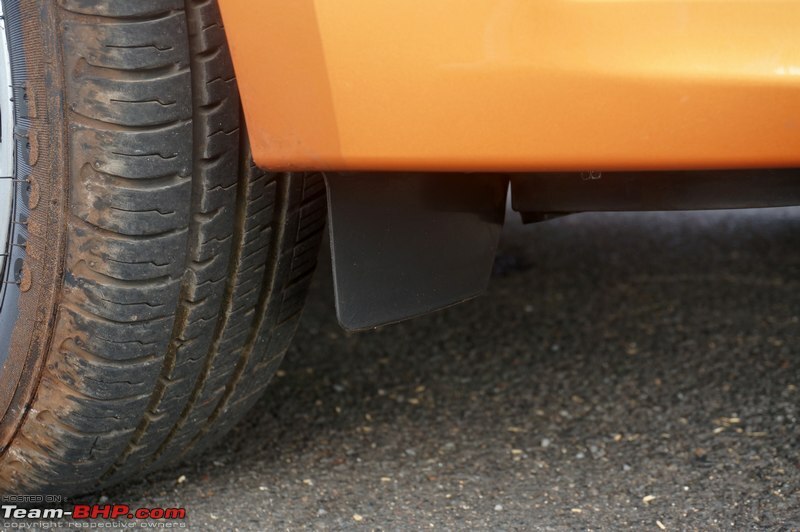 This helps to reduce the probability of vehicle oversteer during cornering + braking"). Last edited by GTO : 11th April 2016 at 15:40. 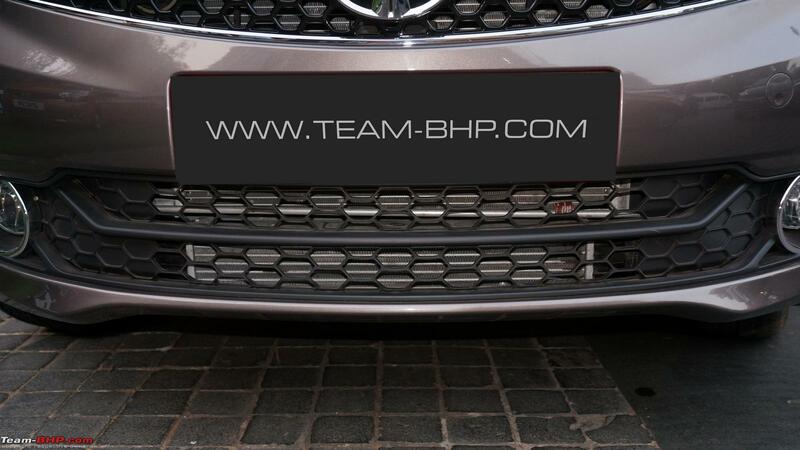 • Team-BHP was the first to break the news of Tata signing Lionel Messi as brand ambassador (link to news article). A lot of people are still confused as to why Messi was selected. 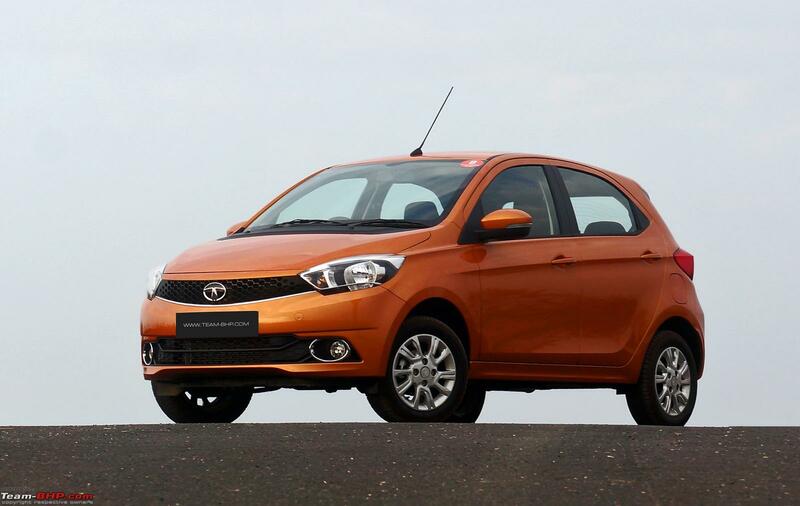 Tata Motors believes that, after Bollywood & Cricket, Football is the next big thing coming India's way. Messi is popularly referred to as one of the best footballers in the world and Tata thinks this contract will have a positive impact on the brand in the years to come. 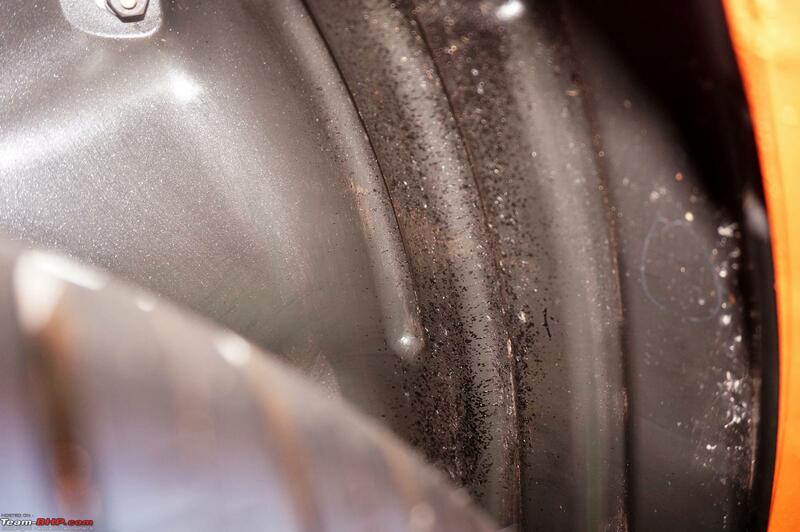 • Service intervals are too frequent - every 7,500 km / 6 months. IMHO, no car should be visiting the workshop more than once a year. Thanks to Arun Gv for pointing out the service schedule to us. • ARAI ratings are 23.84 km/l (petrol) and 27.28 km/l (diesel). 3-cylinder engines are usually economical, so it'll be interesting to see what real-world numbers our ownership reports carry. • The Zica would be a 'complete' hatchback if it had proper 4-cylinder engines. 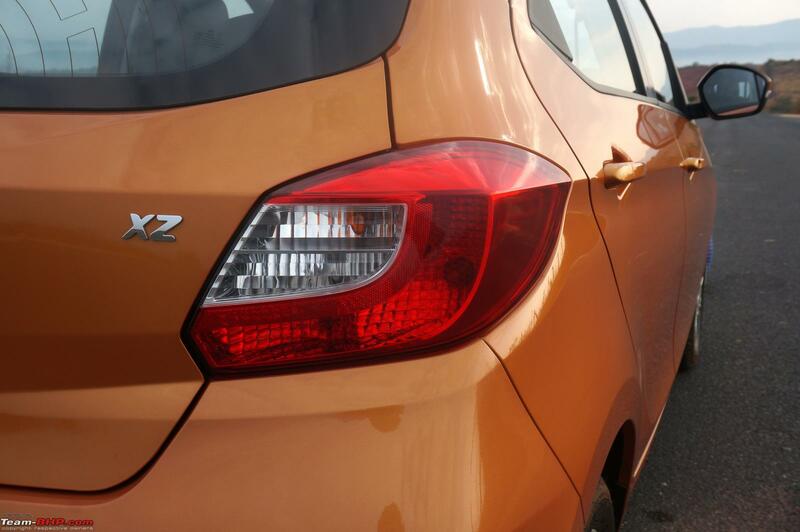 As things stand today, the weakest link in the Zica package is the unimpressive 3-cylinder engine range. Why didn't Tata give it 4-cylinder motors? Not like it's going to cannibalise the Bolt that's not selling anyway. To compete in the hatchback segment, Tata needs to go all out and push harder than the rest. They've done it with the design, the interiors, the equipment...why not the engines?! • Standard warranty of 2 years / 75,000 km. Extended warranty is available up to 4 years / 100,000 km. Take it, these are brand new engines! • Will be launched with 6 metallic body colour options - Pearlescent White, Platinum Silver, Espresso Brown, Sunburst Orange, Berry Red and Striker Blue. 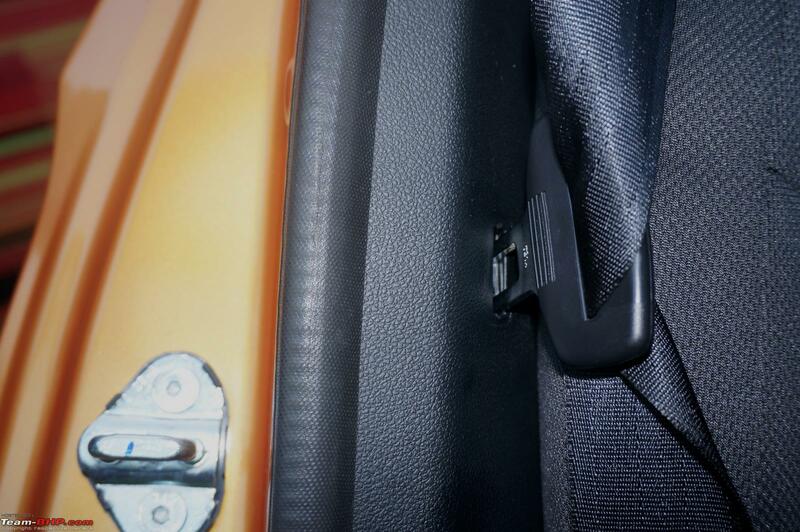 • The Red and Orange Zica (only) come with an option to match the side air-con surrounds, door grab handle, centre console etc. in body colour. If you don't choose that, these parts will be in piano black (as it is for Zicas of other body colours). 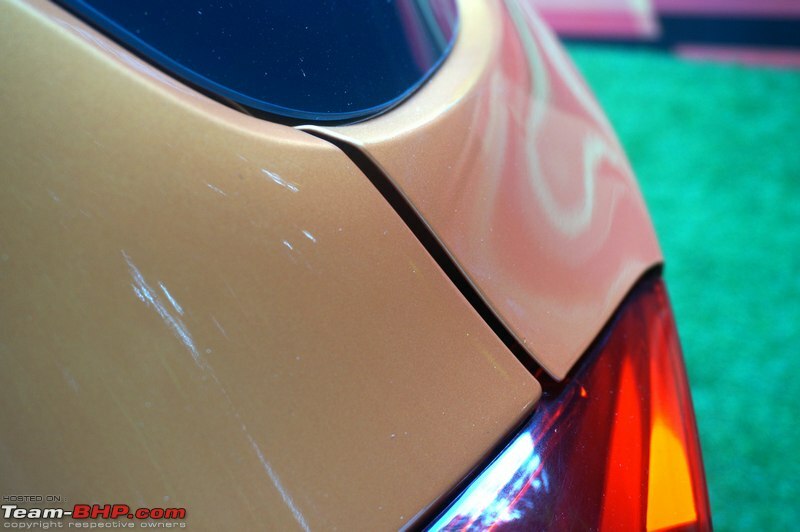 Painting done at the dealer level (unfortunately). • Turning radius is 4.9 meters. 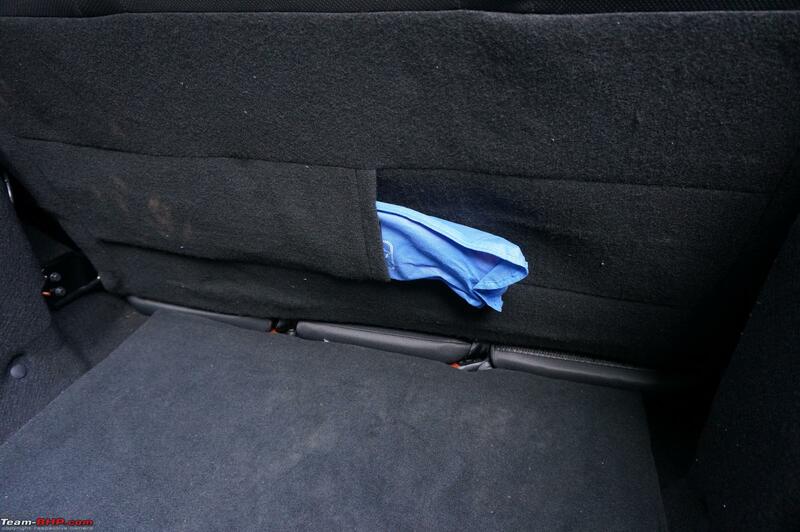 That's more than expected for a car with this footprint (Celerio = 4.7m). 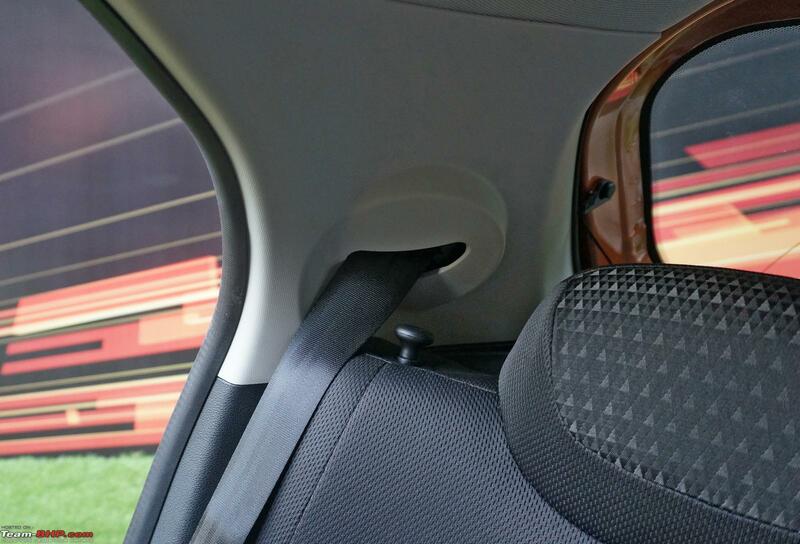 Even the Swift & Grand i10 are tighter. 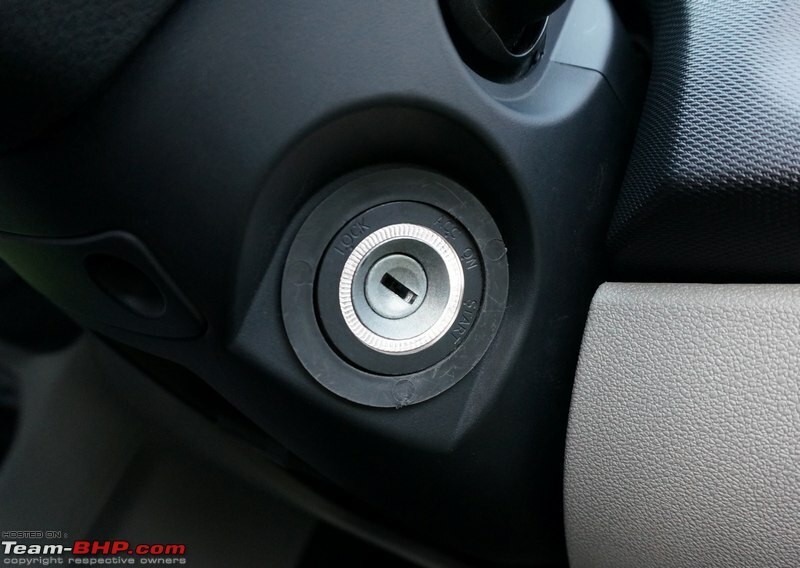 • If you try to lock the car and partially leave any door (or the boot) open, it'll give you an audible warning by honking once. 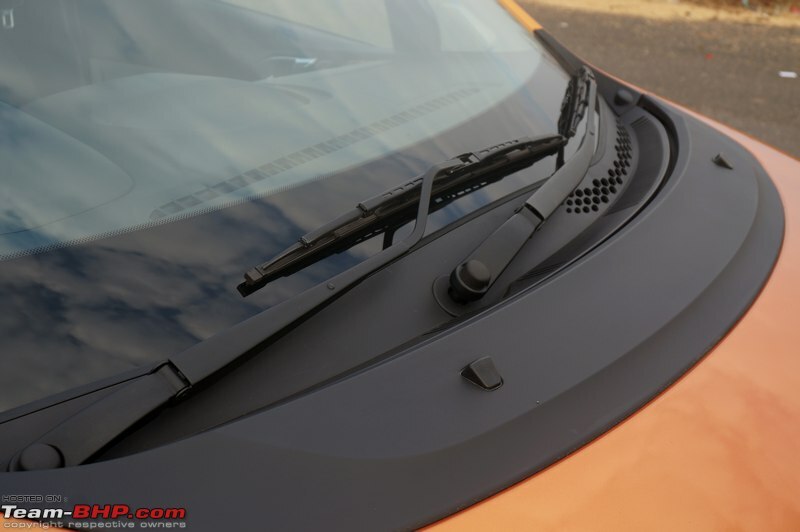 • With the front wipers on, engage reverse and the rear wiper will turn on automatically. 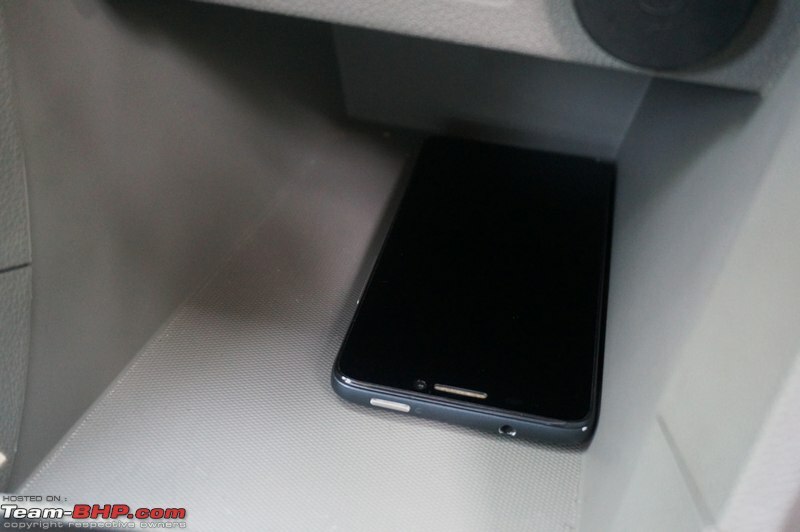 • The base variant was snapped inside the factory recently (link to news article). 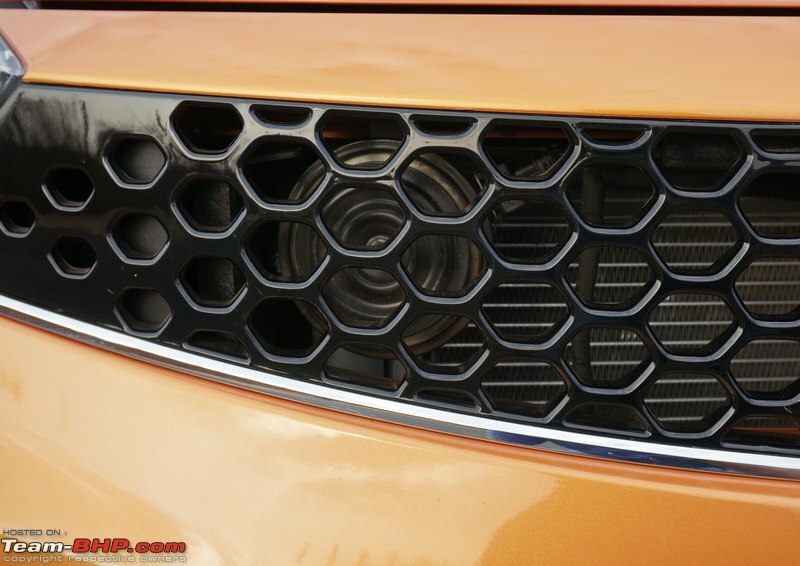 This might be an export model as it gets a rear foglamp, while our test cars didn't. 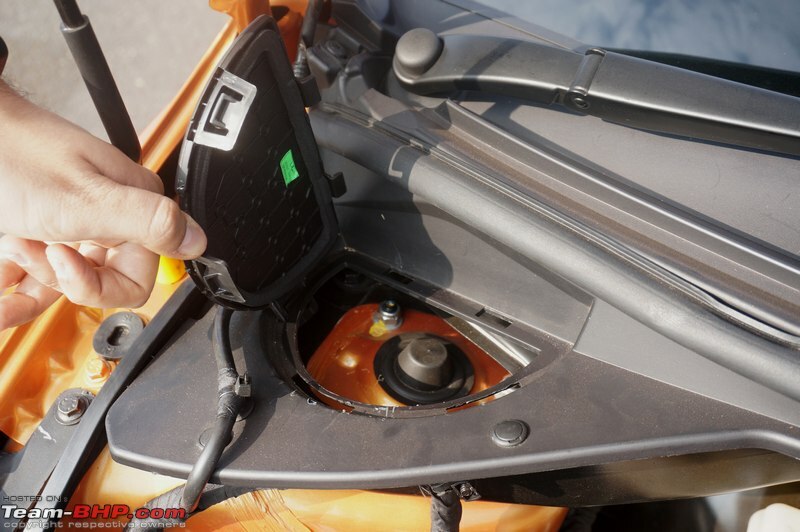 • Fuel tank capacity = 35 liters. 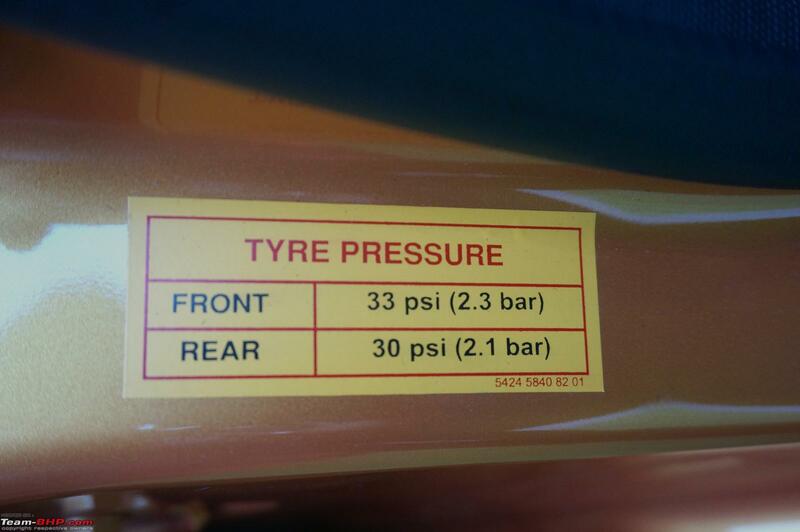 • Lower variants ride on 155/80 R13 tyres = plusher ride quality (due to a taller sidewall), compared to the higher variant's 175/65 R14 tyres. • An AMT-equipped model can be expected in the future. Tata is currently facing supply issues from Magneti Marelli for the Nano & Zest. • Compact sedan based on the Zica is coming (link to news article). Rumours suggest that it might be named 'Sway'. 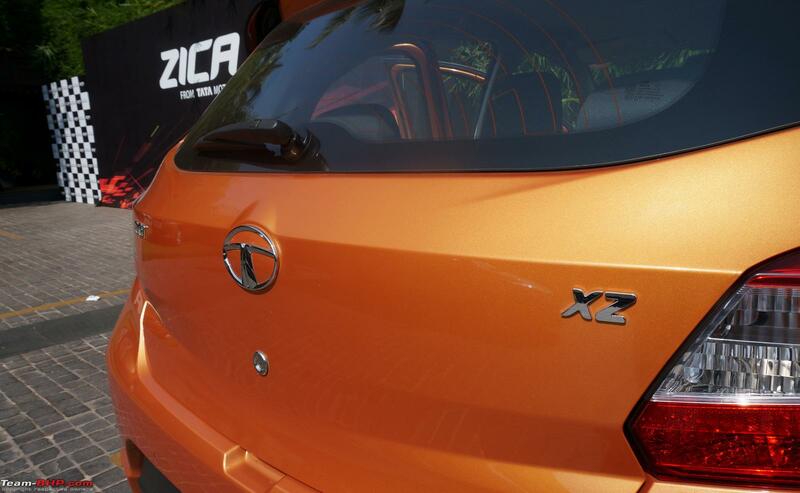 • In Portuguese, Zica means 'bad luck', so expect it to be renamed when launched in international markets. Yes, this car will be exported, including to South America (remember, they've hired Argentinian footballer - Messi - to fulfil their global ambitions). 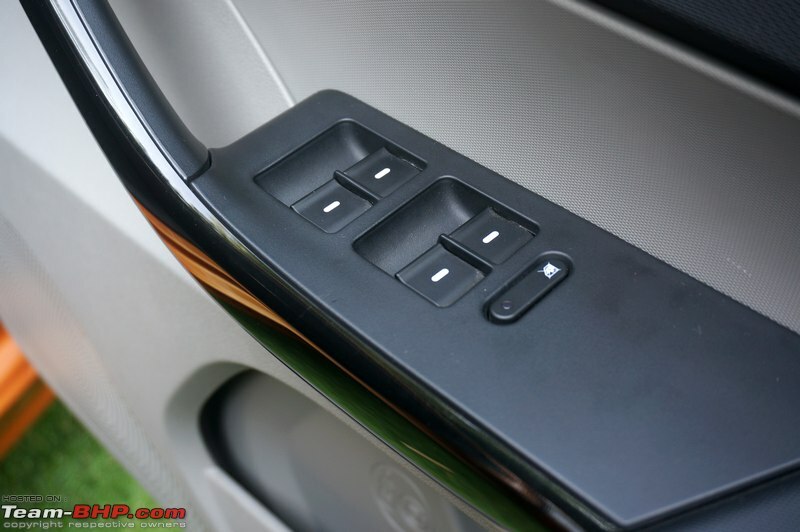 • Power windows have a 'delay' function. 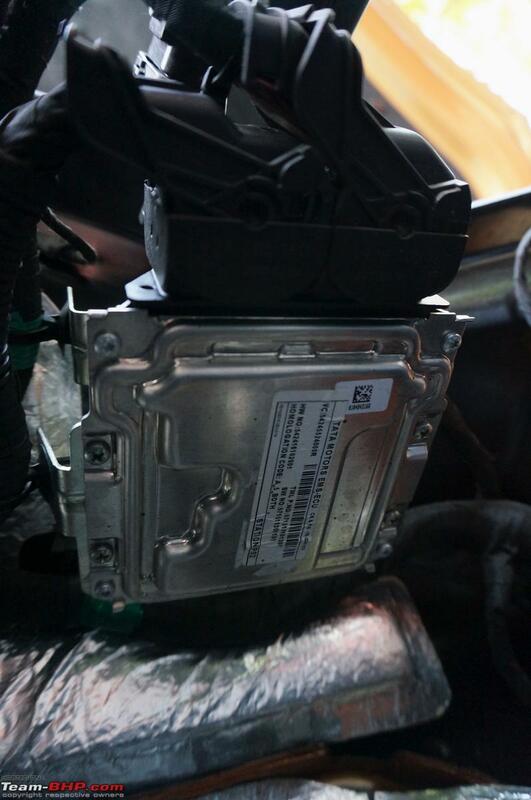 That is, they work for a little time after you switch the ignition off. Useful to roll up any windows that might have been left open. 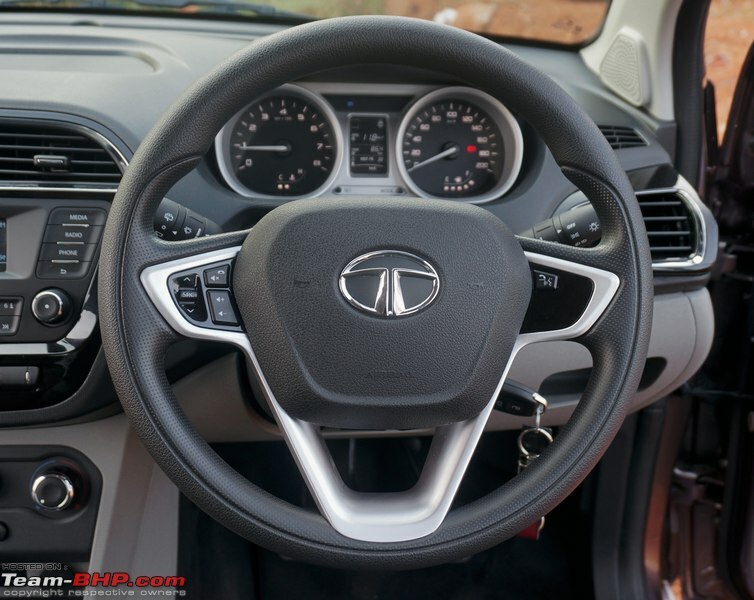 • Tata is clearly moving away from beige interiors (Zica, Bolt, Zest, Safari Storme, Aria...). Some will love it, others will miss beige. Dark colours might be easier to keep clean, yet there isn't a doubt that beige makes the cabin appear more airy & spacious. • This new design language is called 'Impact' (related discussion). 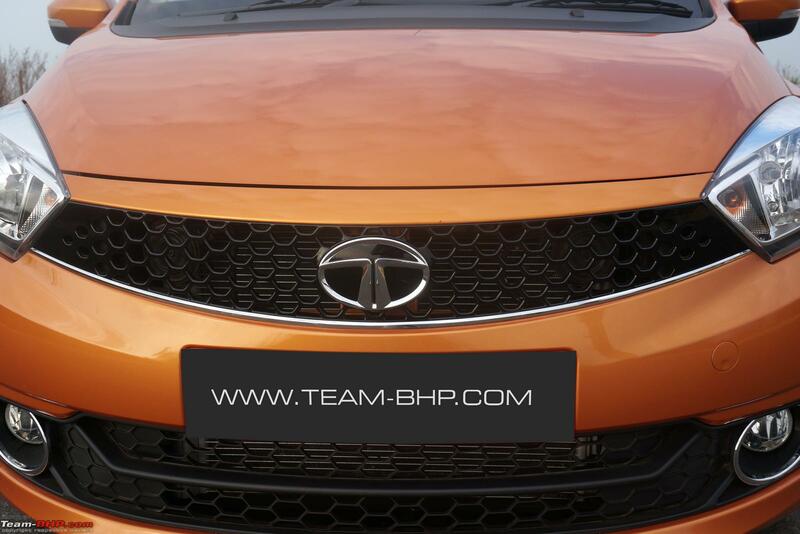 Disclaimer: Tata invited Team-BHP for the Zica test-drive. 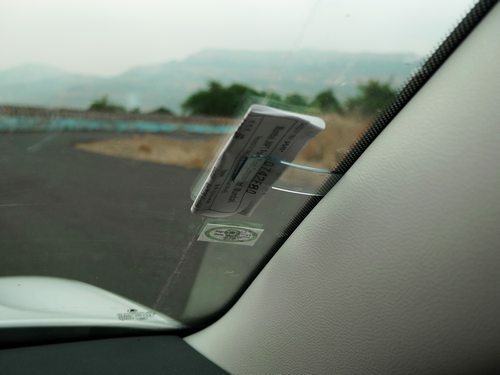 They covered all the travel expenses for this driving event. Kite would have been a nicer name, no? Last edited by GTO : 9th January 2016 at 16:37. 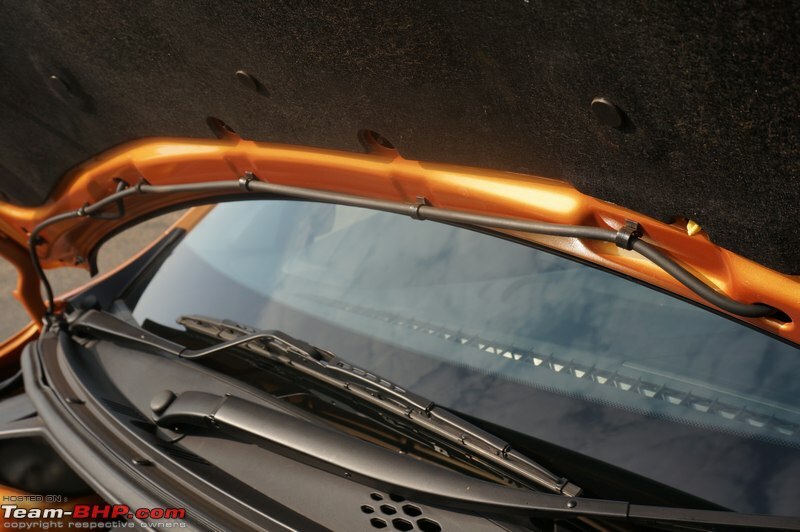 Features that are common across all variants. 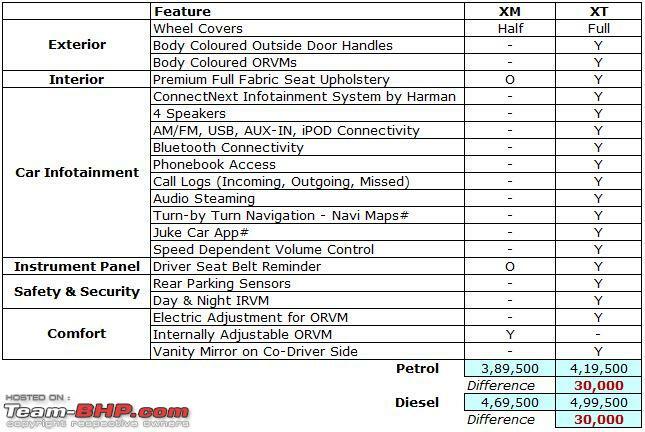 Features that comes with the Optional Pack on XE, XM & XT variants. 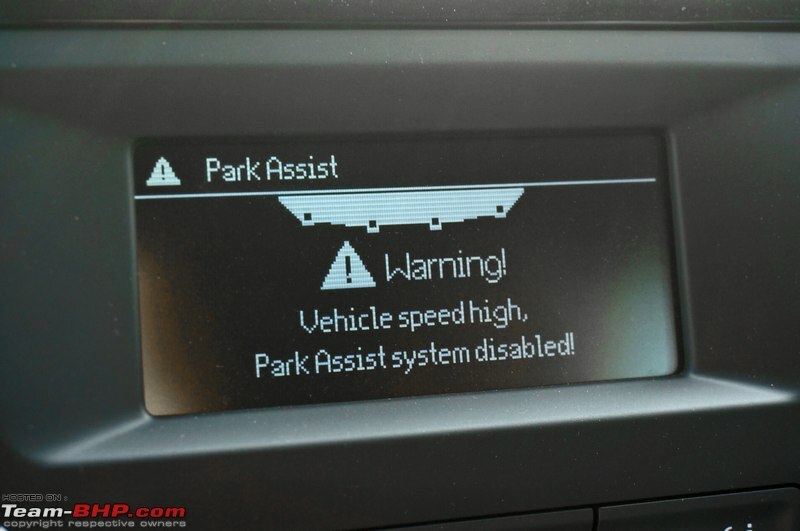 Note that two features are available by default in the XT variant. 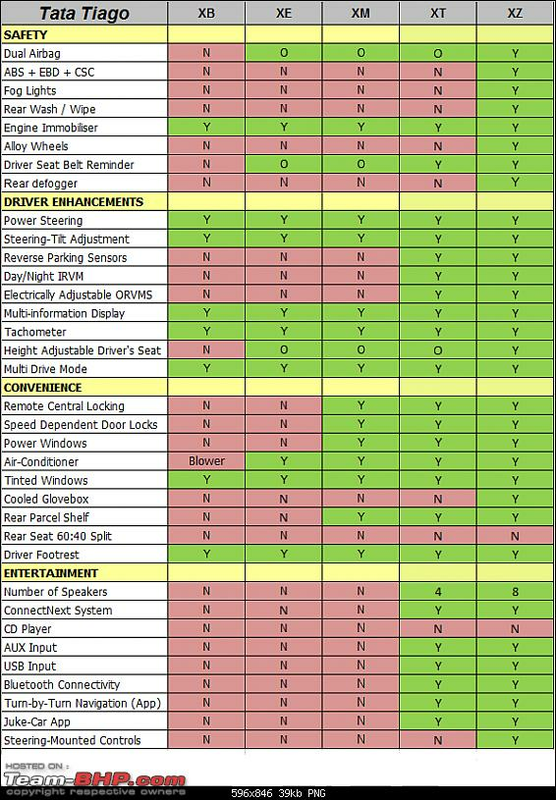 Variant wise features taken from TIAGO Brochure available on the website. In case there are any typos, please let me know. 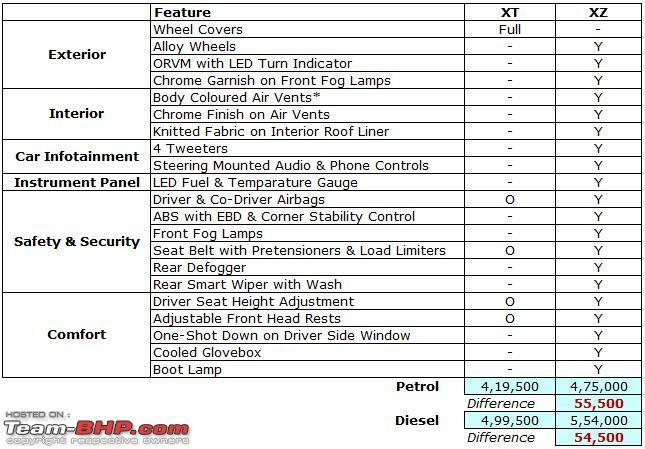 Overall excellent pricing by Tata. However I feel Tata should have offered A/C on the XB variant as well even at the cost of some price increase. Without A/C, this variant is only for marketing bragging rights on entry price. And optional pack should have been offered on XB variant as well. Last edited by GTO : 15th April 2016 at 09:08. Wow what an incredibly detailed review. Well built and competent, the Zica looks promising. 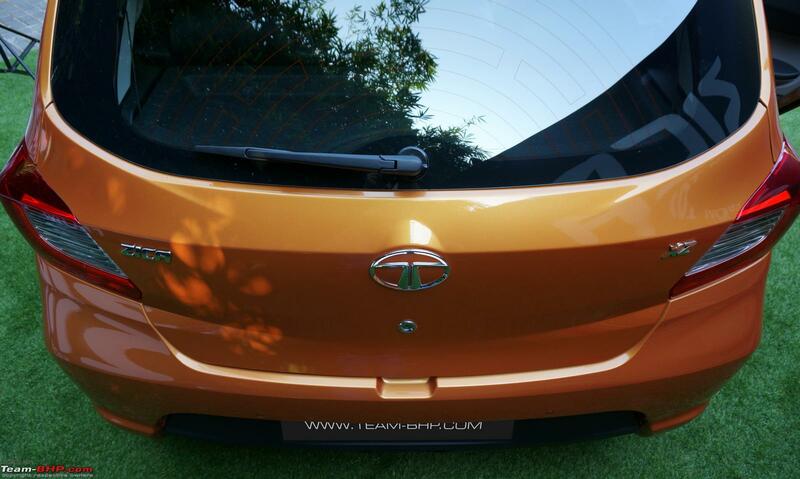 The stance looks great and the new Impact design philosophy makes this TATA a very non-TATA looking car. 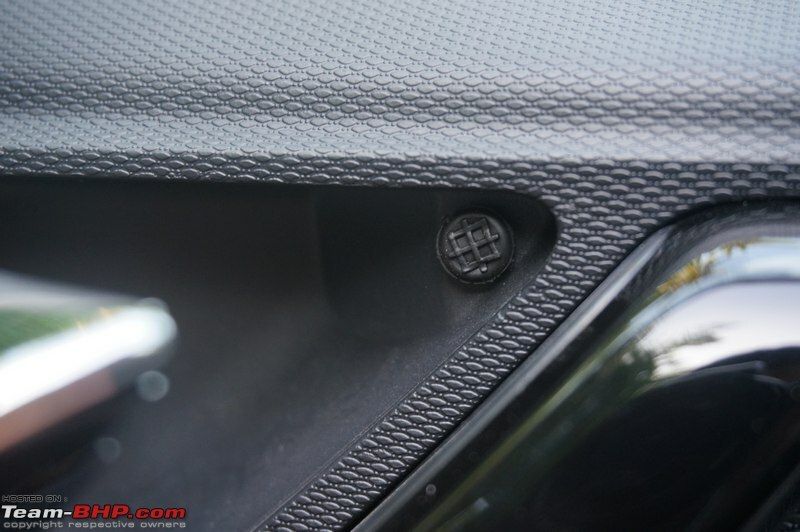 The piano black inserts in the interior ups the ante as well. The elephant family in the glovebox is a very unique touch no matter how insignificant it is on a car. I'm guessing TML has paid good attention to detail going by the reviewer's comments. However, as S2 has rightly pointed out, a more enthusiastic pair of engines would have made it an all-round package. 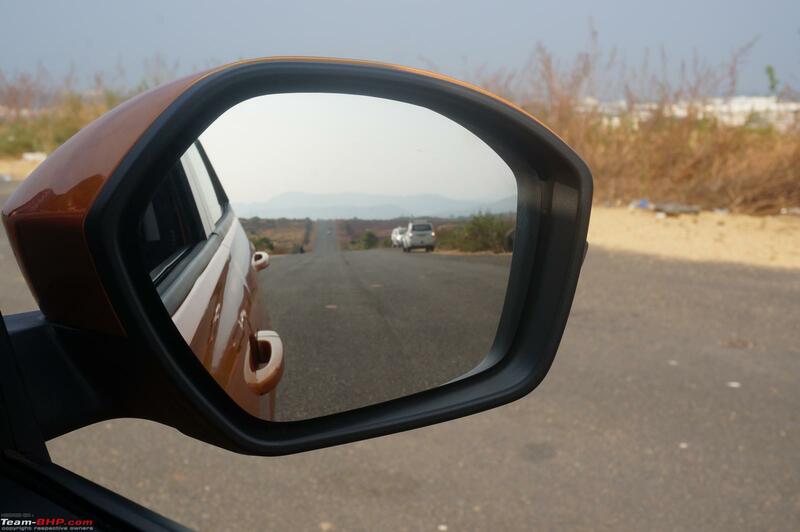 Nevertheless, a thumbs up to Tata Motors for the Zica. What a review! No one in India can match the way TBHP covers the details! 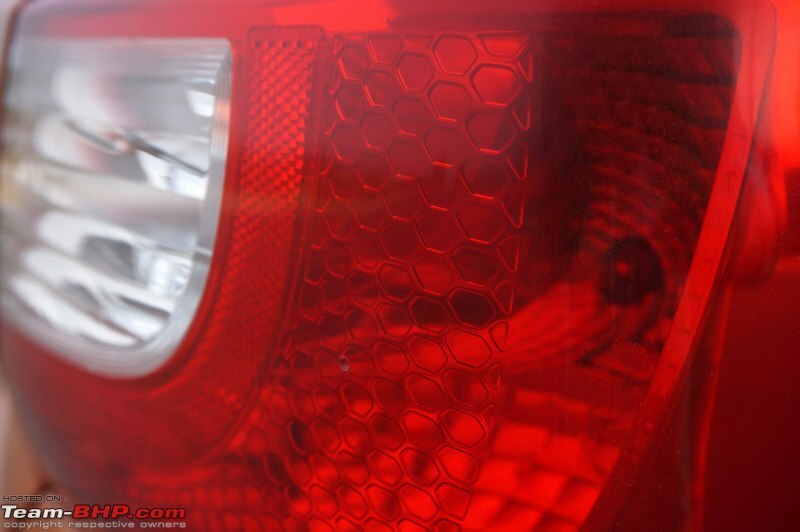 I think some of the details that you cover maybe never known to the owners even after years of ownership! Automags should learn from here on how to do reviews! Quite honestly I have stopped reading reviews from the automags for years now after getting used to the way cars are reviewed in TBHP! Zica seems to be good package! Tata had managed to pack in so many niceties that it doesn't look like an entry level hatch! 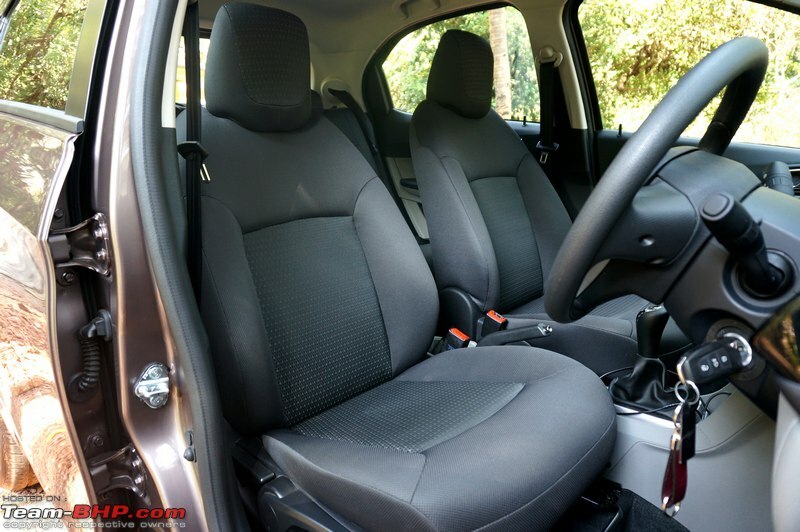 To be honest, the celerio comes across as a very average car and does not have so many features that the zica has! And the celerio really feels very flimsy when you look at the build quality, where zica seems to be much better! I really hope customers warm up to the idea of owning a Tata hatch that has no resemblance to the indica! Let me be the first to reply on this. As for Tata, this seems heart-felt and sincere effort to move away from cheap image. You guys don't give me a chance to give less than 5 stars! As and when I have to buy a car for my daughter, I have to consider this definitely. 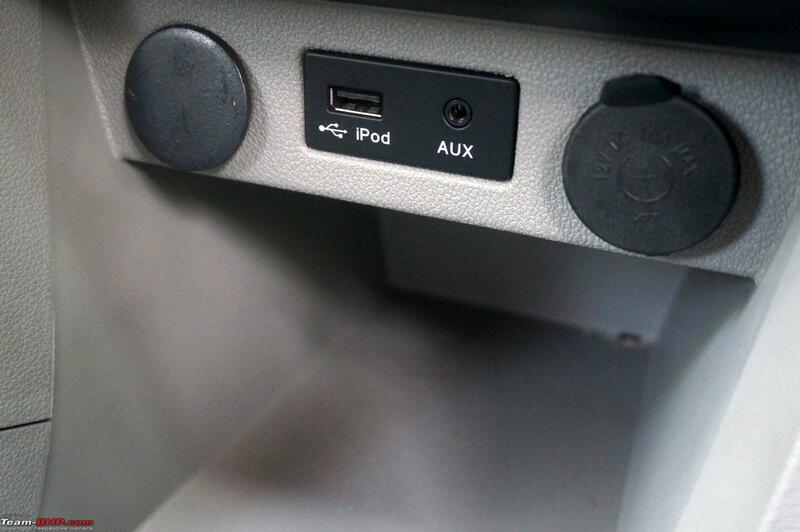 Of course, it will have to be an automatic! I guess the automatic will come! The trend seems clearly emerging - though slowly. Ahh! The most awaited review is here. Well, I must say that everyone at Tata looks to have put the effort. Now, the main point is pricing. If this is at the Celerio's price point, I'm stoked. 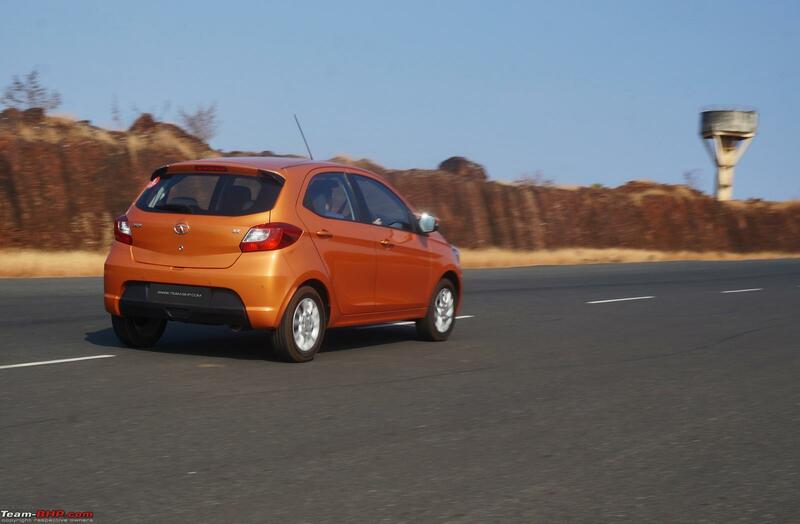 But if this is going at the Grand i10's price point, it will find some buyers too I guess. Great review as usual! I am proud that a home grown manufacturer is able to design and develop a throughly contemporary car like the Zica. I hope they price it well and the market accepts it. All times are GMT +5.5. The time now is 18:21.